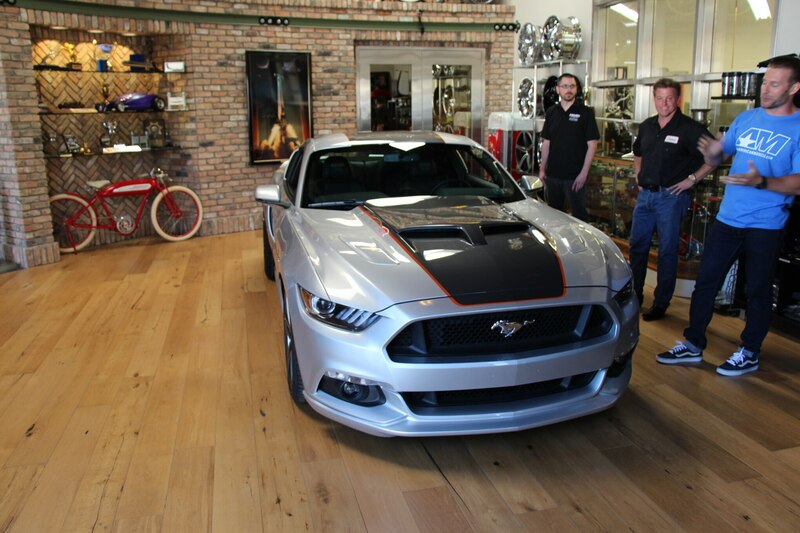 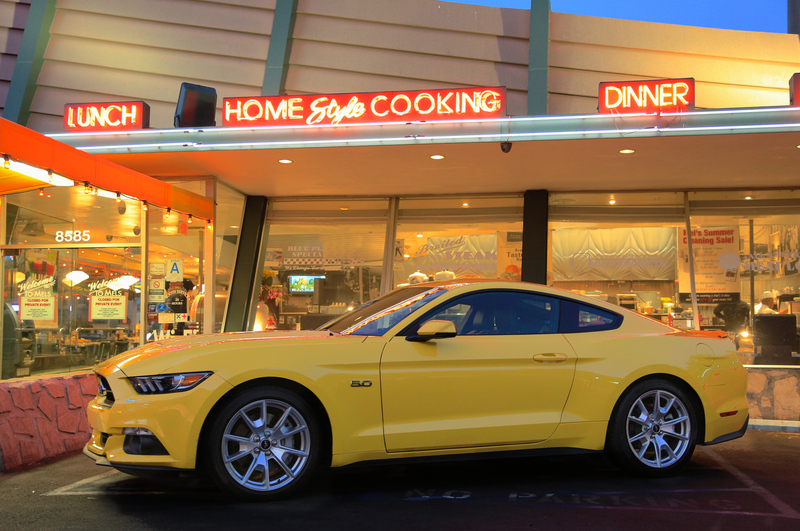 West Hollywood, California—The 2015 Ford Mustang comes to life in the parking lot of Mel’s Drive-in, a retro-style place in Hollywood where you can still feel the 1960s. 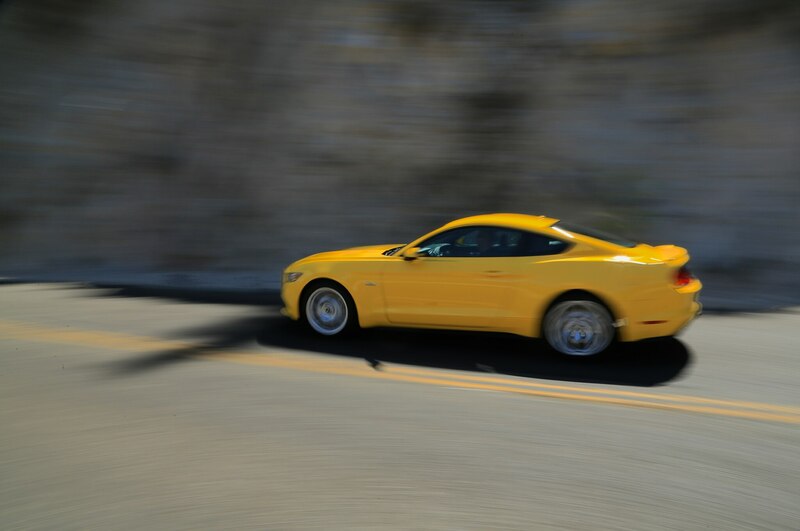 With the car eager underneath our throttle foot, we turn right on Sunset Boulevard and drive away from Mel’s as fast as we can. 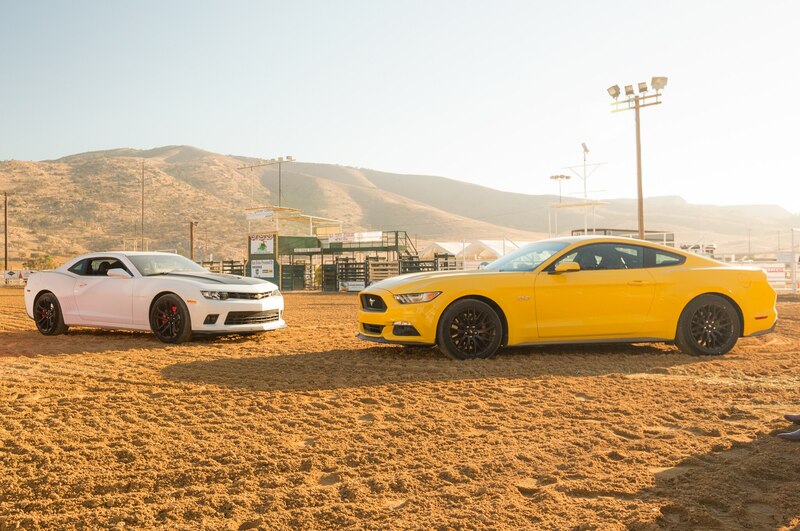 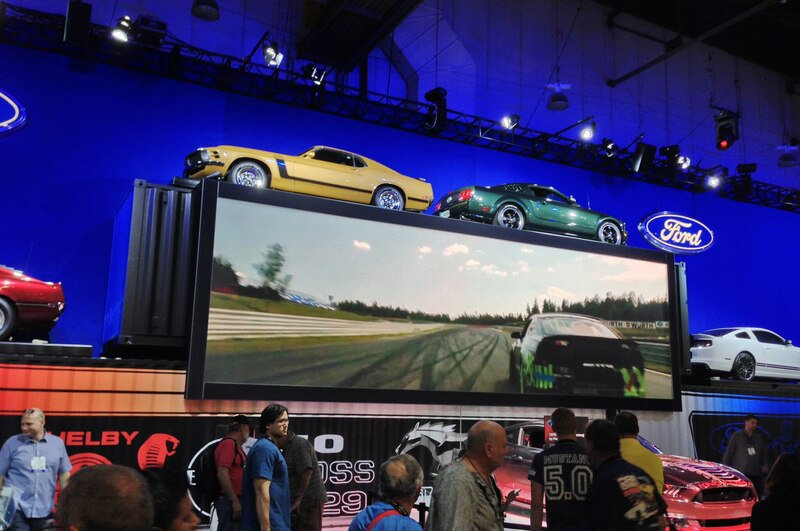 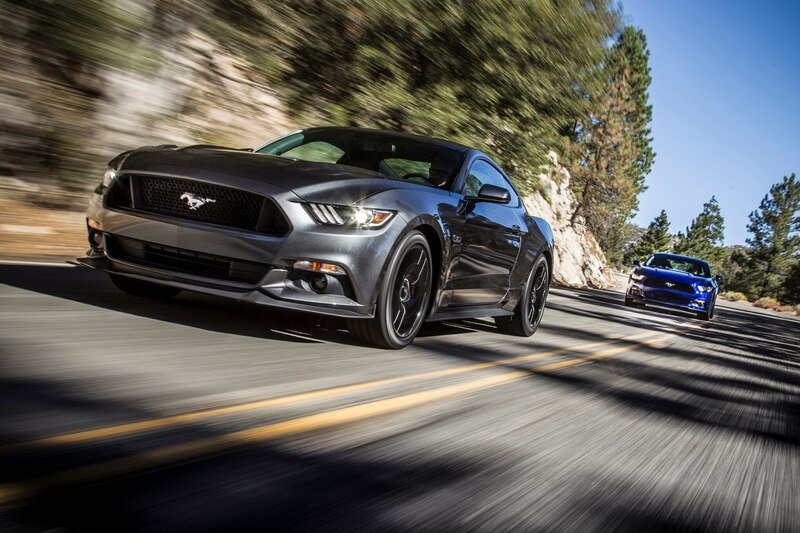 The Ford Mustang doesn’t belong to the past anymore, and so we figured it was time to leave the vicinity. 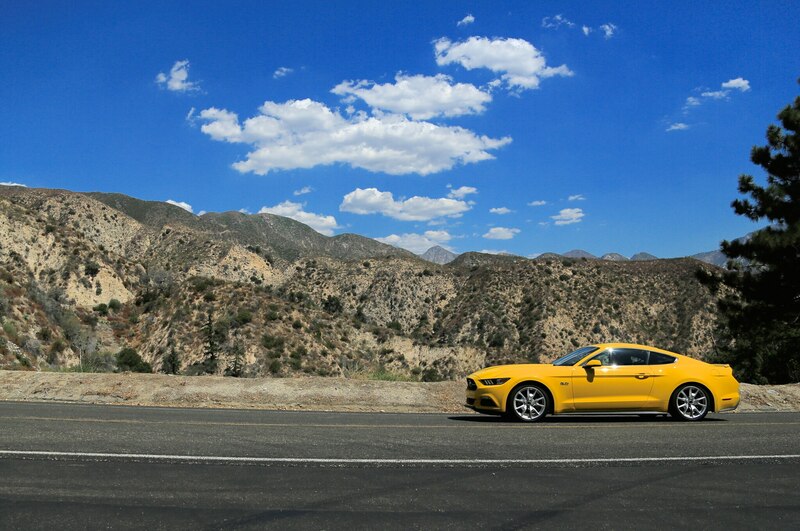 This being Los Angeles, we don’t get far from Mel’s before we get bogged down in traffic. 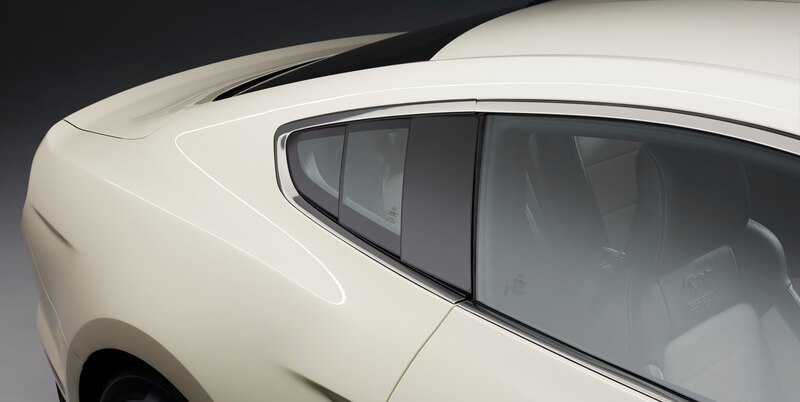 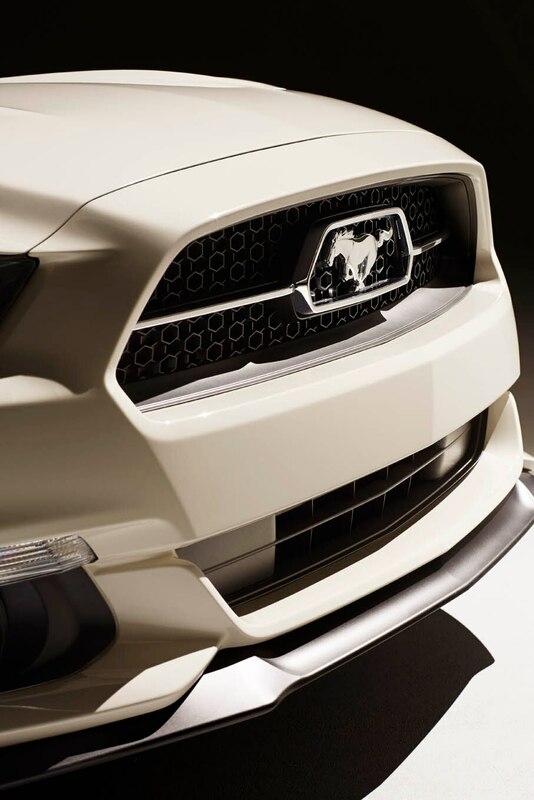 This isn’t necessarily a bad thing, as the Mustang’s sleek new shape with its tightly fitted greenhouse looks like it belongs here among the glamorous cars that choke Sunset Boulevard at all hours of the day or night. 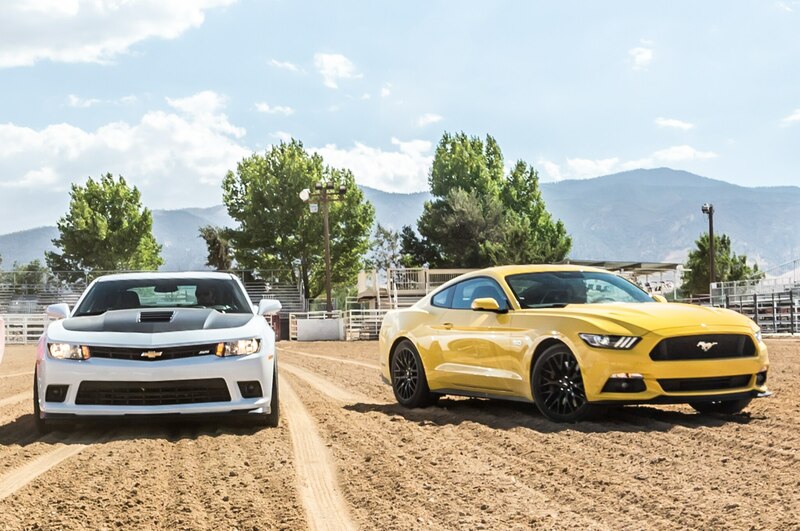 No one looks at us as if we should be at cruise night someplace in the San Fernando Valley. 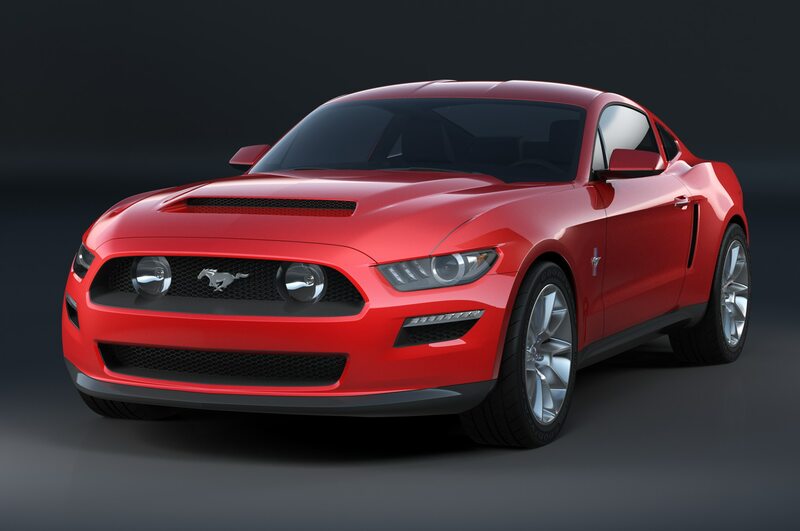 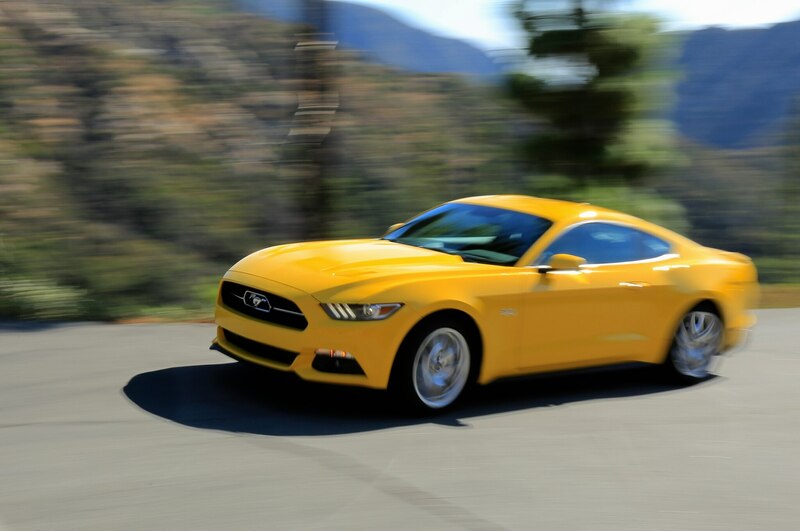 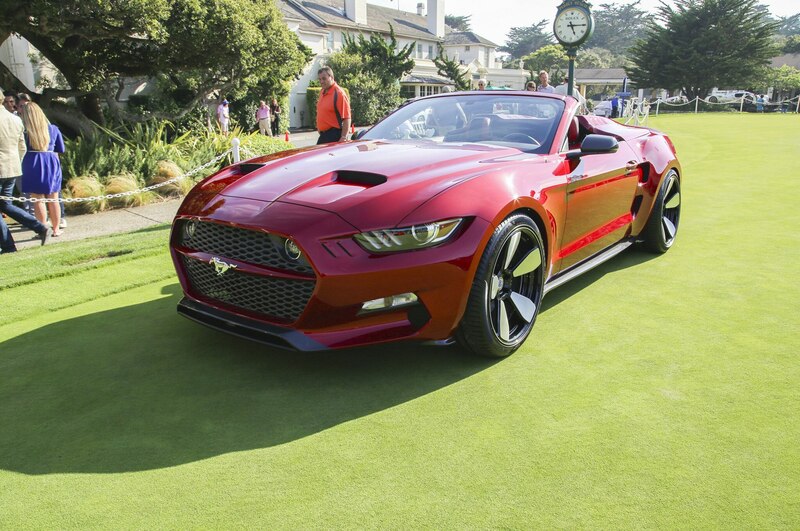 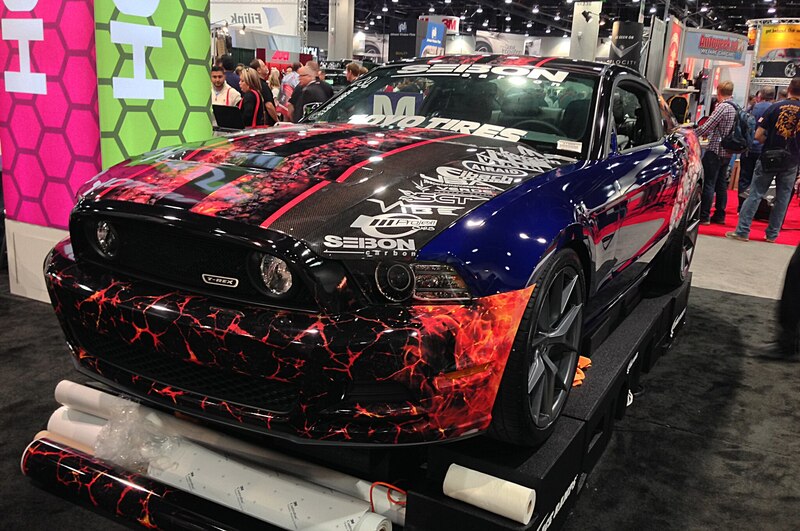 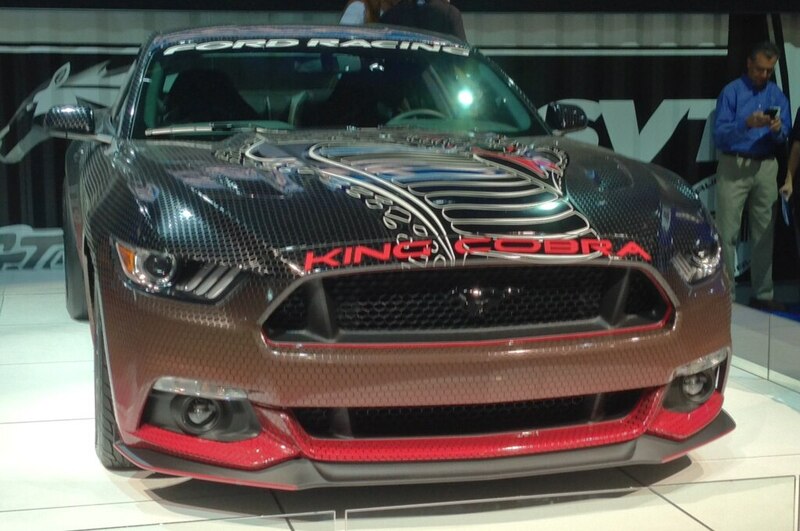 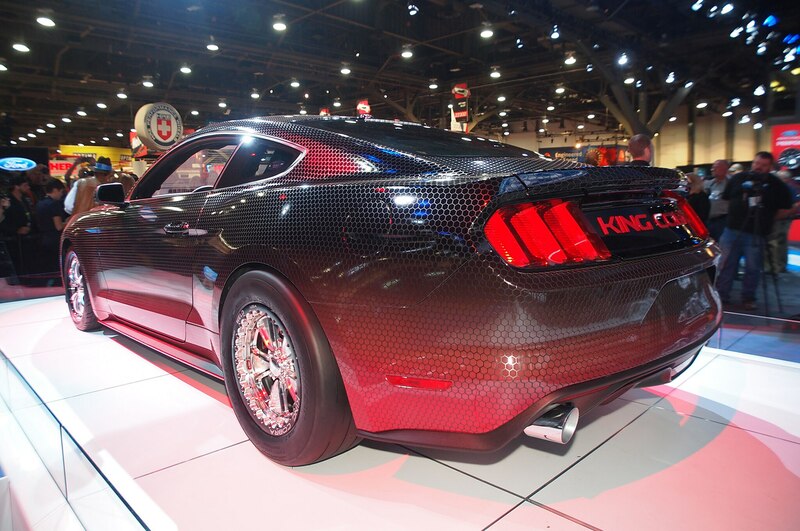 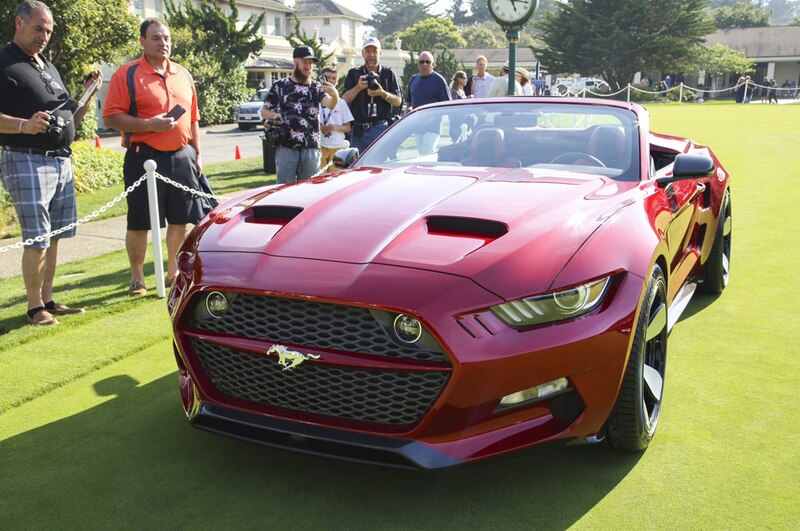 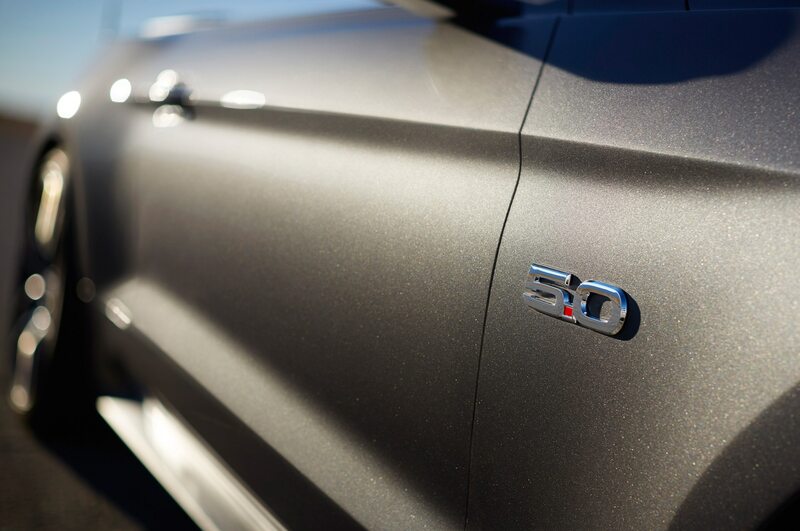 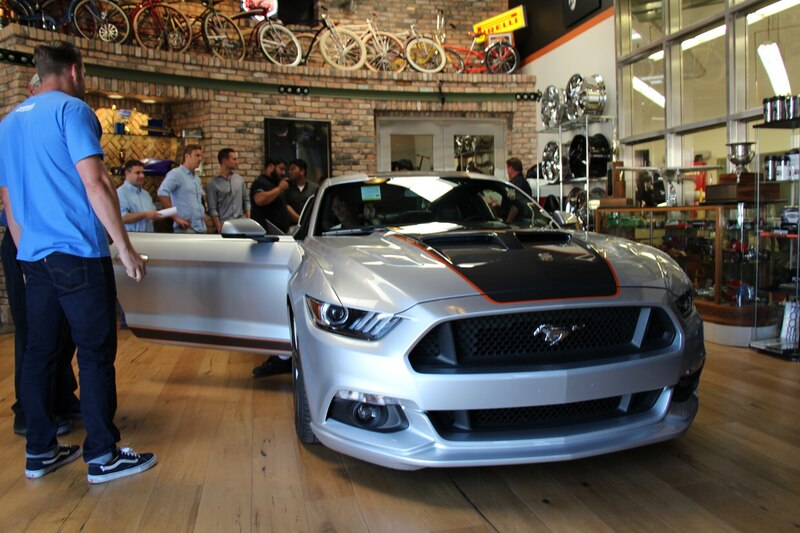 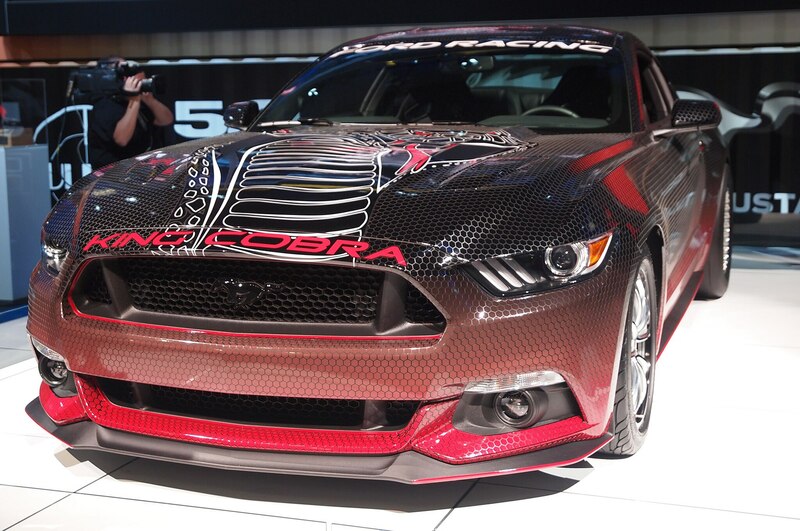 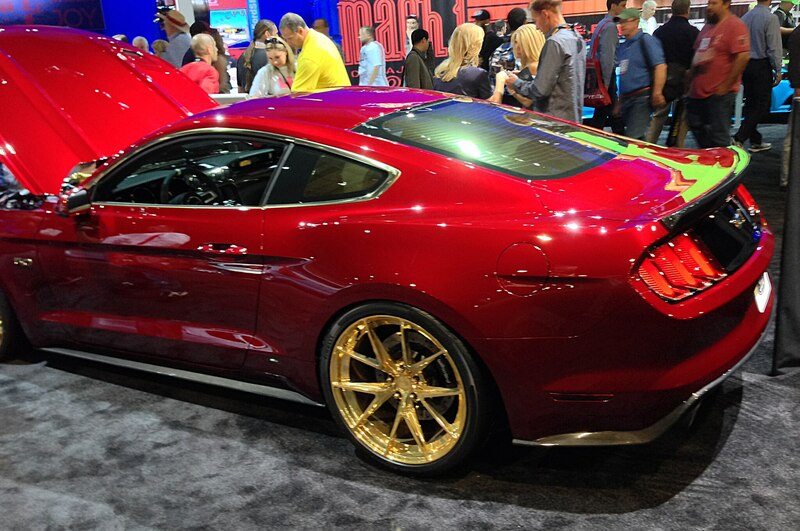 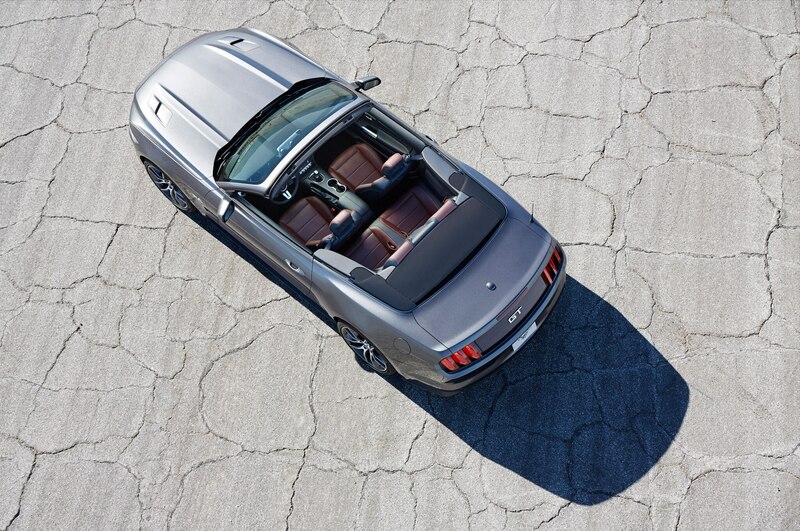 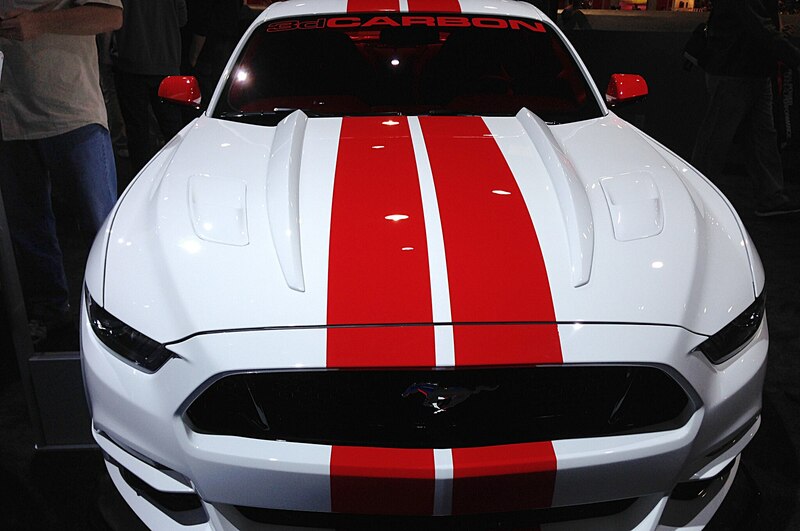 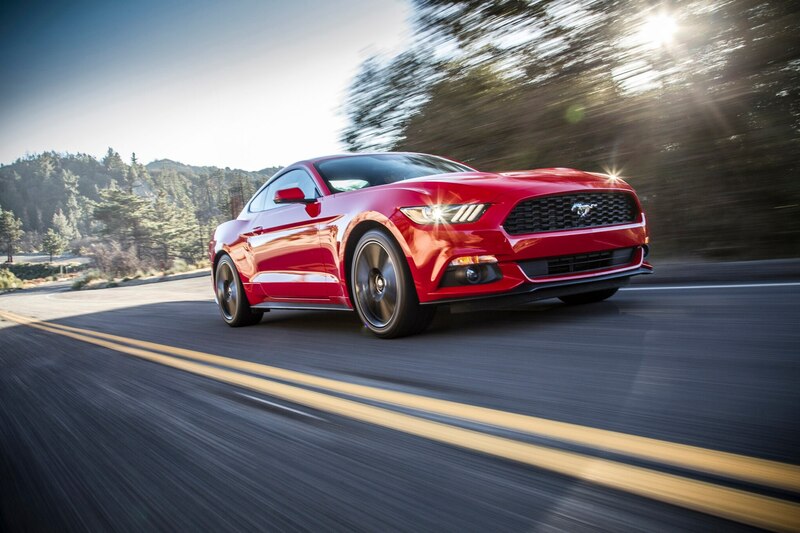 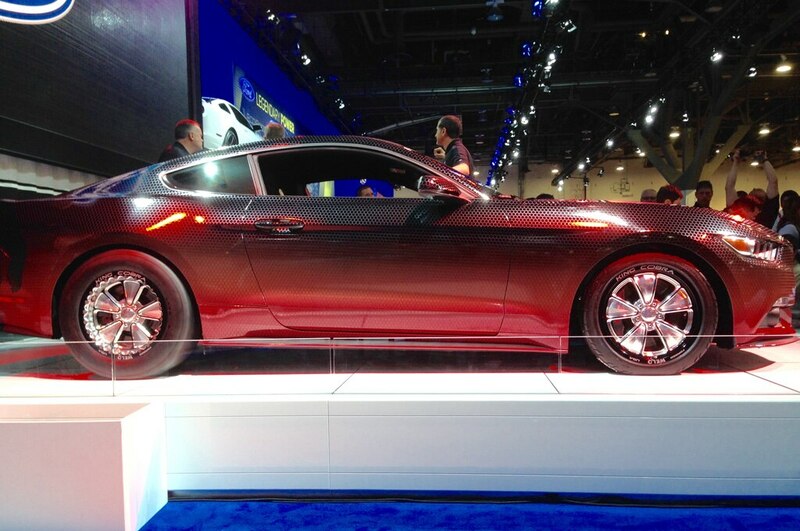 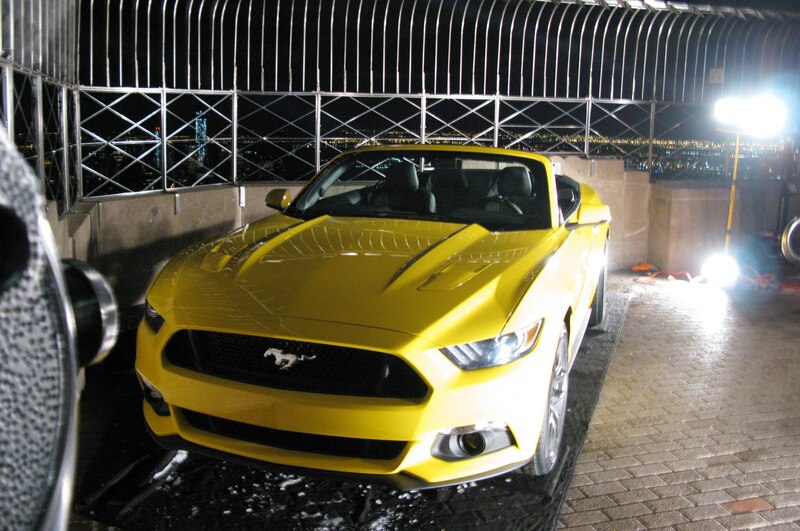 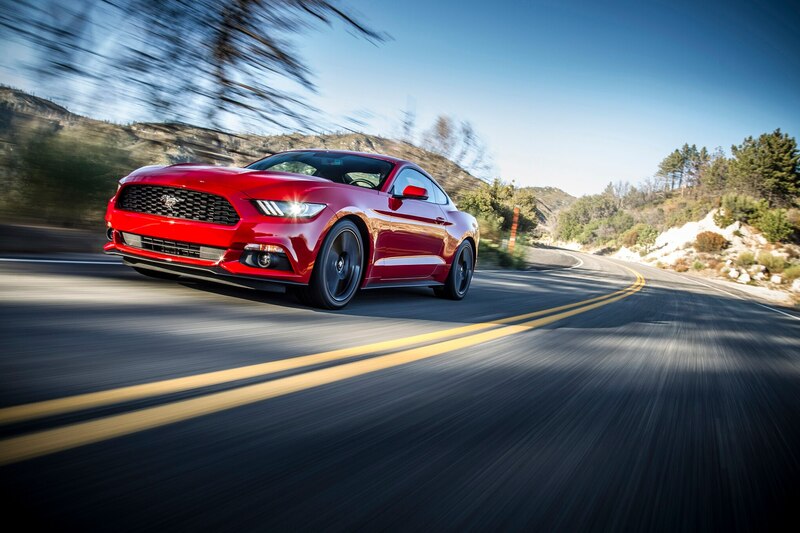 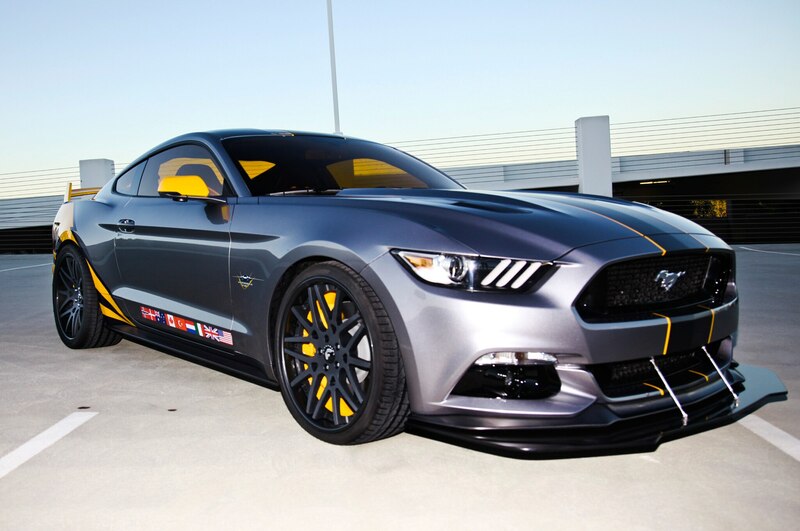 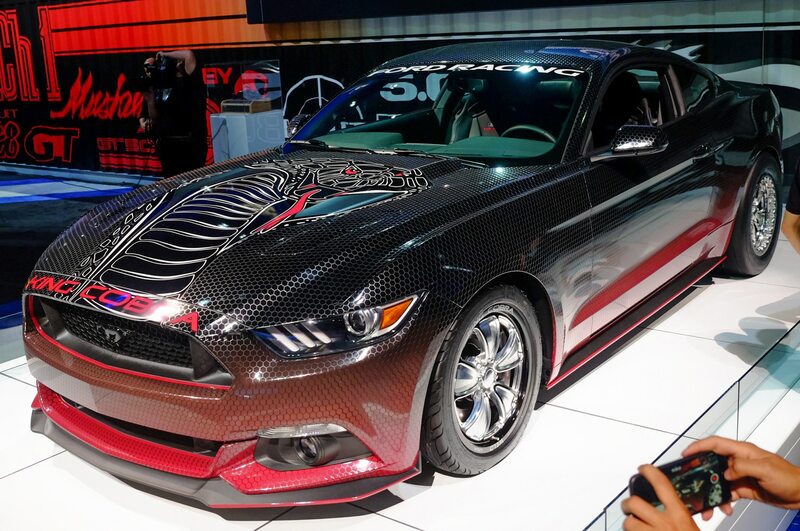 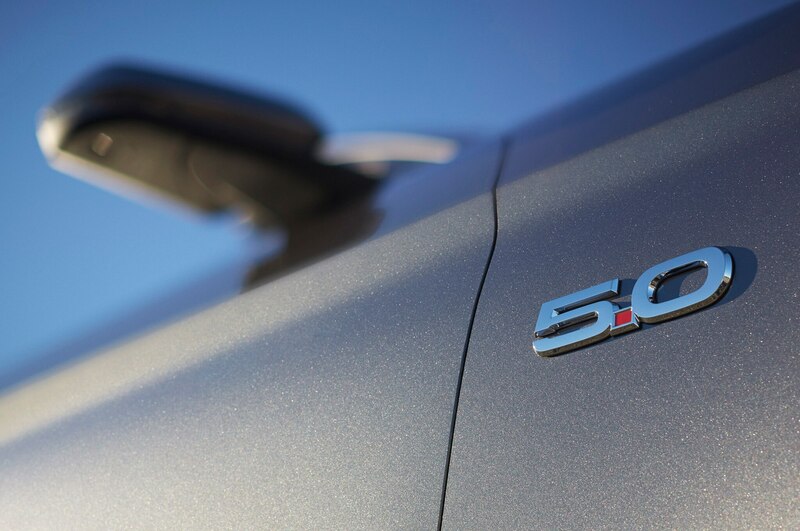 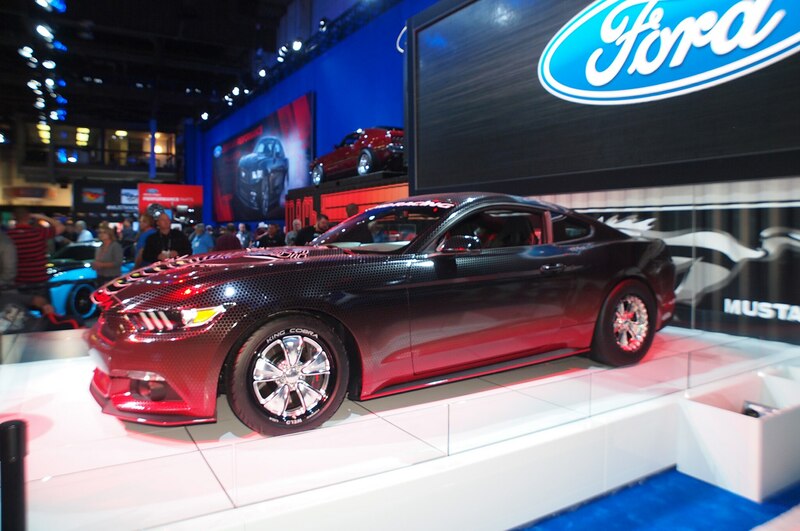 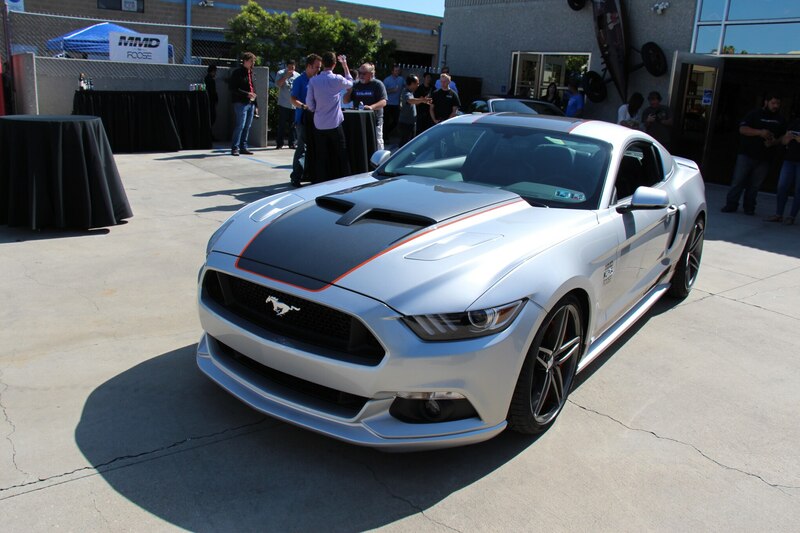 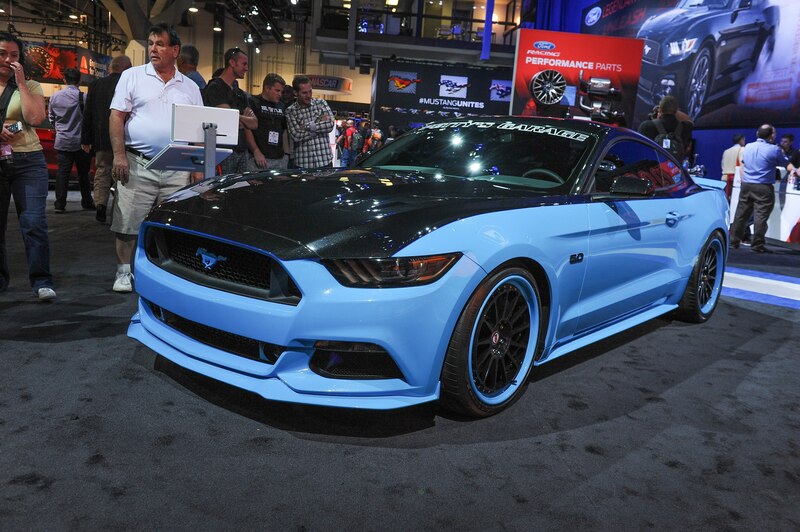 Unlike any Mustang from the past, the 2015 car swims through stop-and-go traffic painlessly. 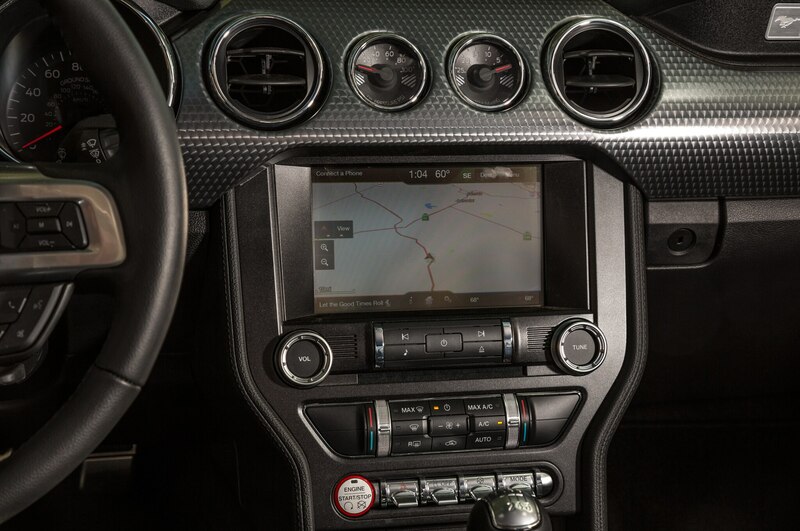 First of all, you can see where you’re going, as the instrument panel and the window sills are fairly low. 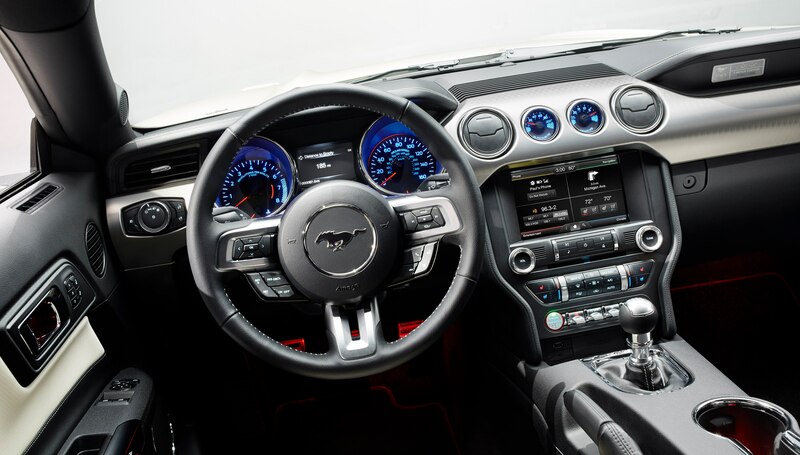 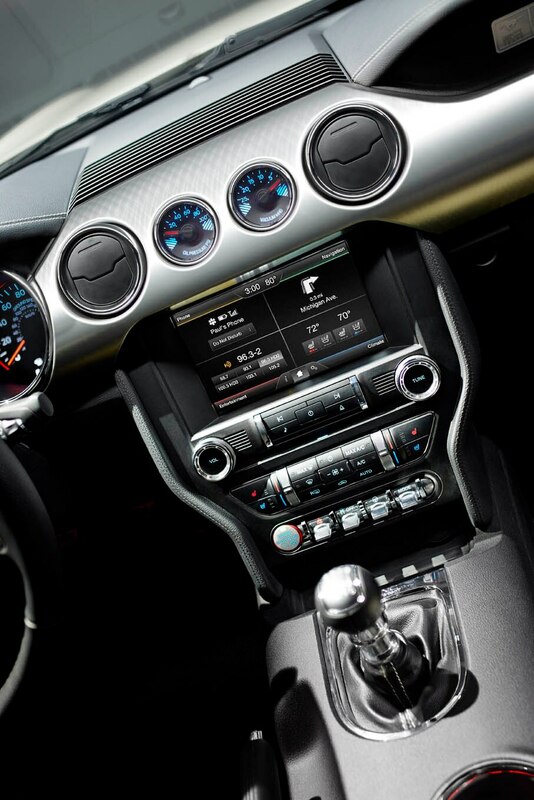 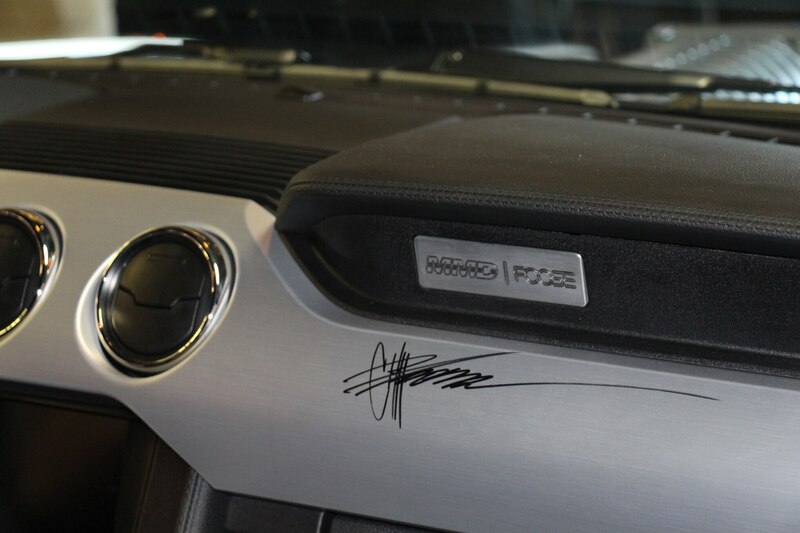 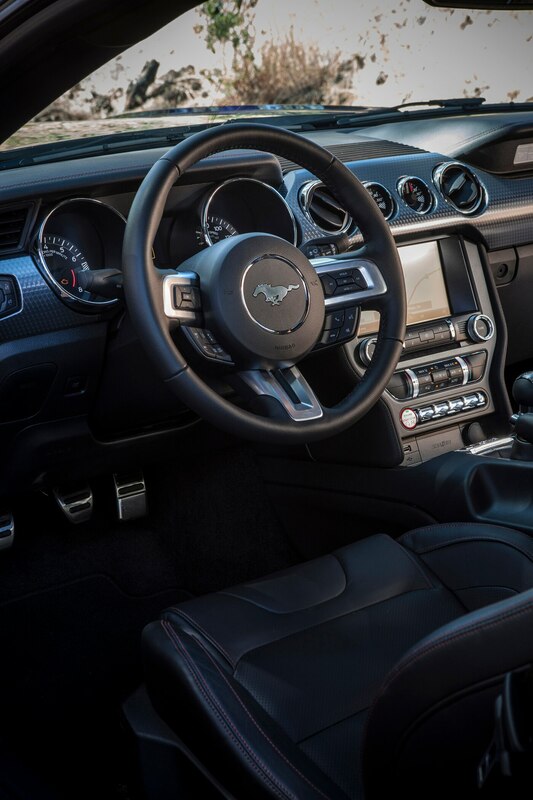 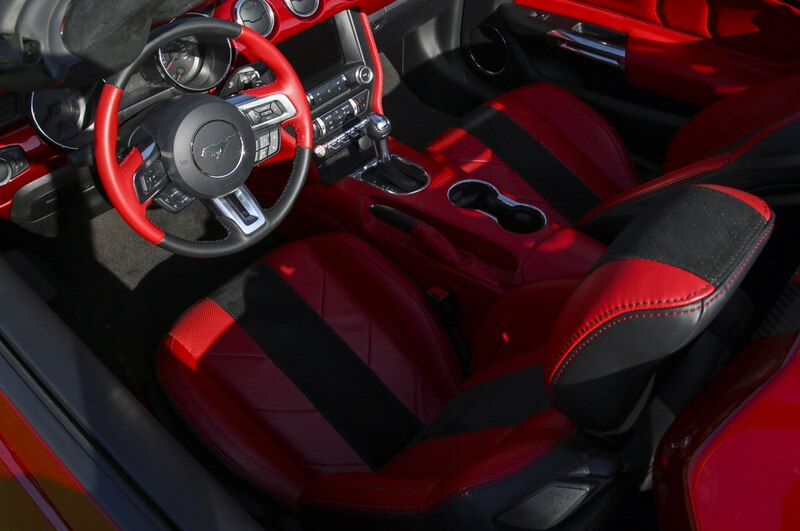 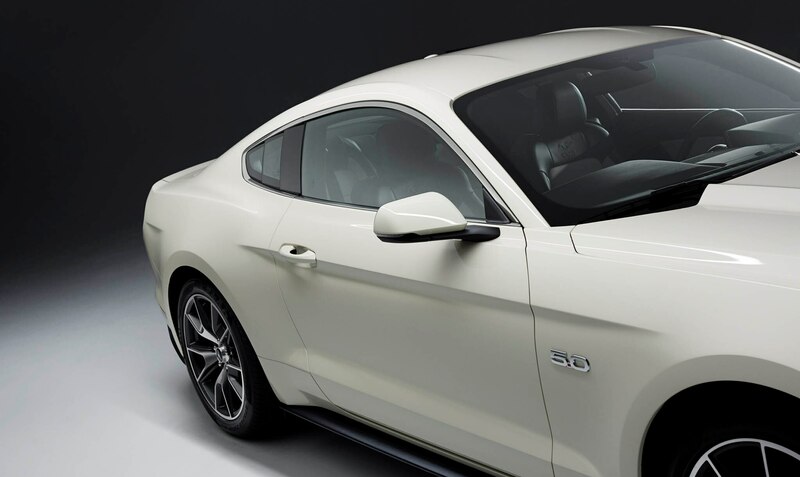 In addition, you have technology on your side in close quarters, because this 2015 Ford Mustang 5.0 offers forward-collision warning and impact mitigation with adaptive cruise control, blind-spot warning with cross-traffic alert and rear parking sensors as option packages on top of the 5.0’s Premium Package. 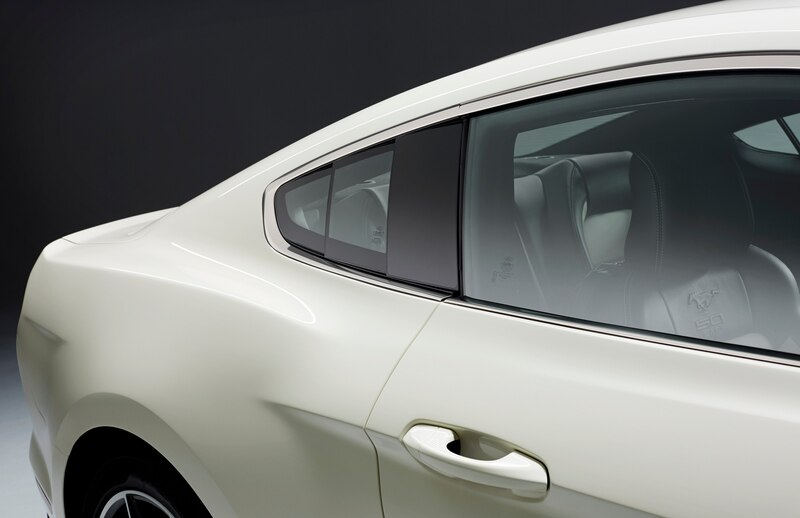 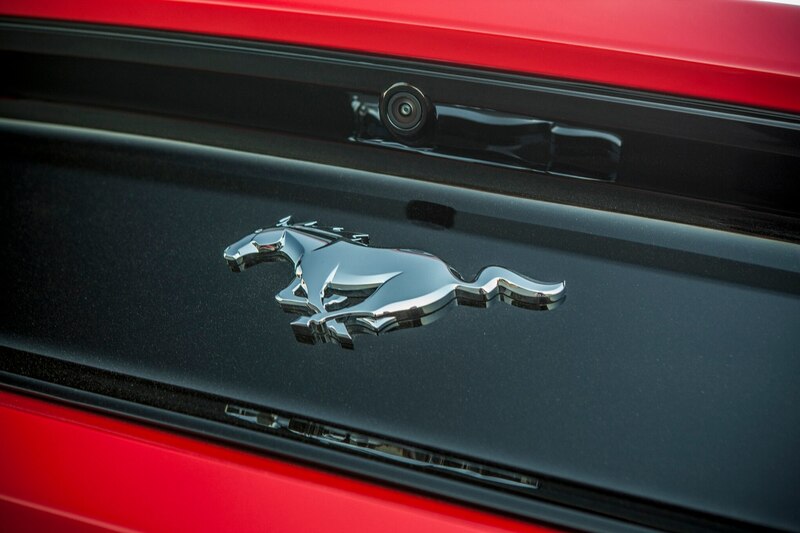 A rear-view camera is standard on all models. 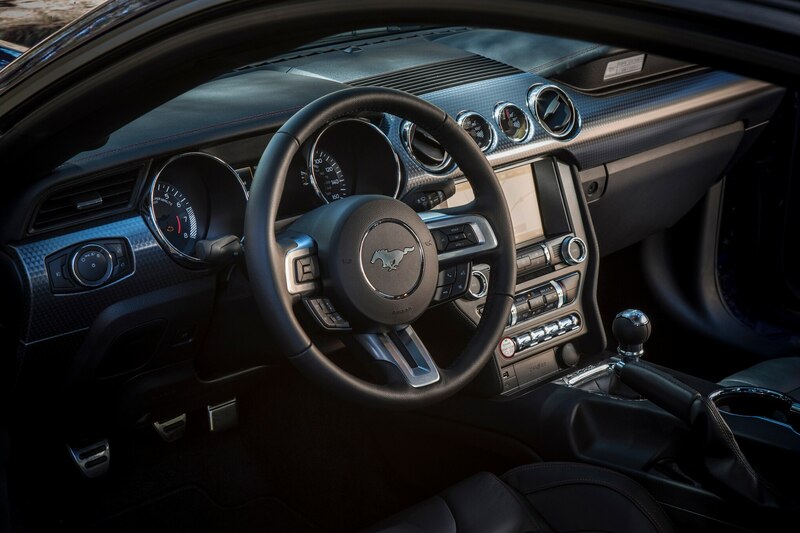 Even in traffic, you’re aware that this Mustang GT has a beast within, since there’s no other way to describe a 435-hp 5.0-liter V-8 matched with a six-speed manual transmission. 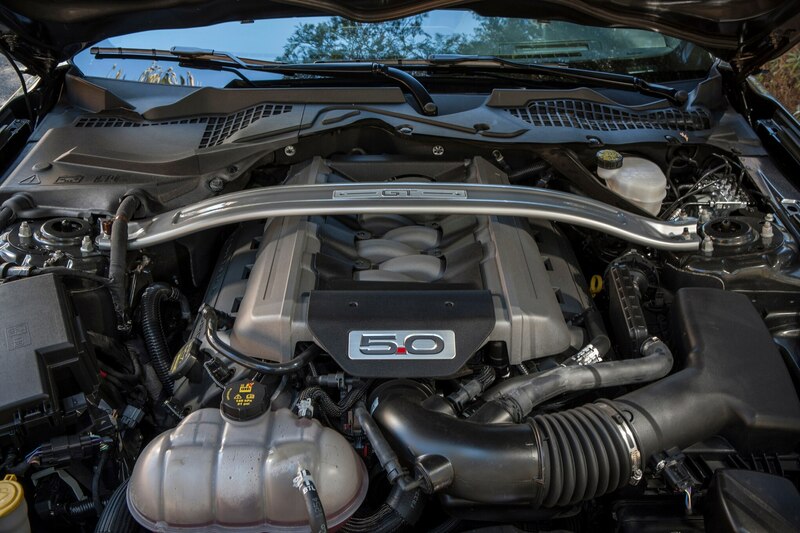 Fortunately, this powertrain has been to charm school. 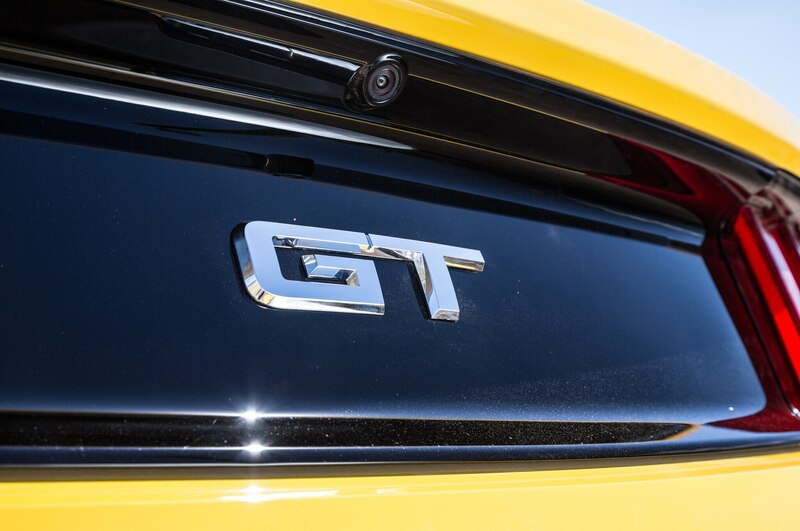 The engine’s docile personality at low rpm, the slick short-throw shift linkage of the Getrag-built gearbox, and the smooth clutch take-up combine to help you drive like a pro. 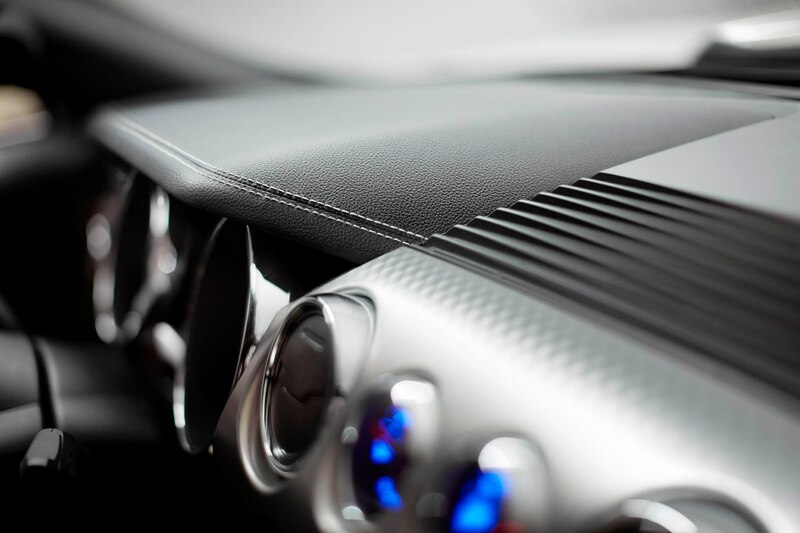 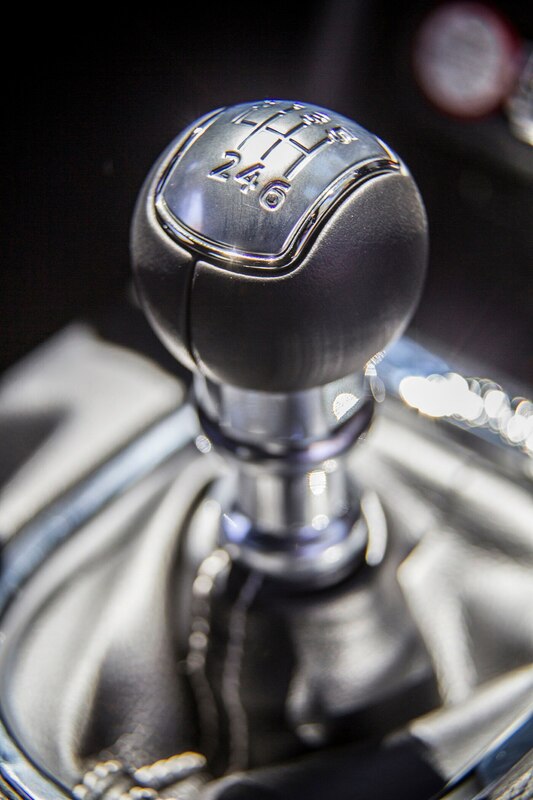 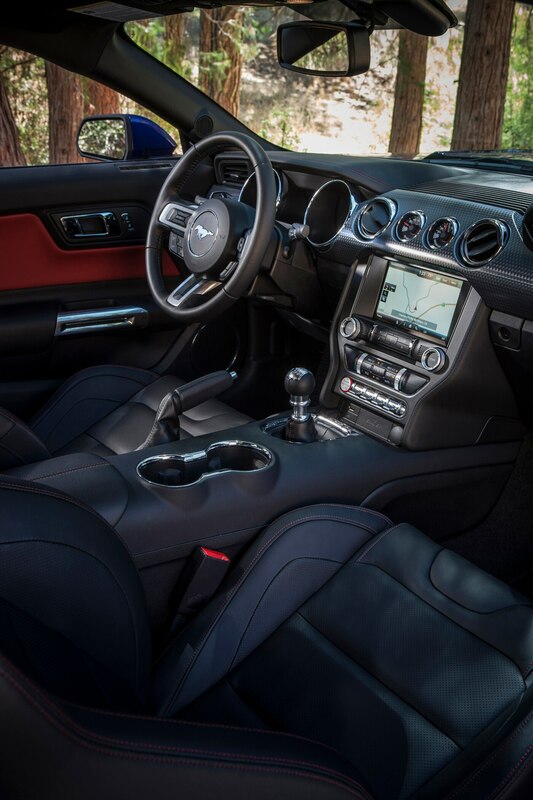 You can make the shift from first to second gear so seamlessly that your passenger’s head will barely bobble. 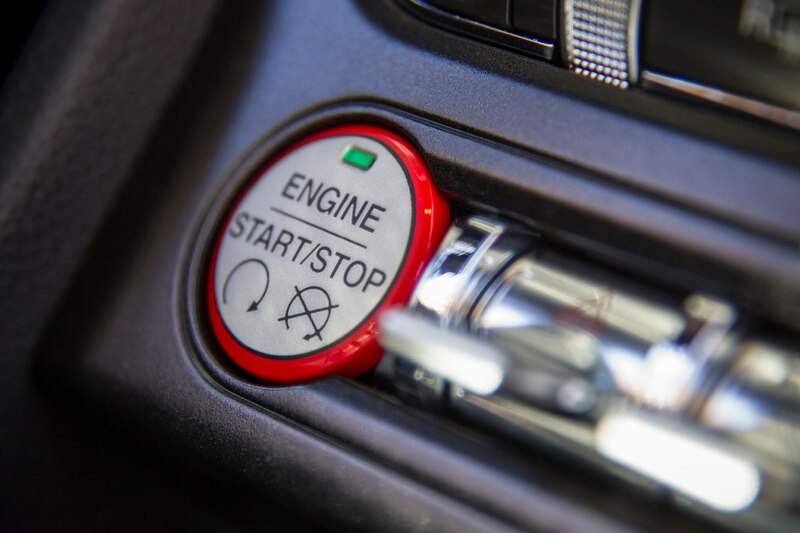 And if you come to a bad place where the nose of the car points skyward at a stoplight, hill-start assist takes care of your getaway. 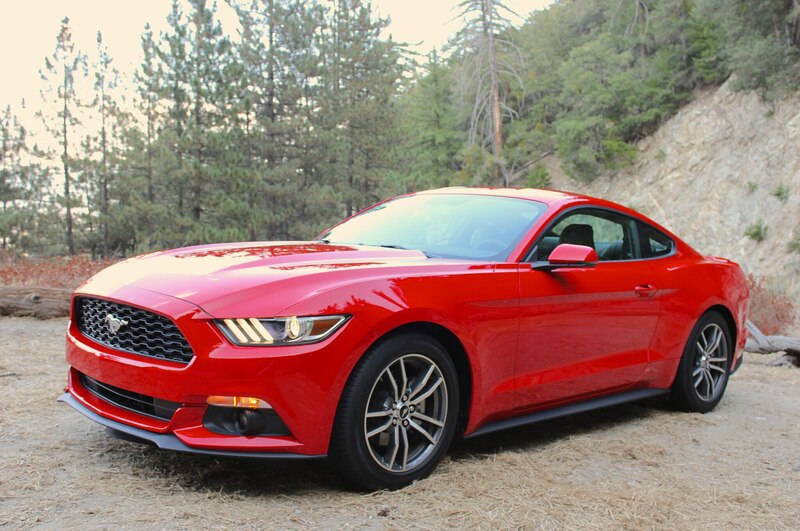 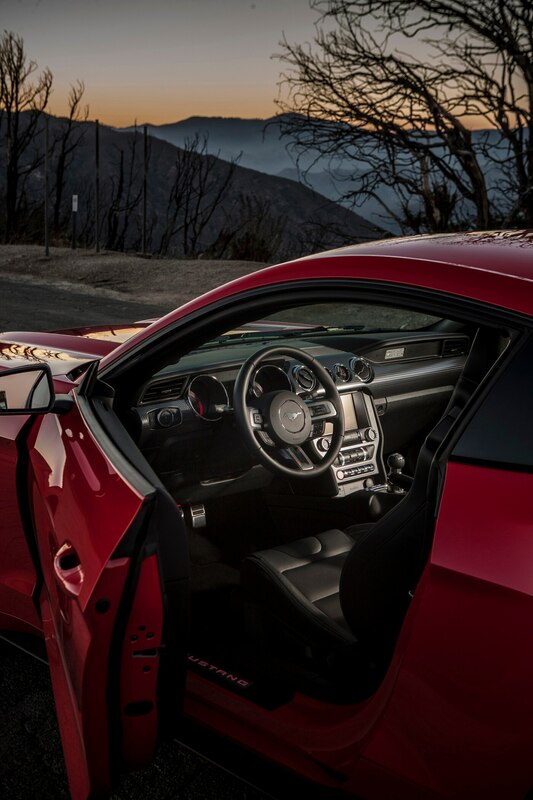 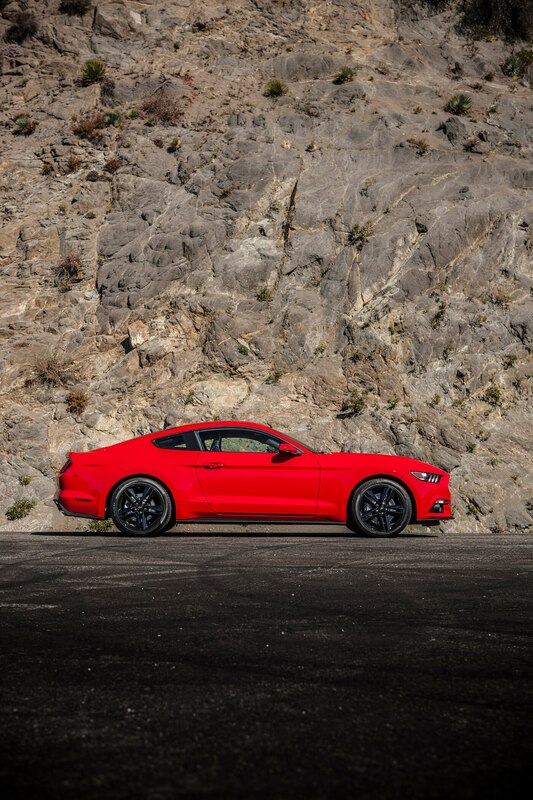 There’s no reason to drive any Mustang slowly for too long, so we soon break out of town and head for the San Gabriel Mountains bordering L.A. 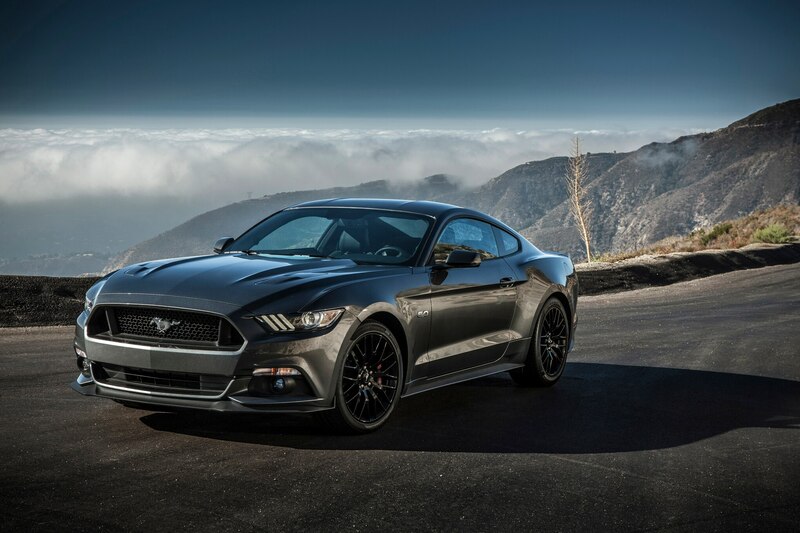 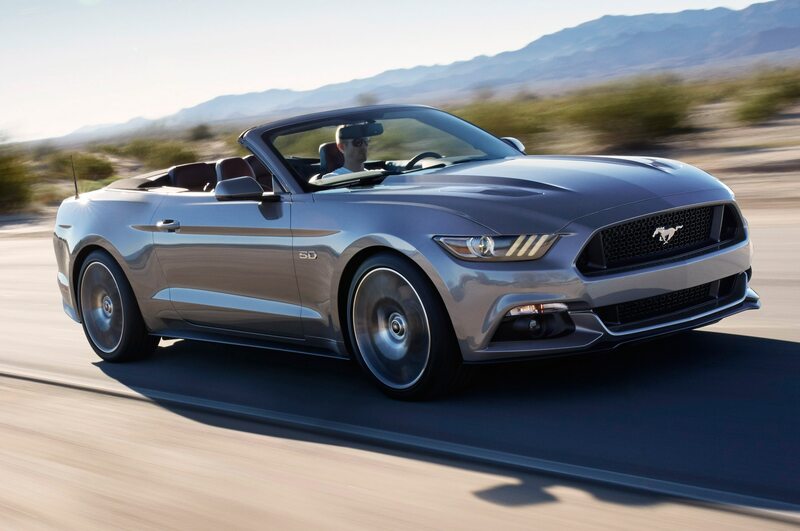 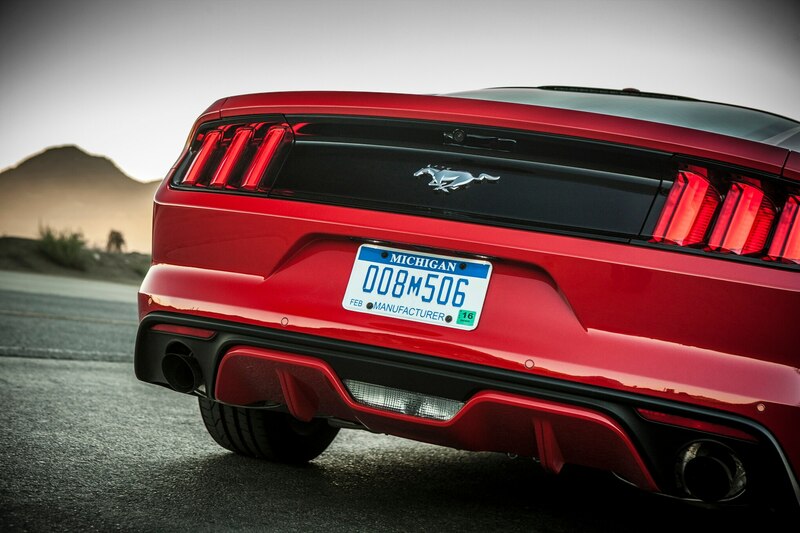 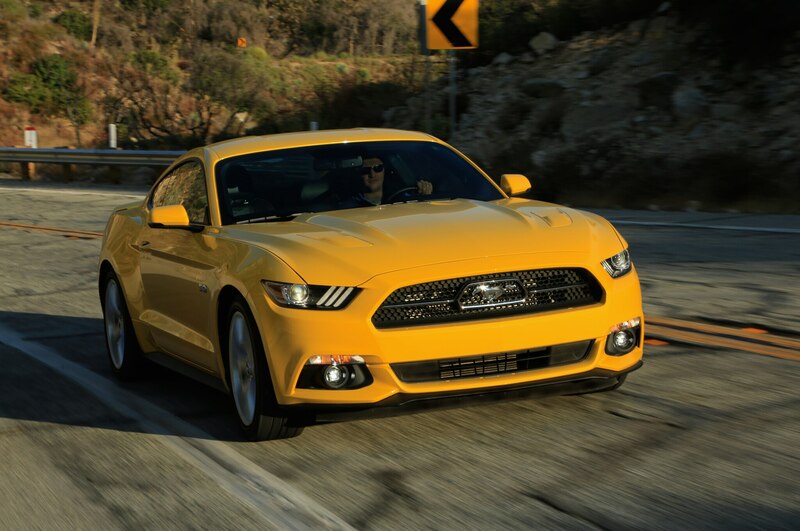 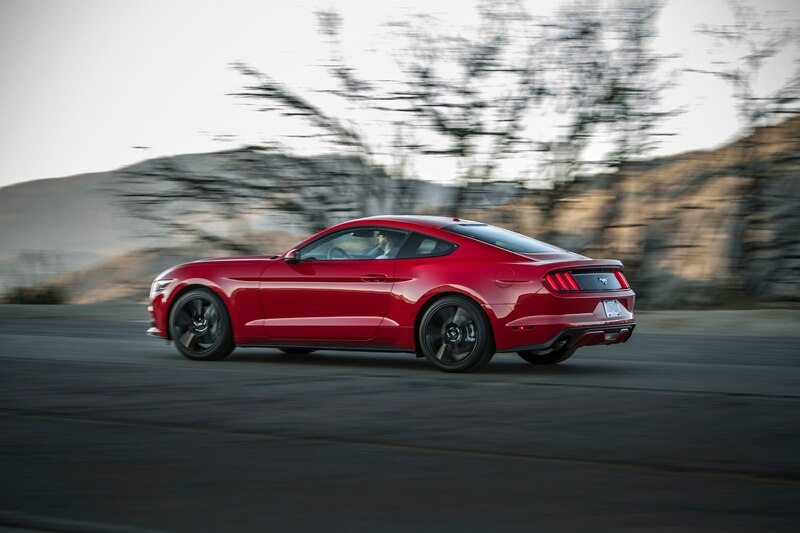 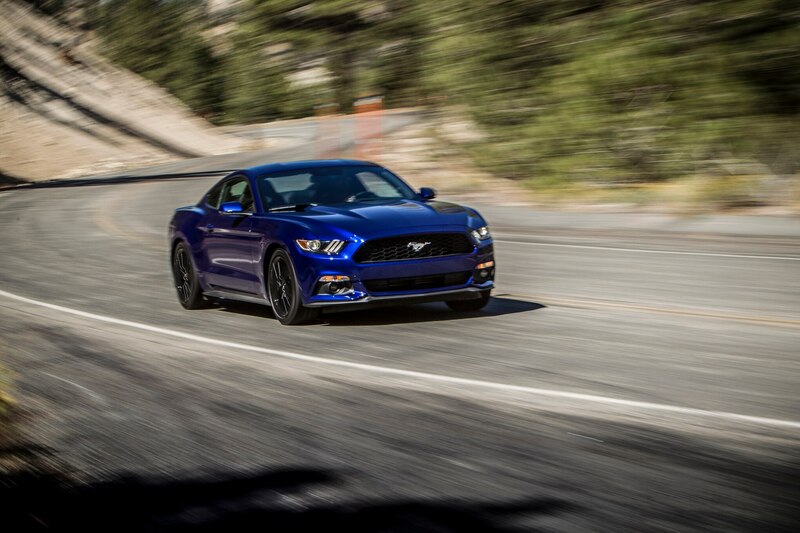 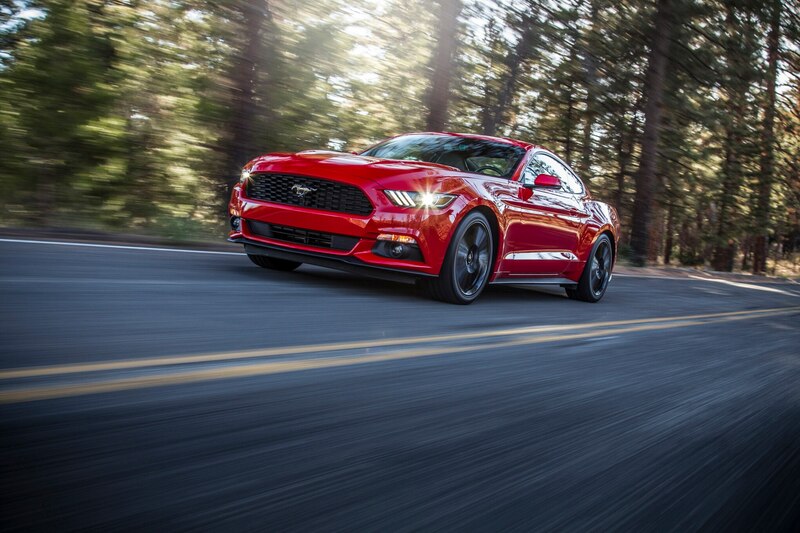 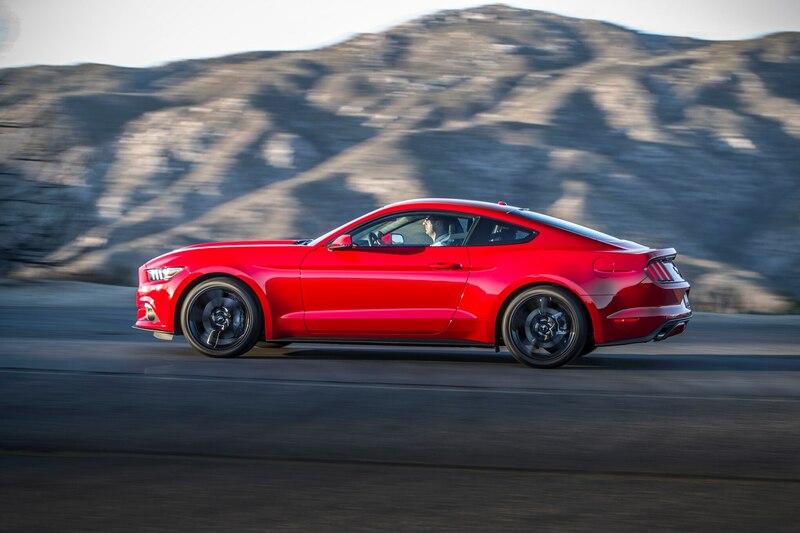 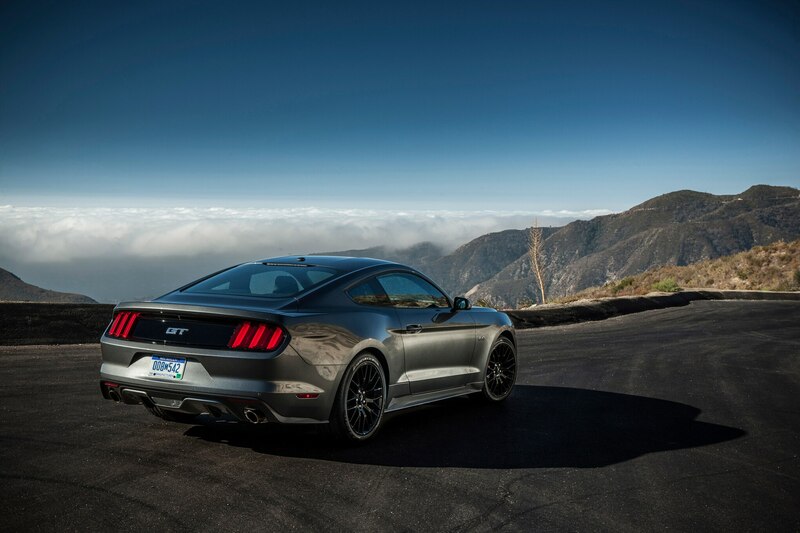 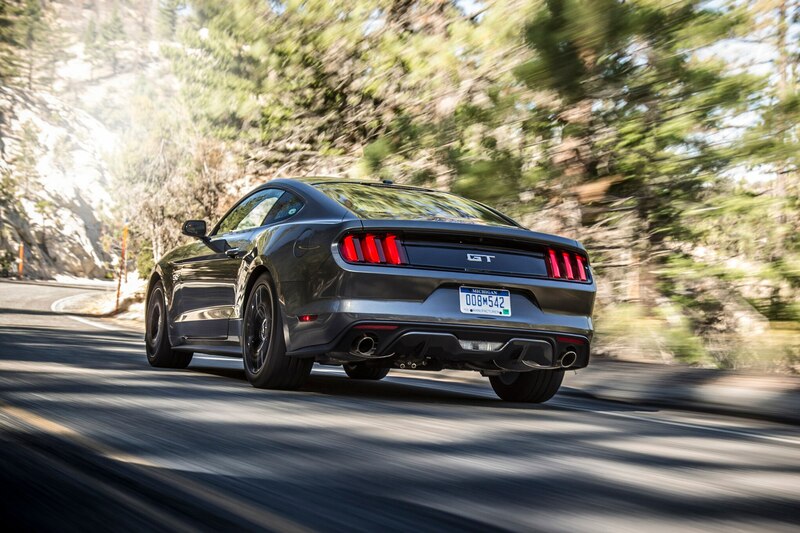 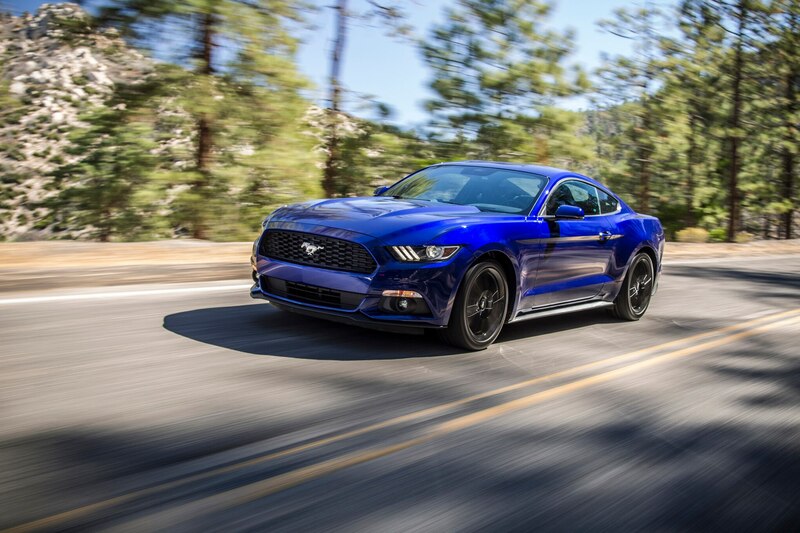 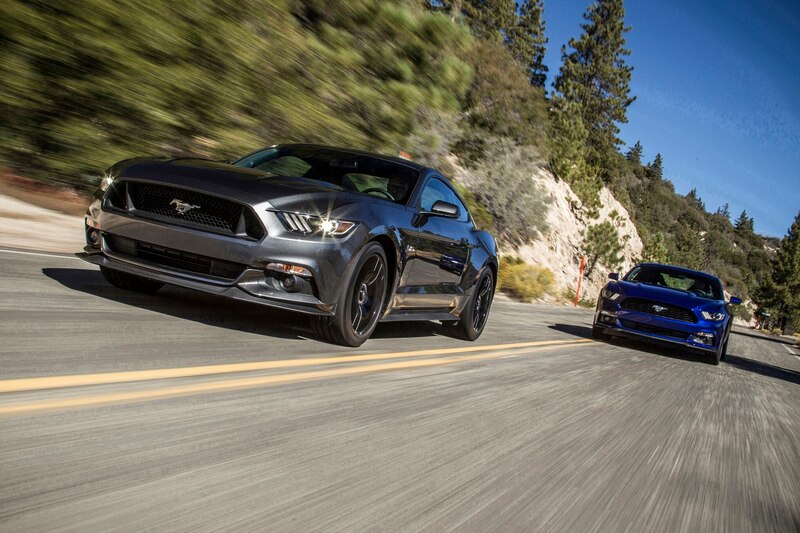 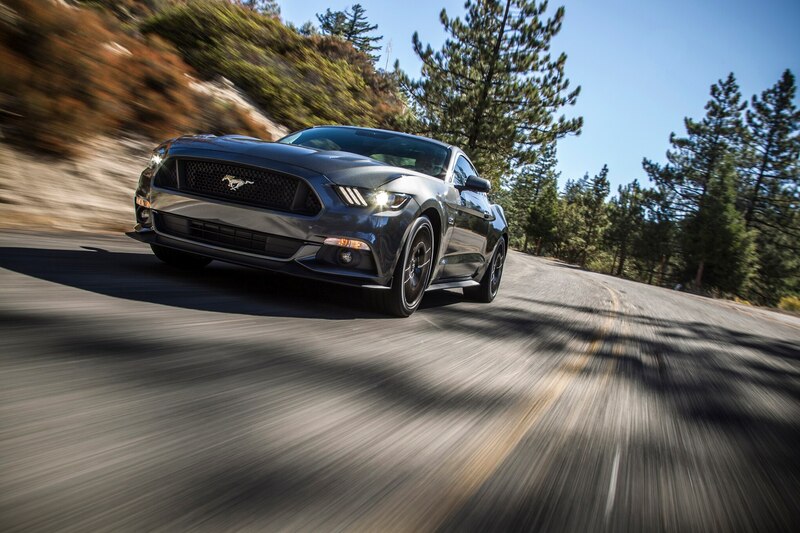 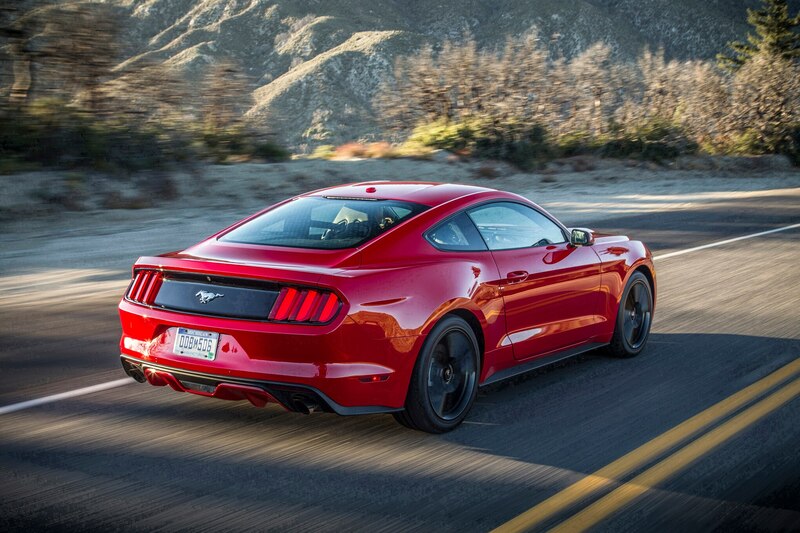 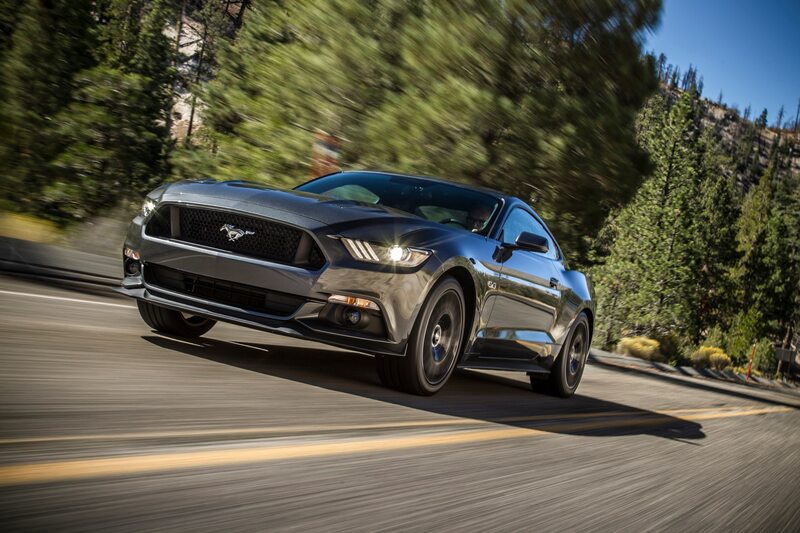 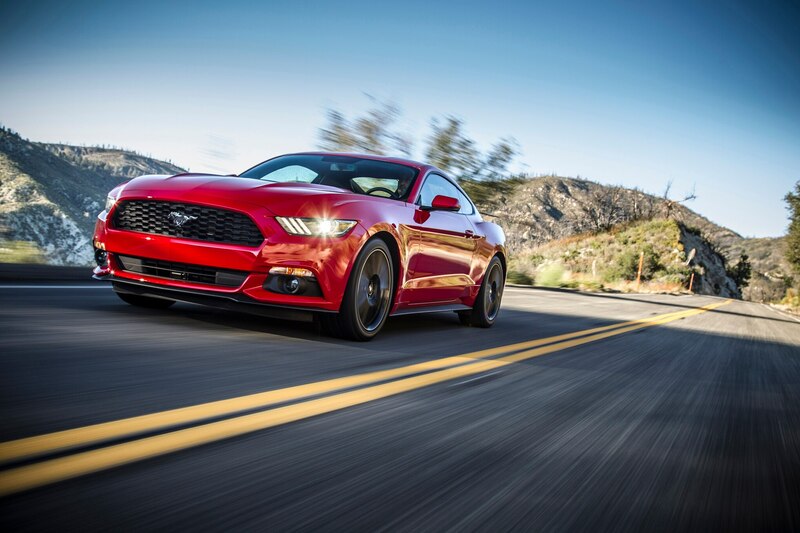 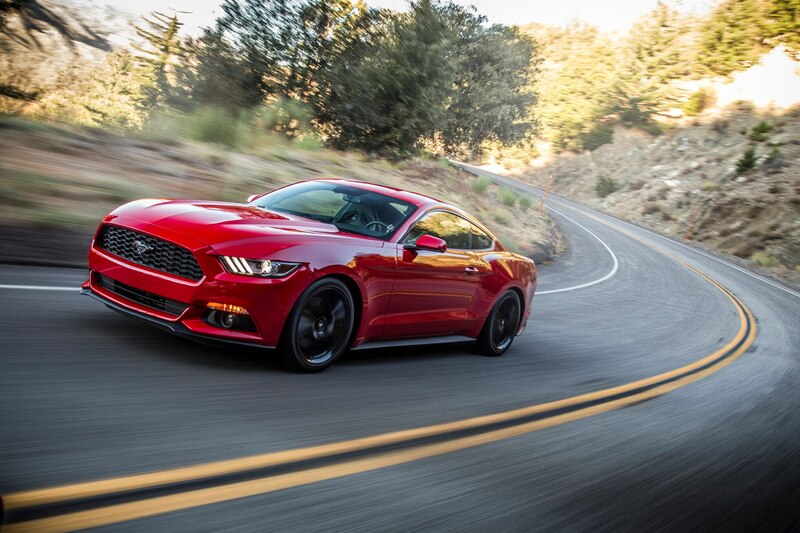 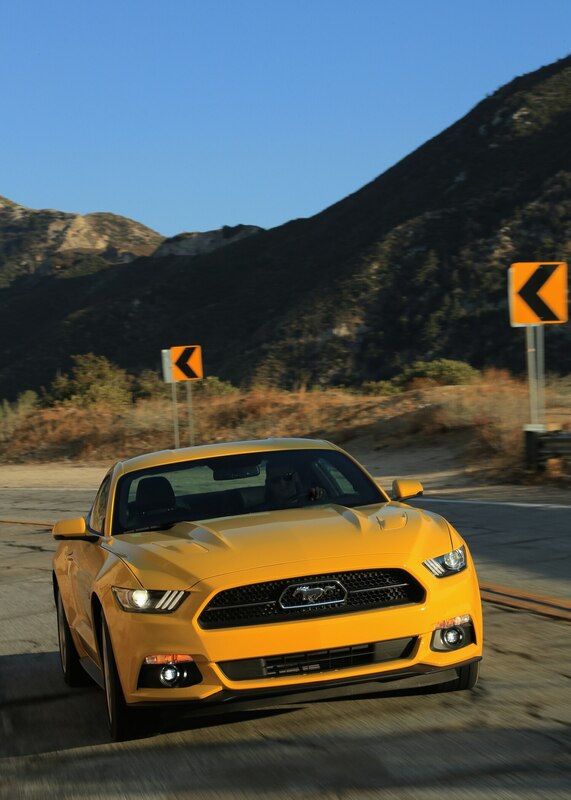 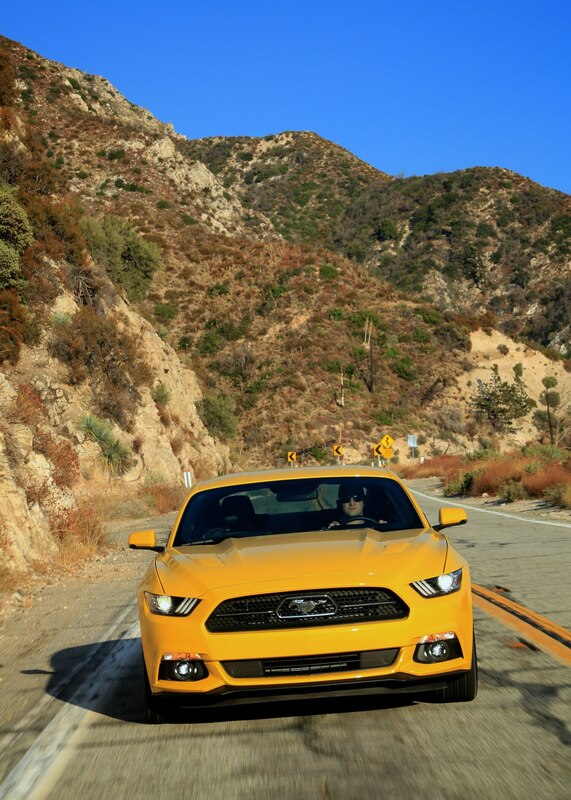 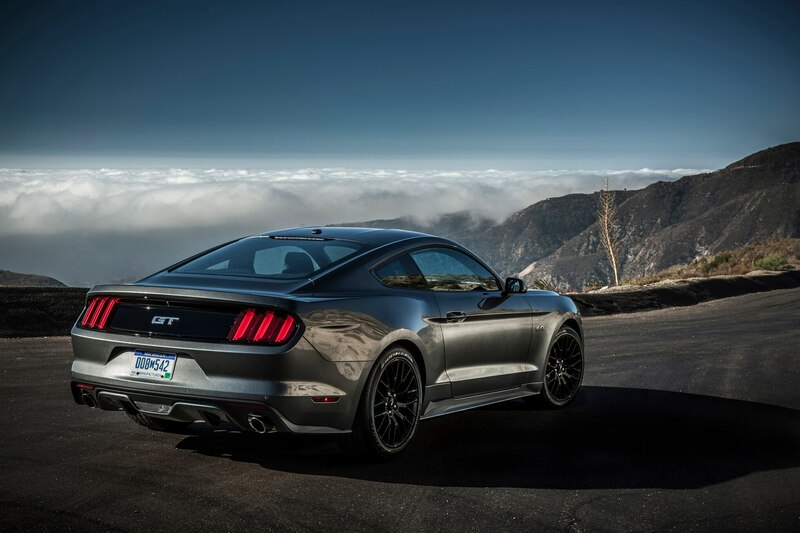 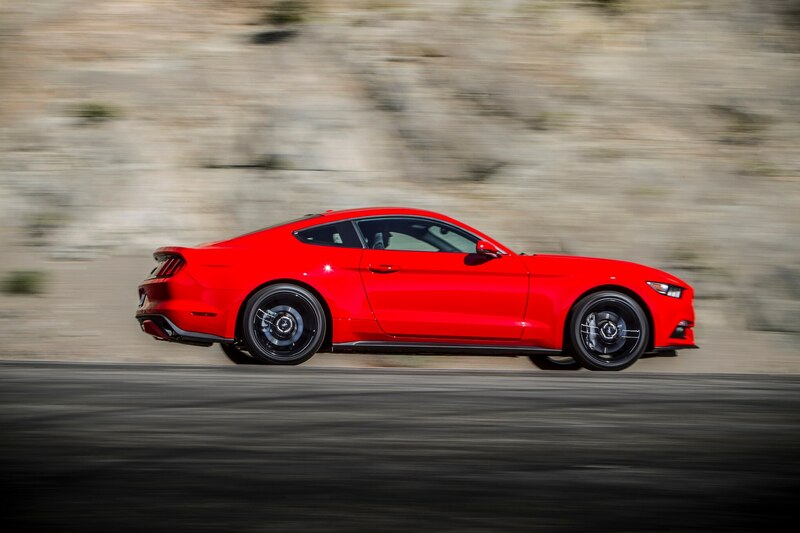 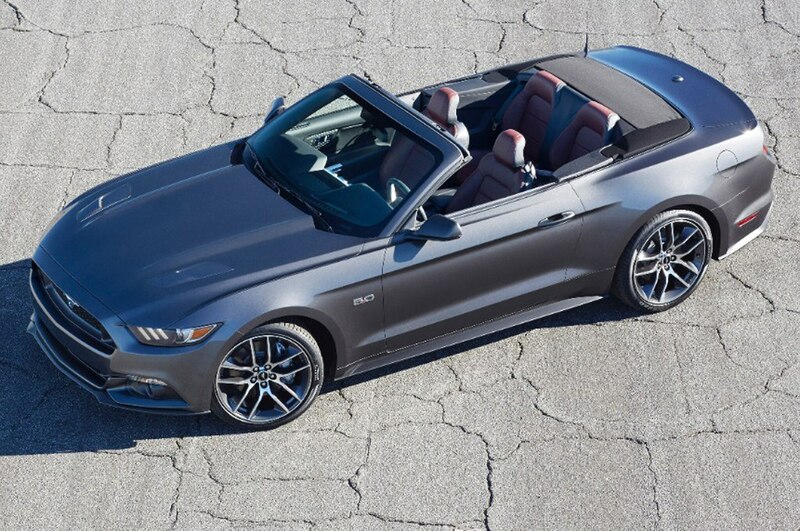 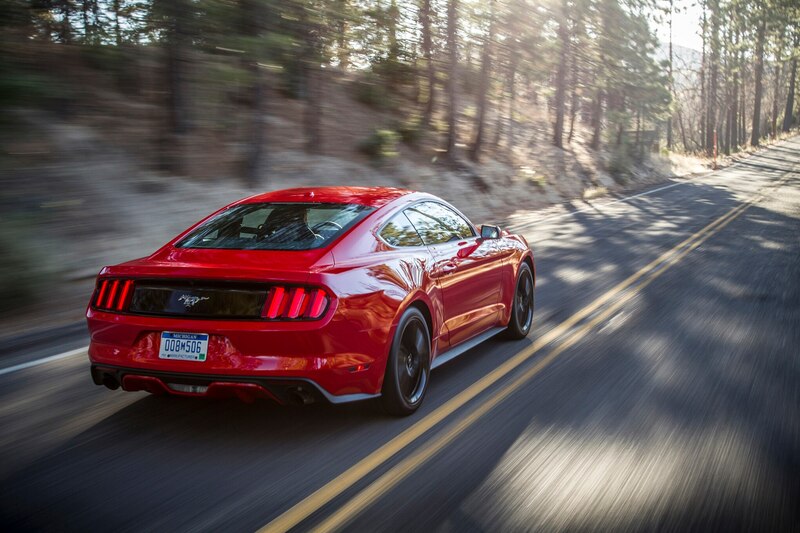 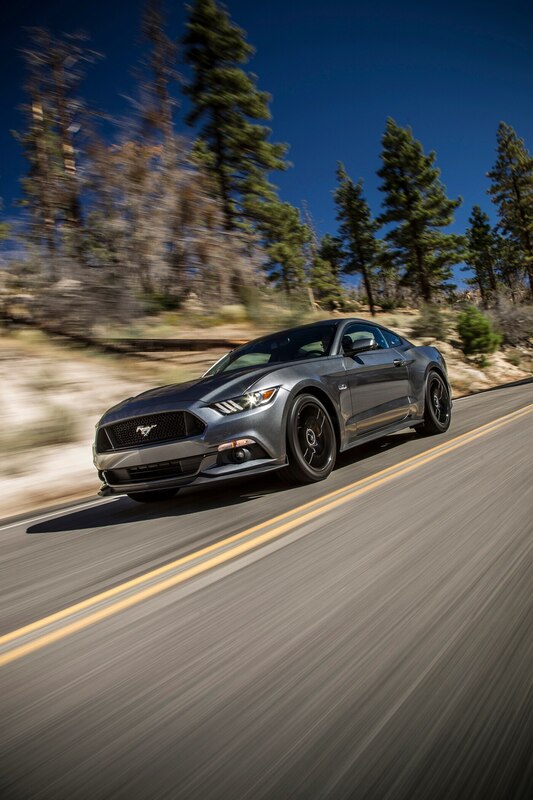 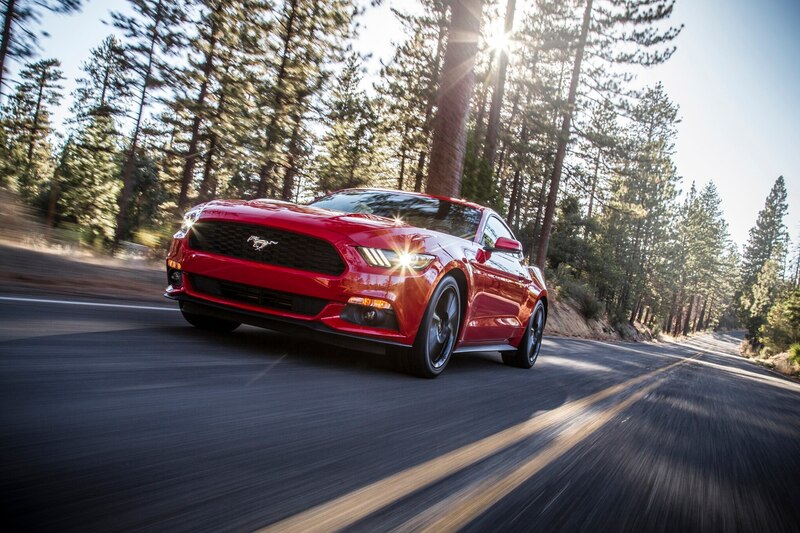 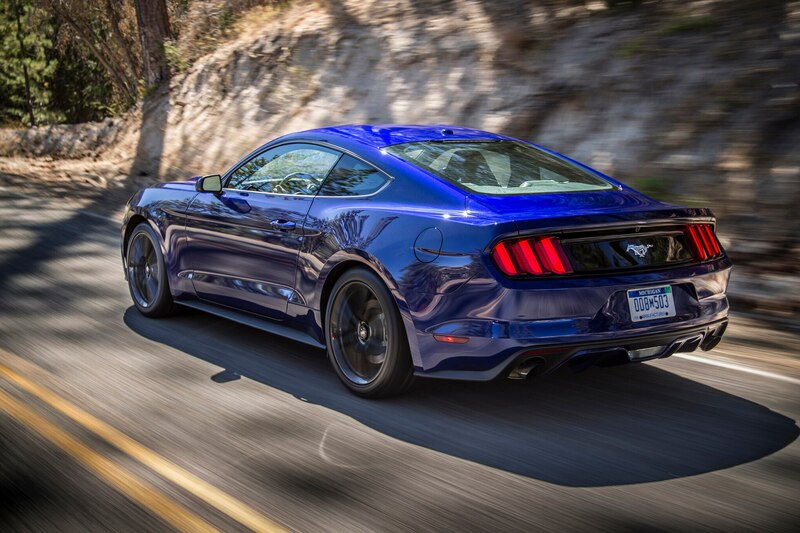 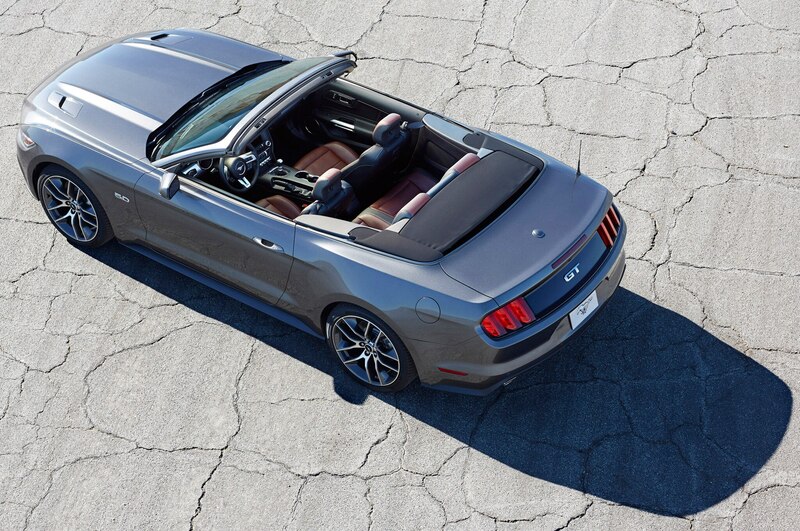 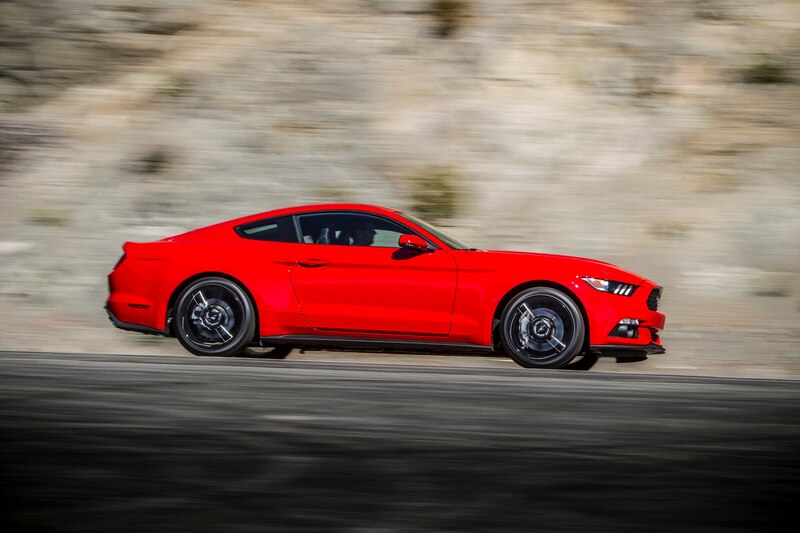 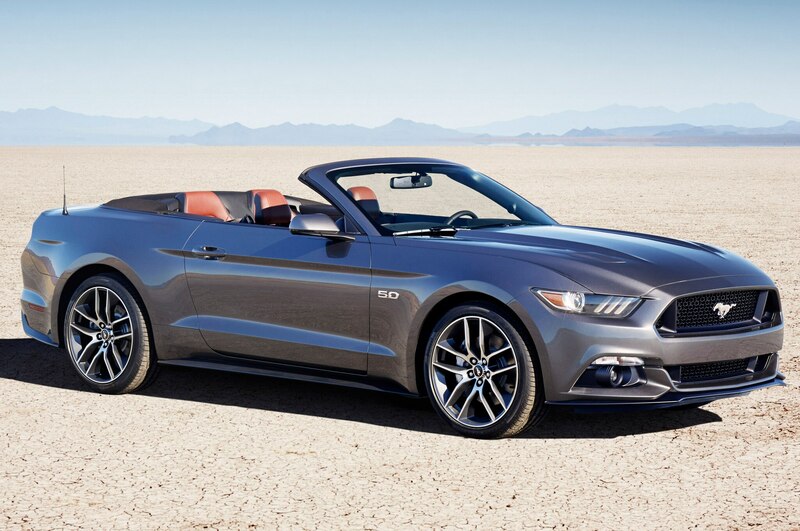 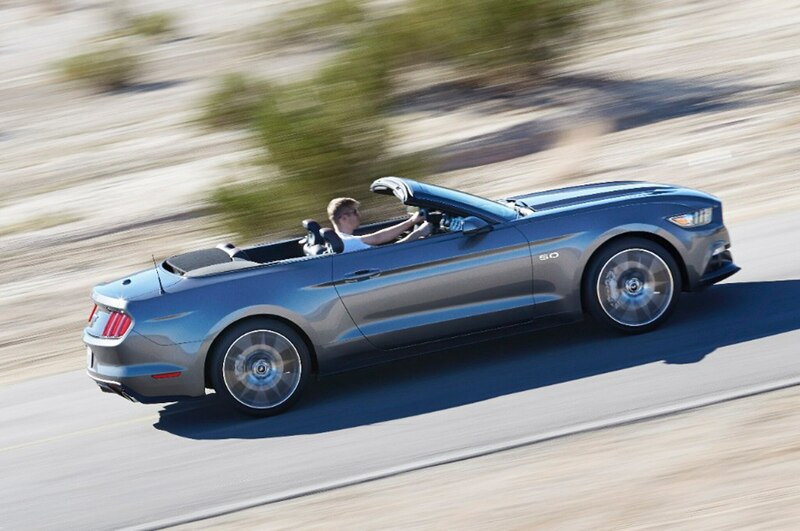 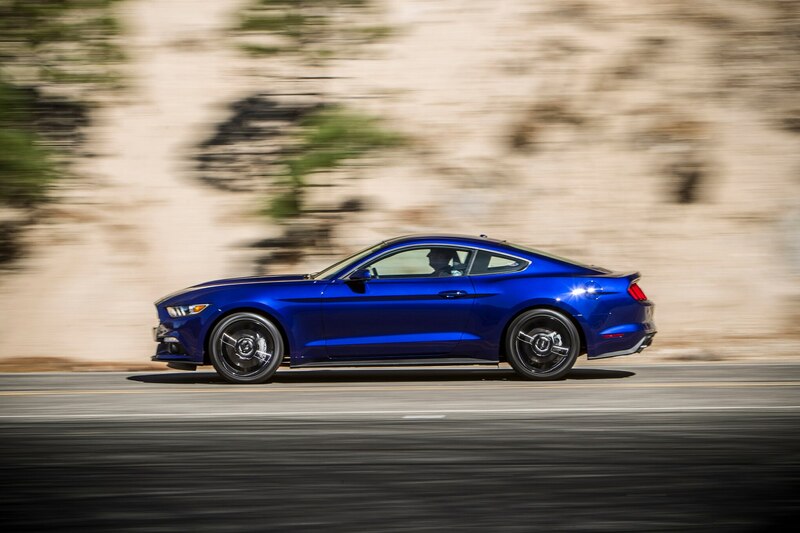 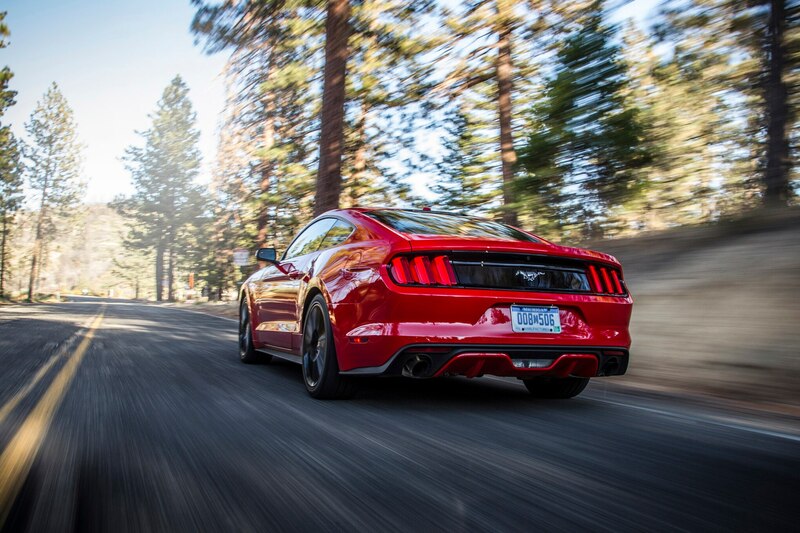 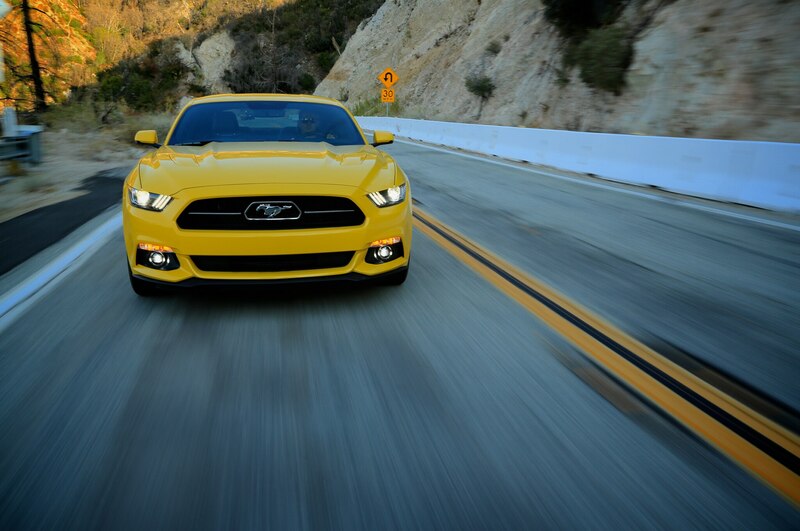 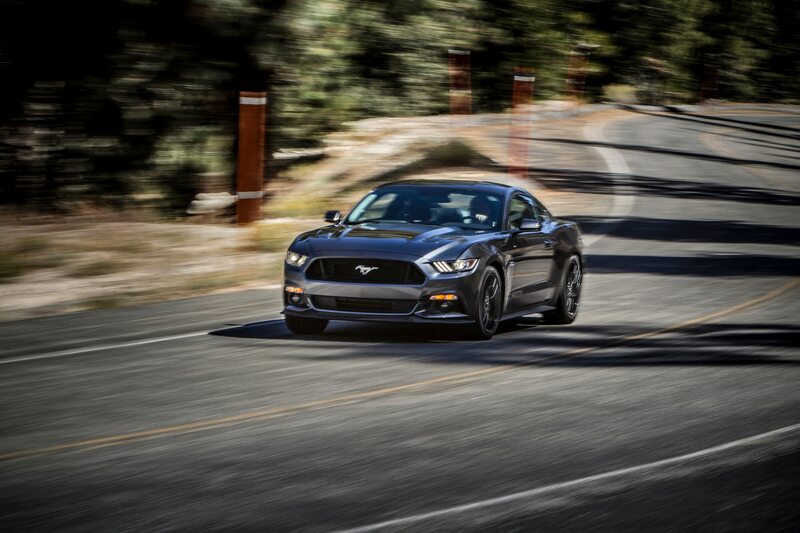 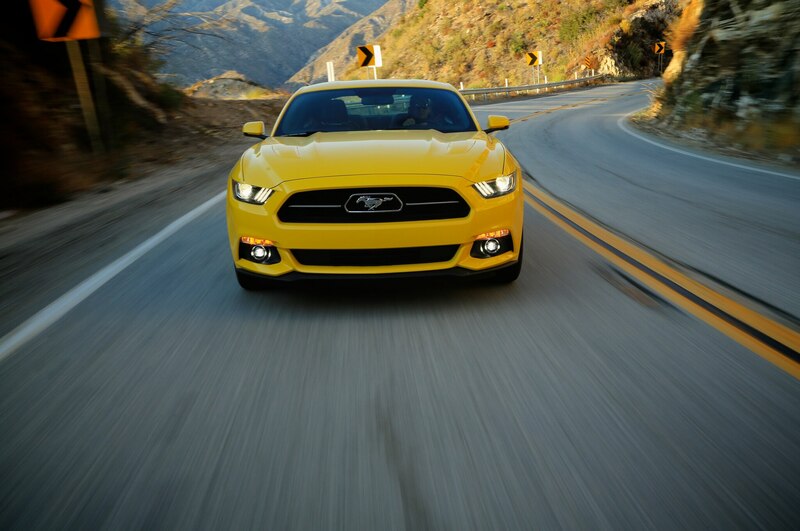 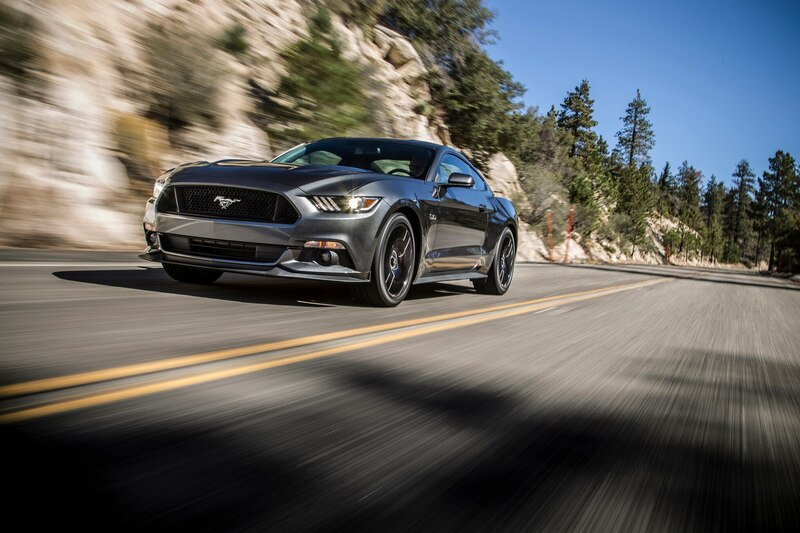 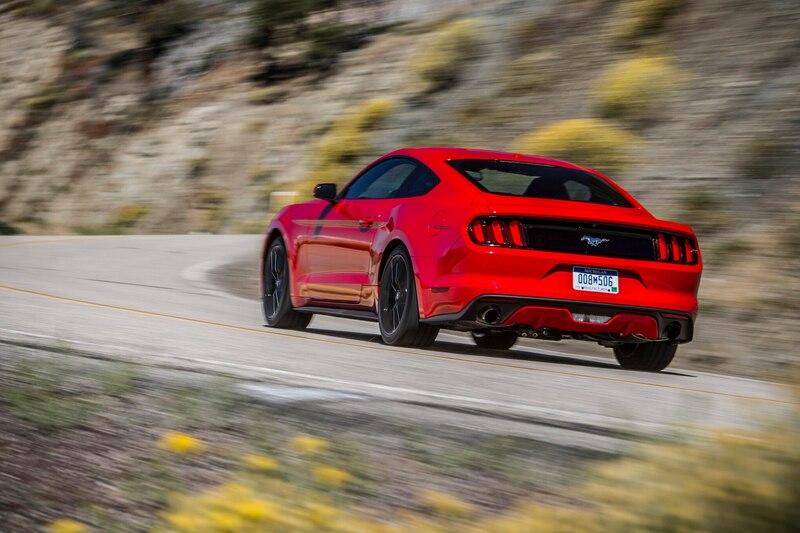 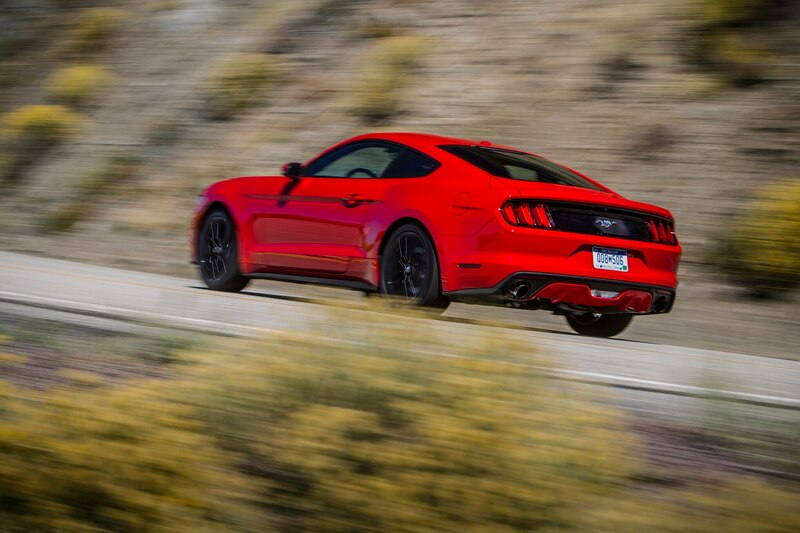 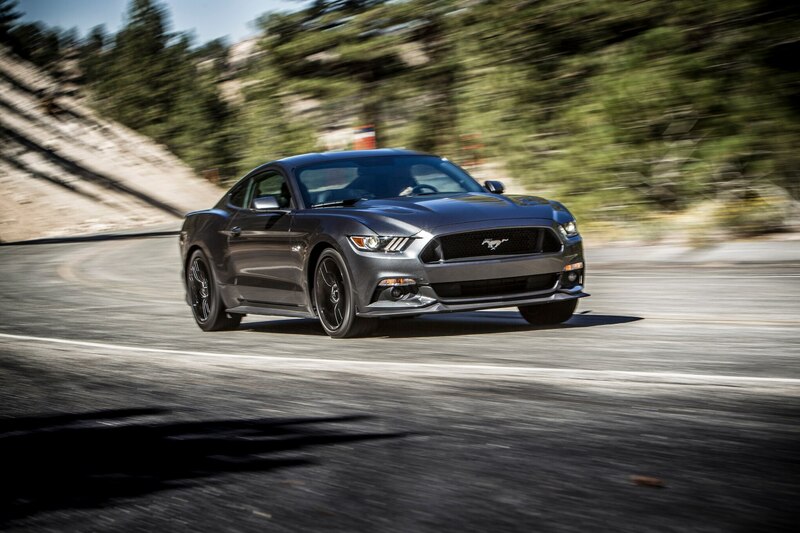 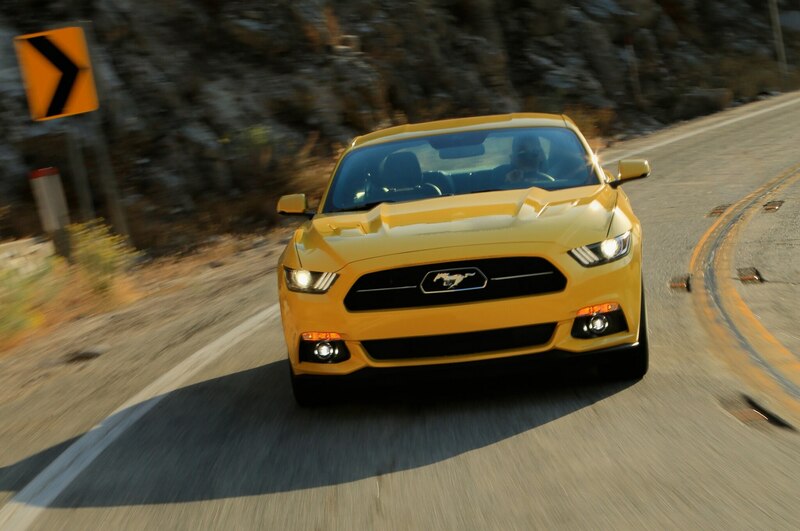 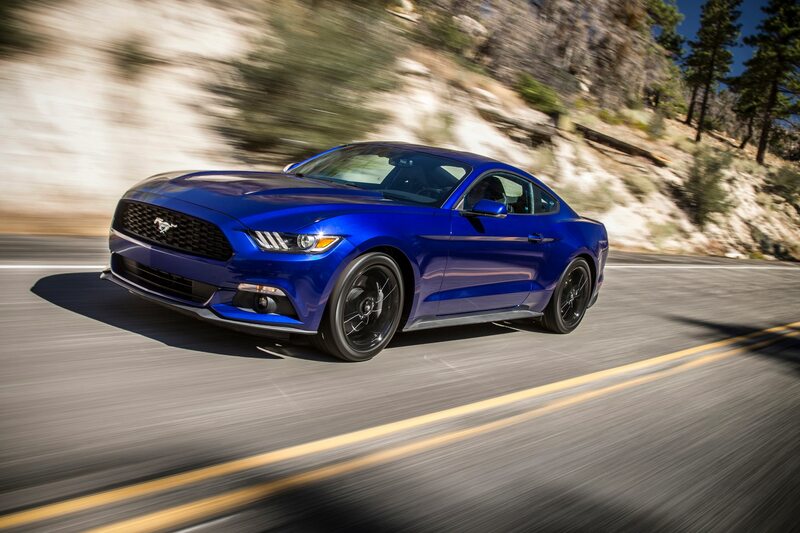 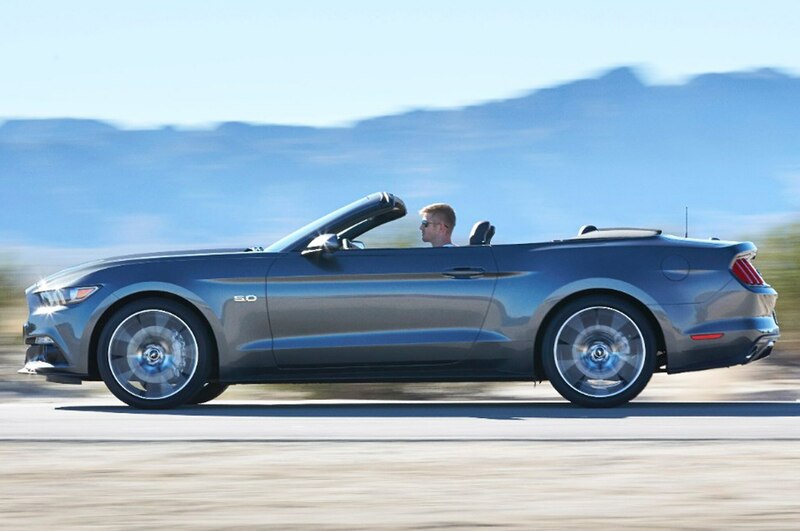 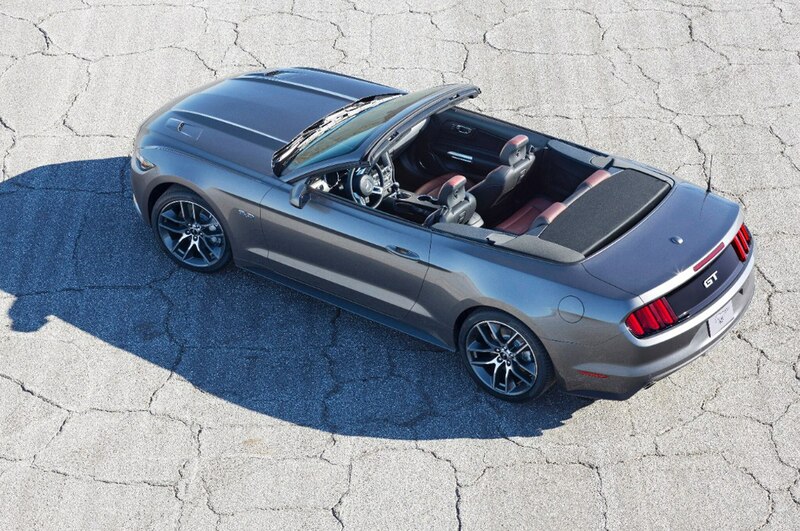 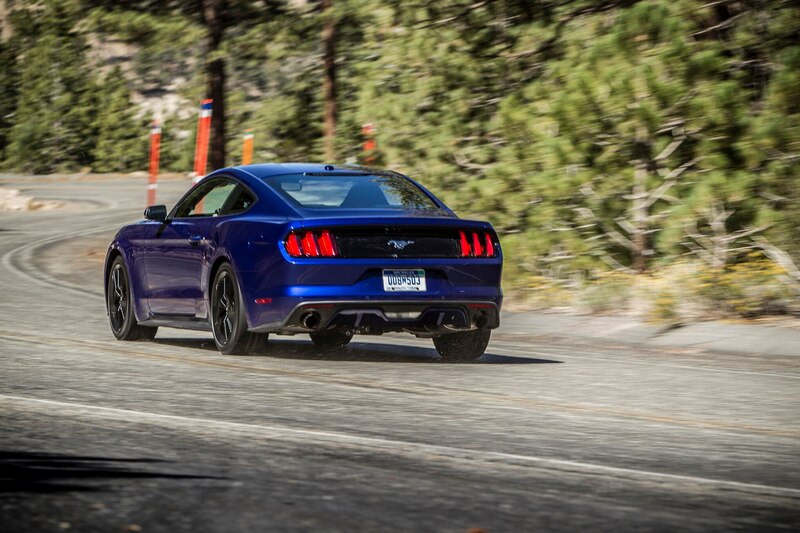 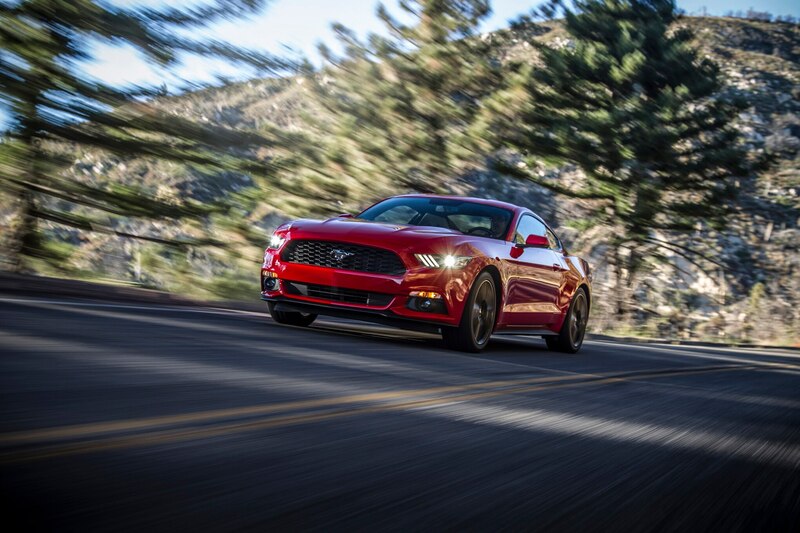 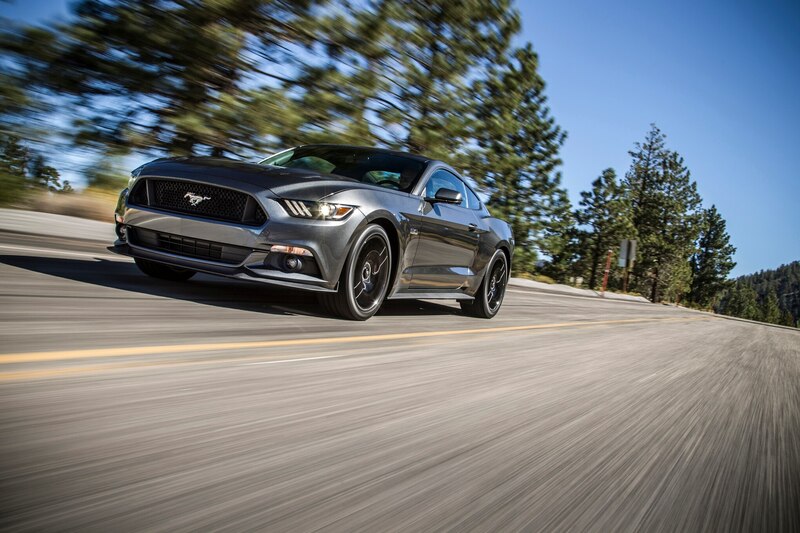 The 2015 Mustang gives new meaning to the phrase “pounding down the freeway,” because mostly it doesn’t. 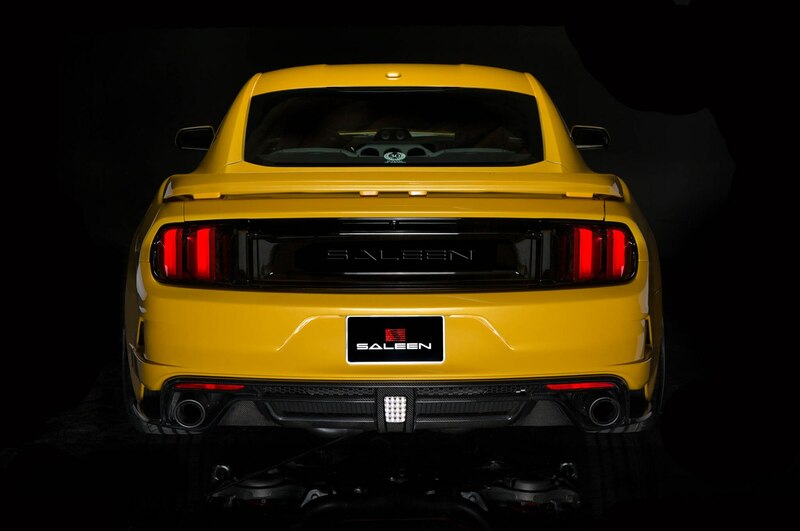 Just as advertised, the new multi-link independent rear suspension makes you forget all about the pony-like kick that the old solid-axle Mustang would make at every mismatched seam in a concrete freeway. 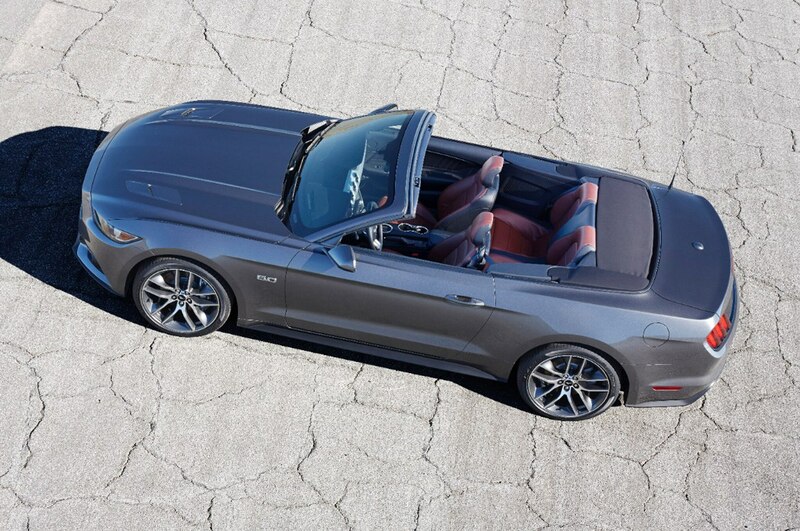 Of course, we’re not talking about suspending the laws of physics here. 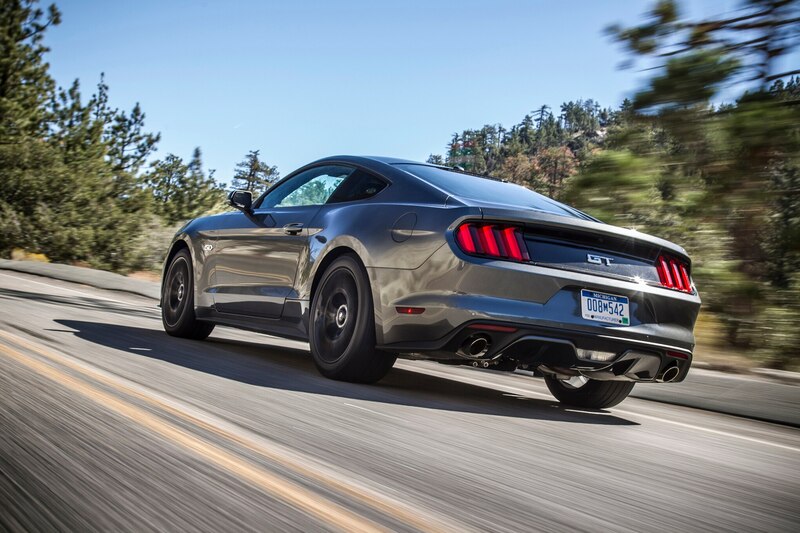 Even with its long, 107.1-inch wheelbase, this car pitches a bit across the ripples in the road, and there are certain pavement surfaces that can trigger a little harshness in the tires or a noisy resonance in the suspension bushings. 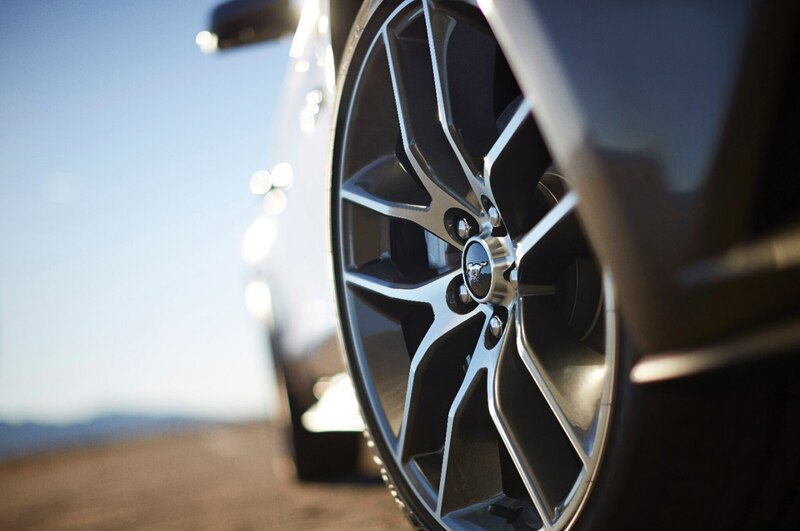 But, really, you hardly notice. 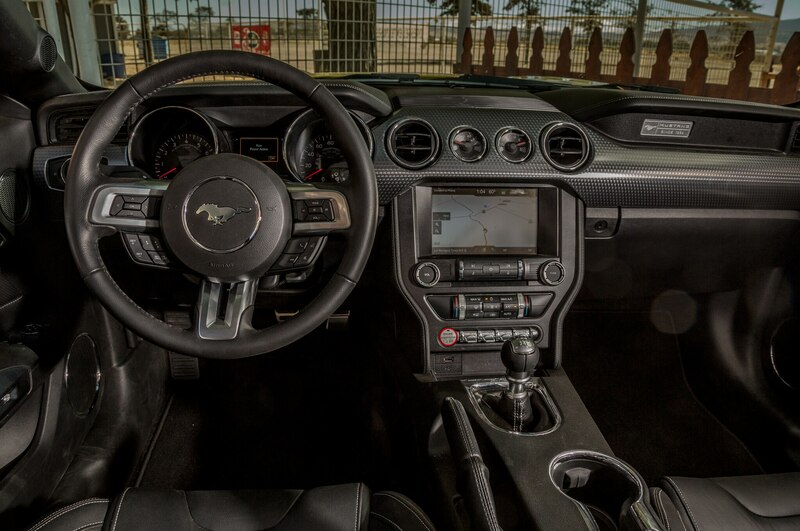 Don’t try flipping the toggle switches on the center console to change the ride quality, because the suspension calibration is fixed. 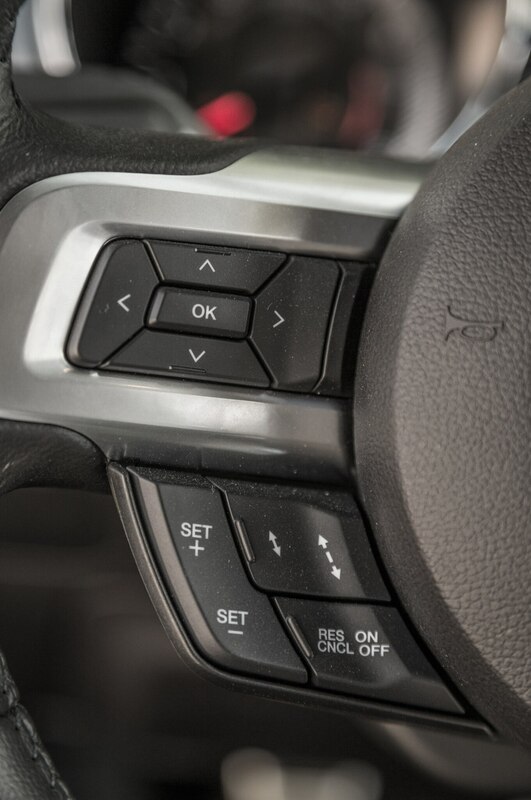 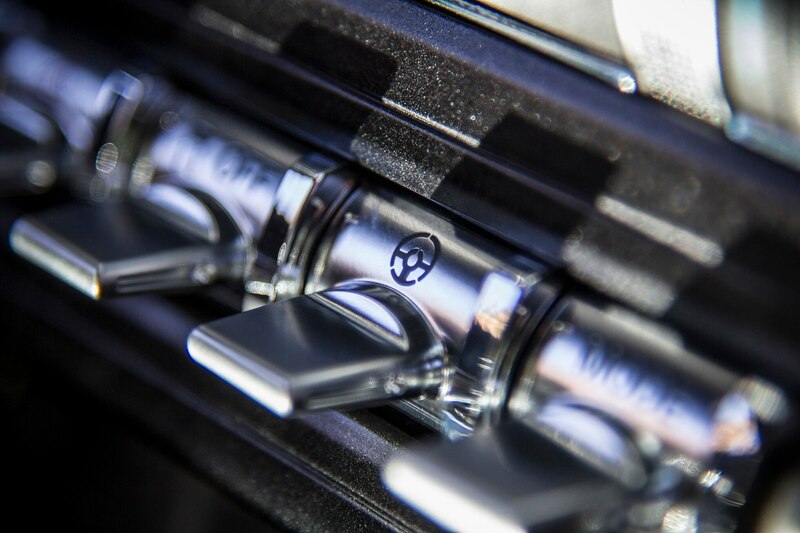 When you change chassis modes between Comfort, Snow, Sport +, and Track, you’re changing steering effort, throttle action, shift points, and stability control calibration. 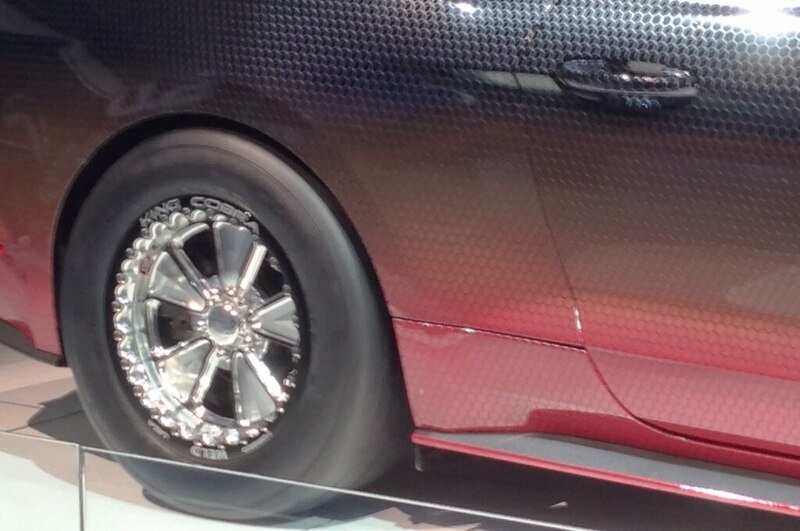 Speaking of steering, you’d never guess that this car features an electric-assist setup. 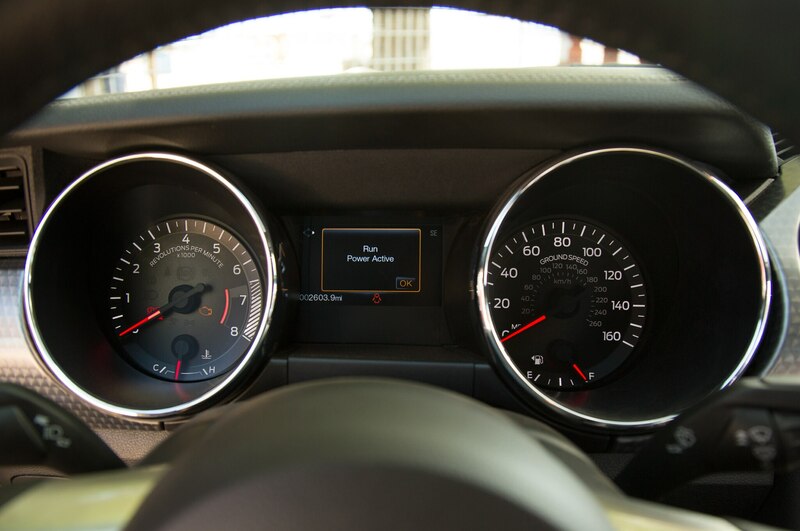 There’s no stickiness to the steering action, and the car doesn’t wander from side to side in the lane. 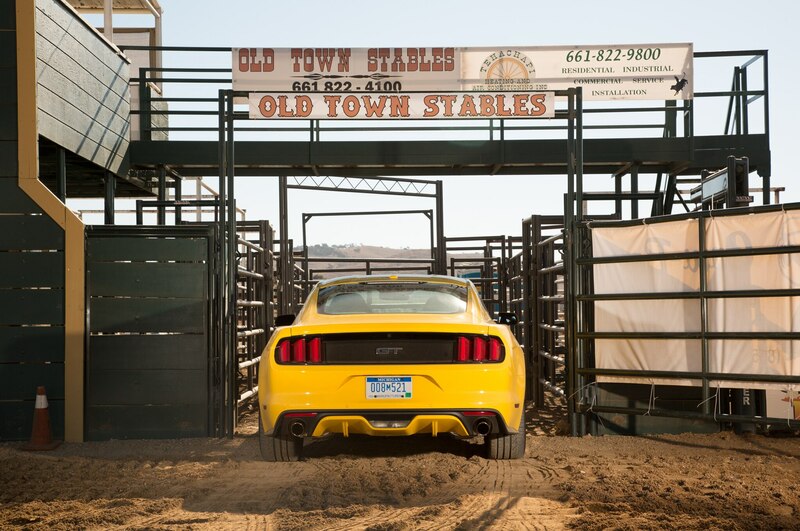 Finally, we get to a place beyond the city limits, so we let the engine off its leash. 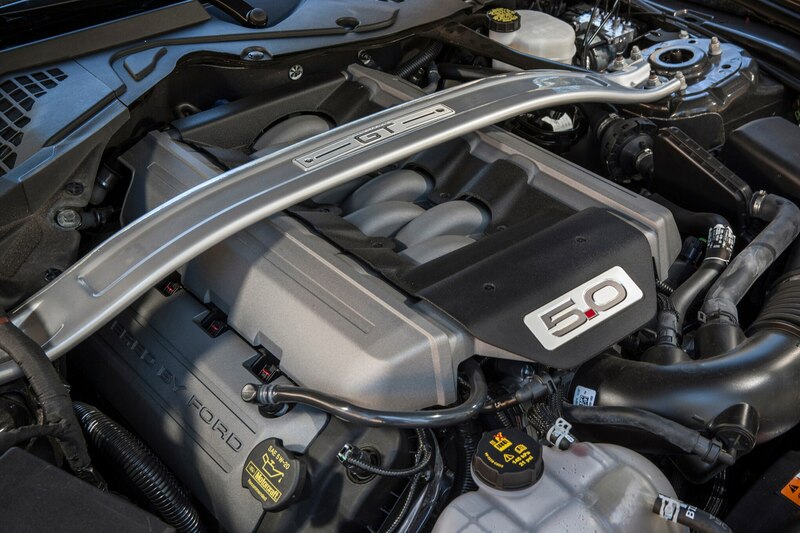 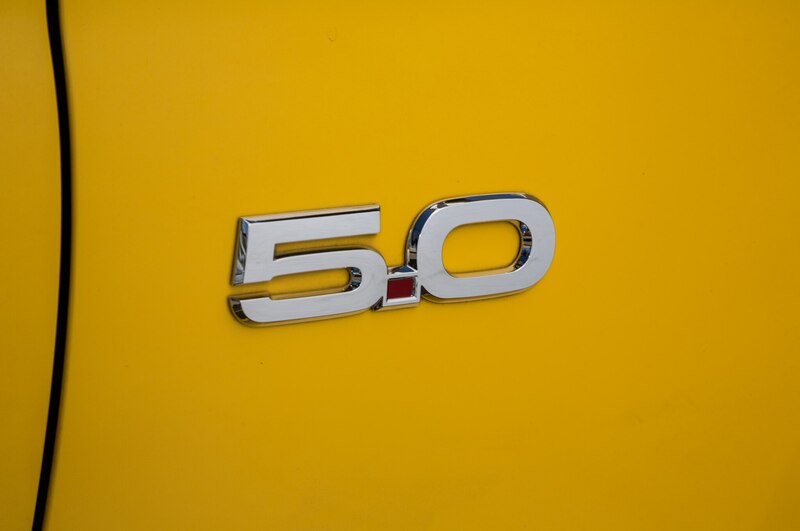 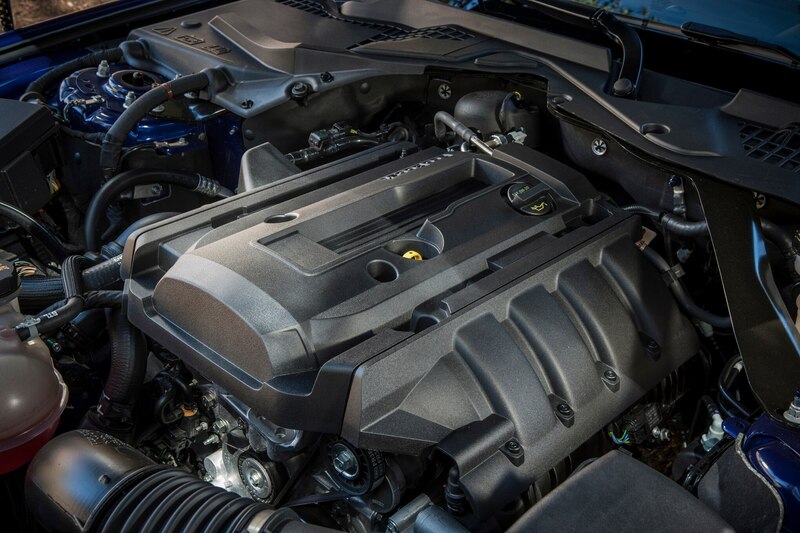 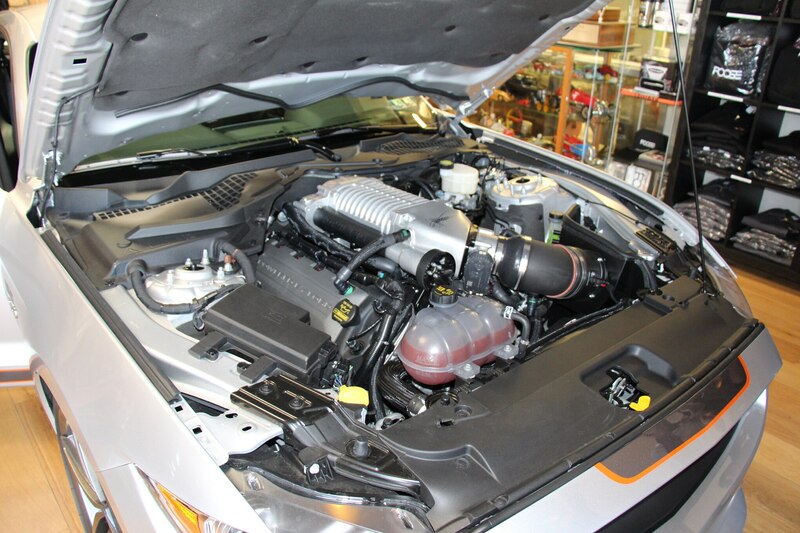 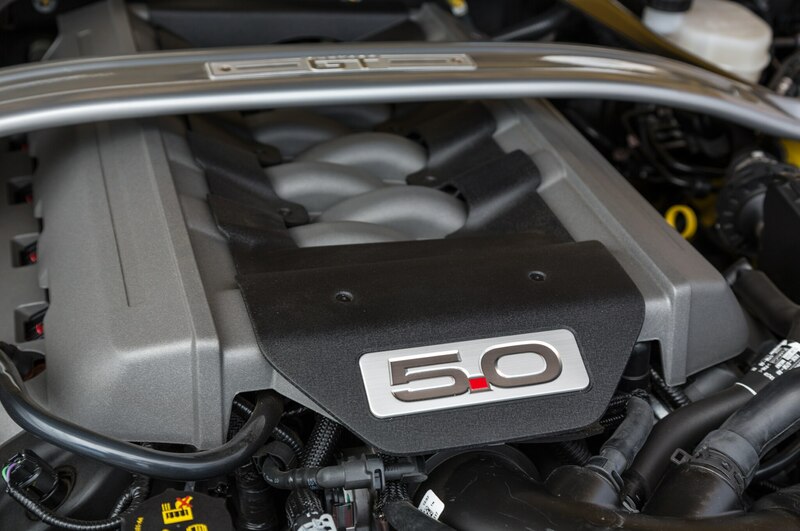 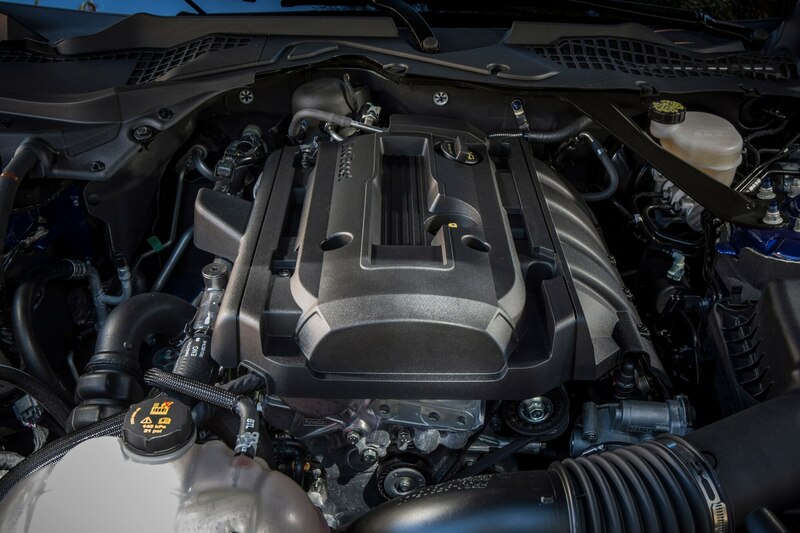 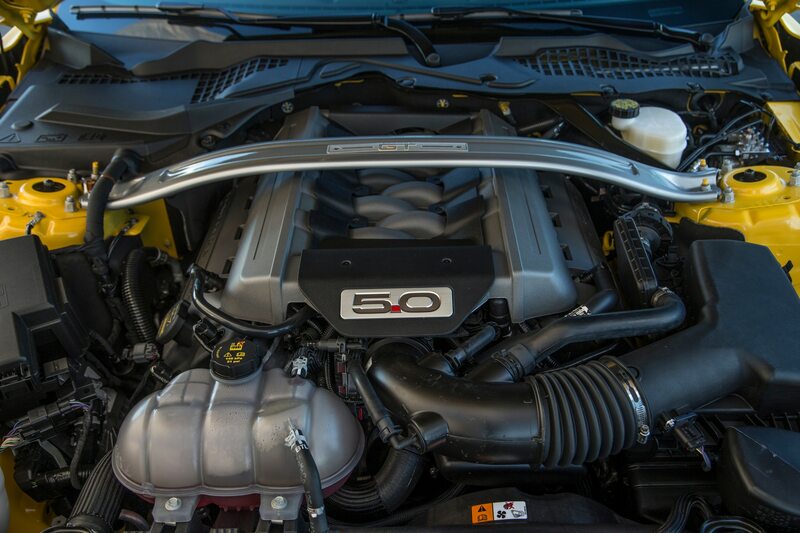 It goes without saying that 435 hp @ 6500 rpm and 400 lb-ft @ 4250 rpm from this DOHC 4951cc V-8 are plenty for the 3705-lb Mustang 5.0, not the least because you can expect an EPA-certified 15/25 mpg. 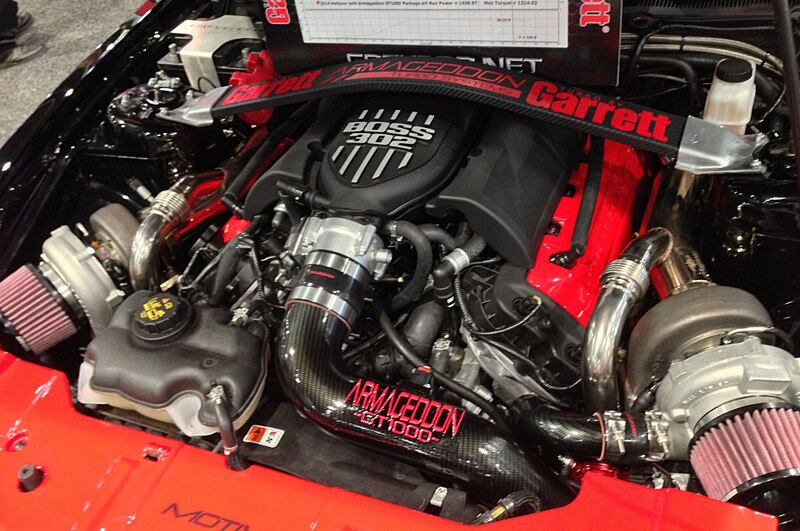 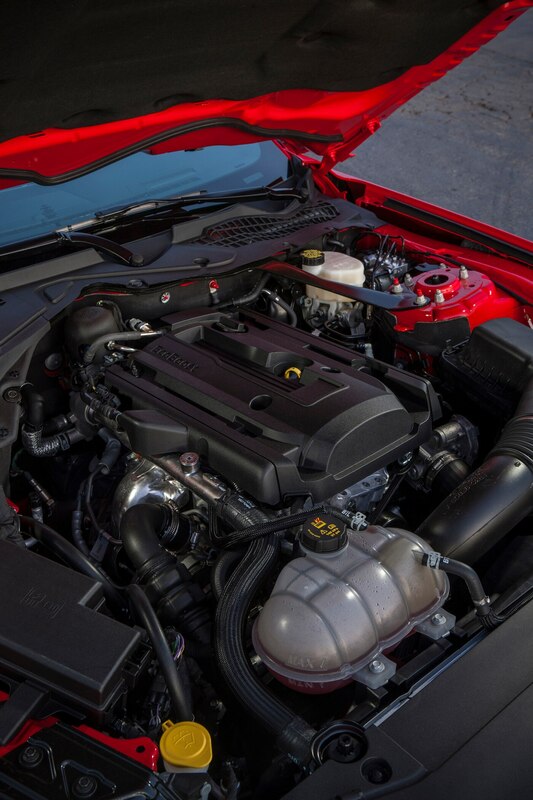 This engine also is eager to charge toward its redline, and we think this delivers a stronger impression of performance than an engine that runs at very low rpm. 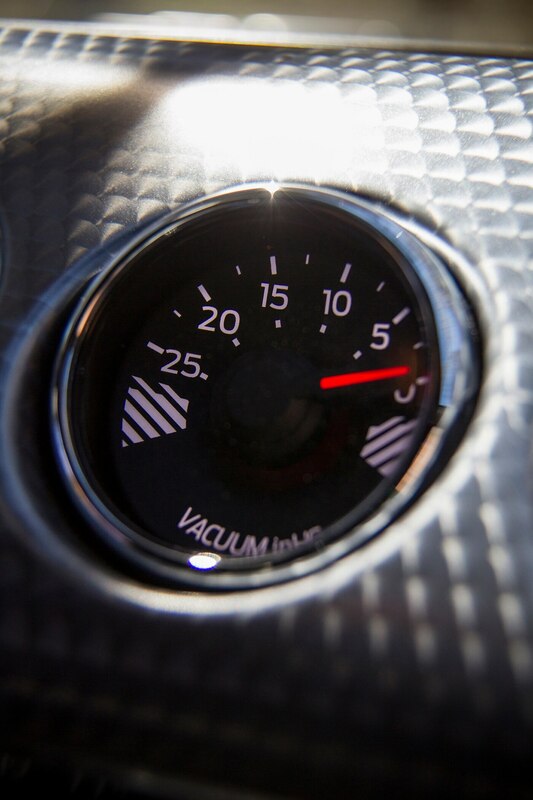 The engine sounds great through the little audio symposer that funnels engine sounds into the cabin. 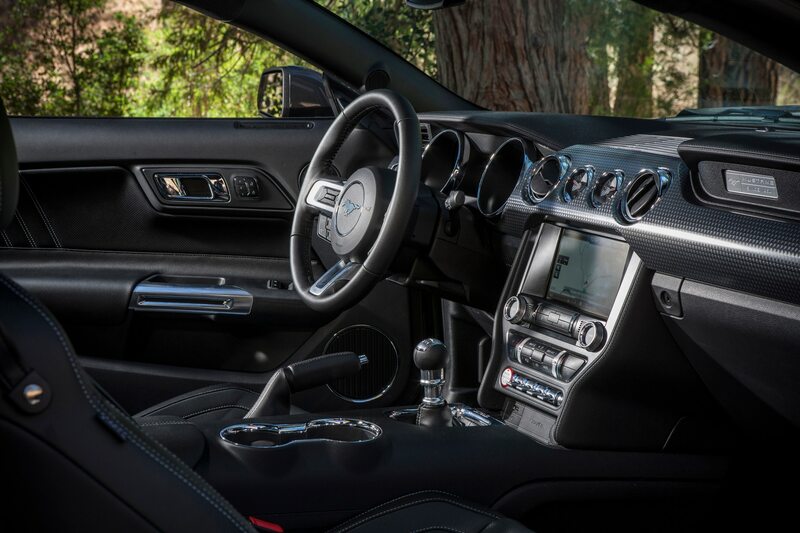 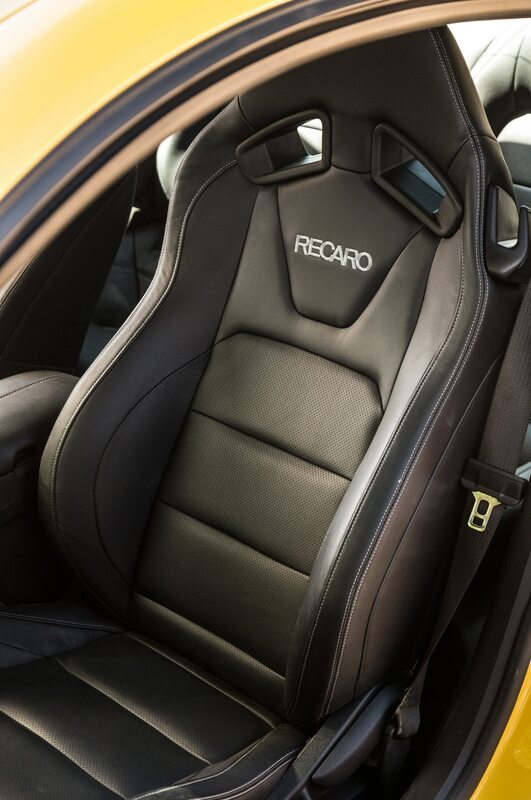 The manual gearbox and clutch deliver excellent response, although it’s frustrating to feel the way that the throttle pedal and brake pedal have drifted apart because of concerns over unintended acceleration, so now heel-and-toe downshifts are not easy to make. 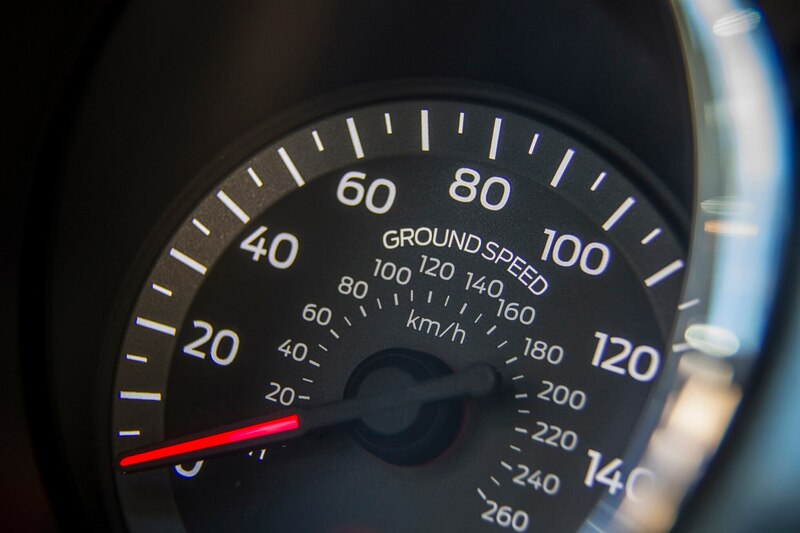 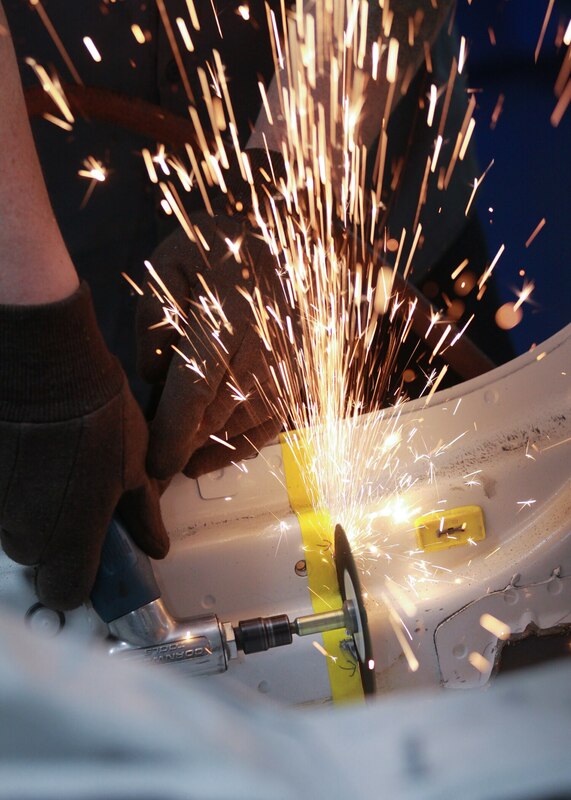 When it comes to burning away the speed, the brakes are effective, although there’s so much bite from the brake pads even with light pressure on the pedal that it’s best to be deliberate. 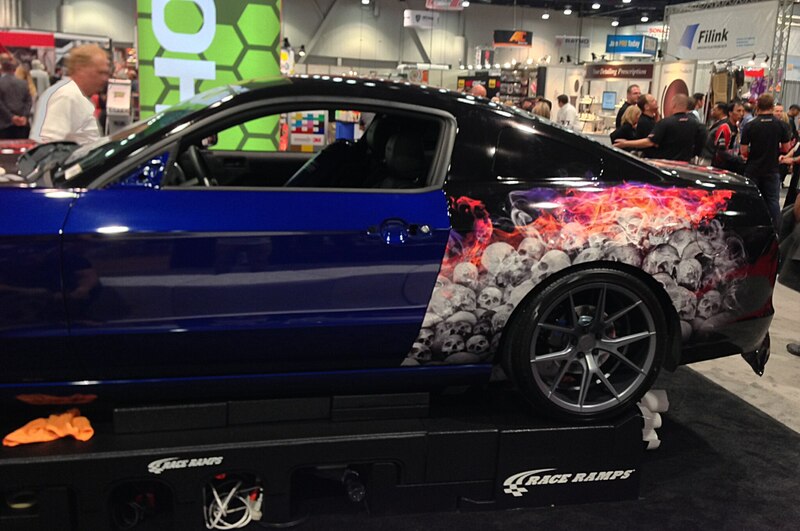 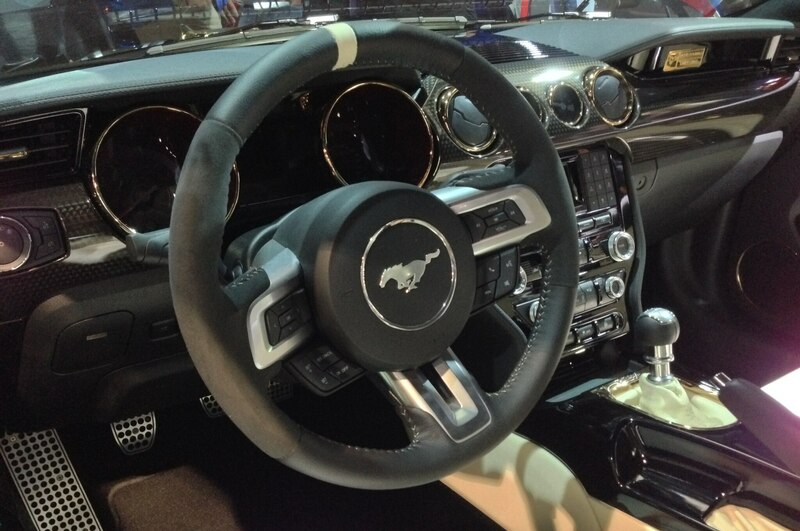 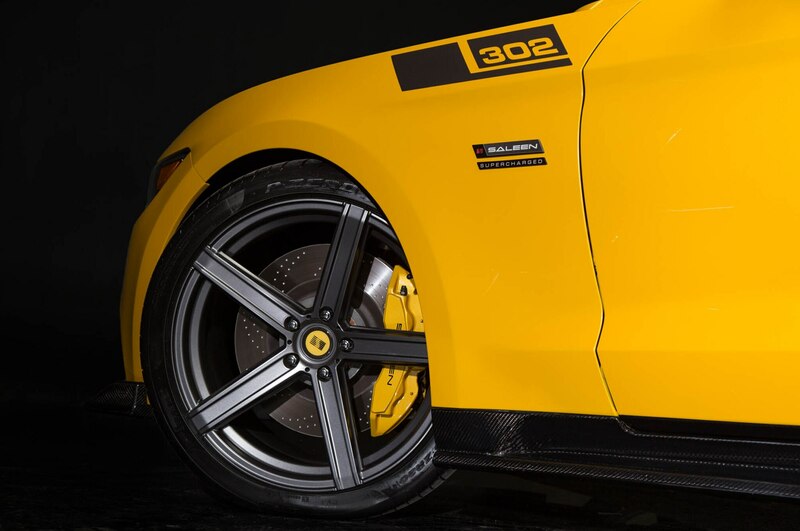 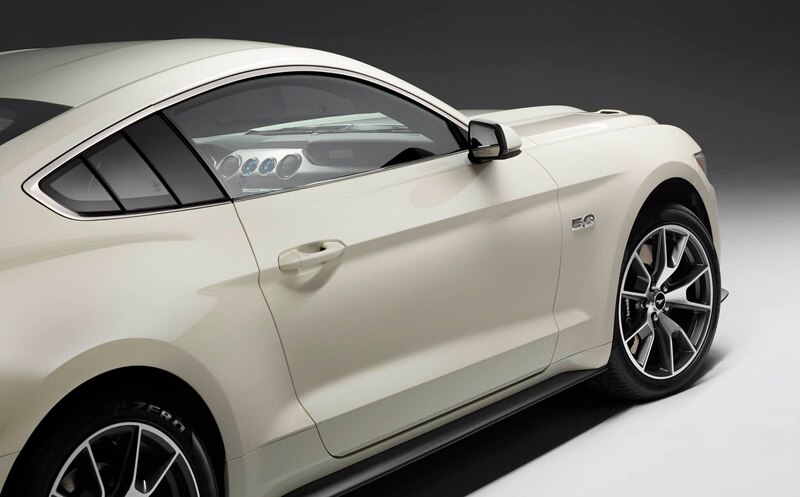 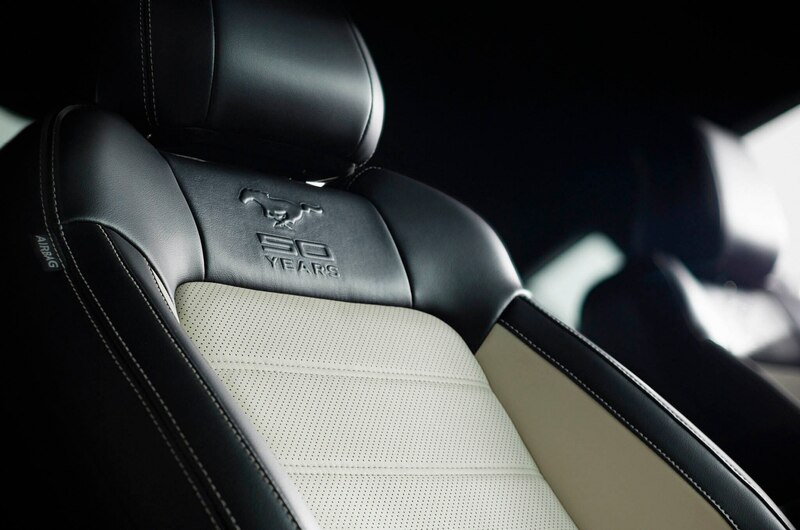 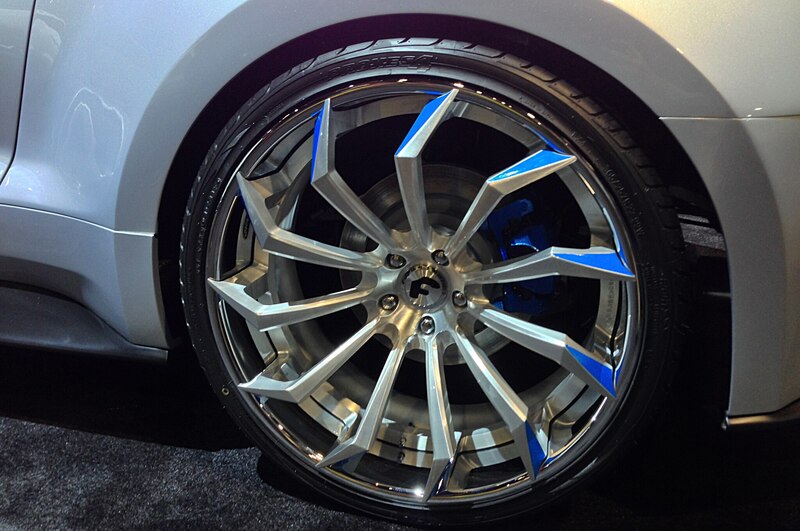 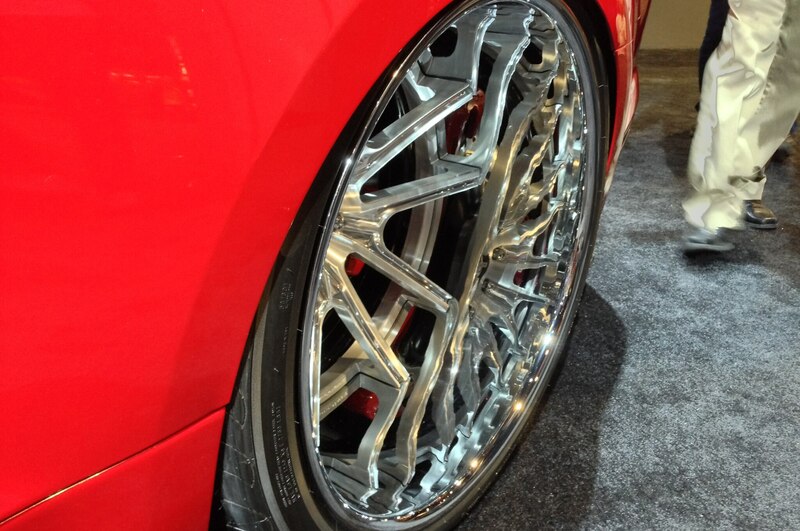 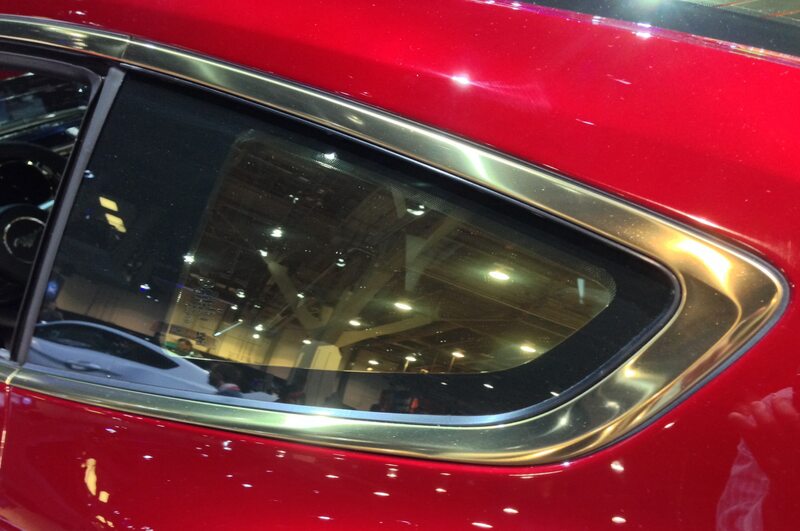 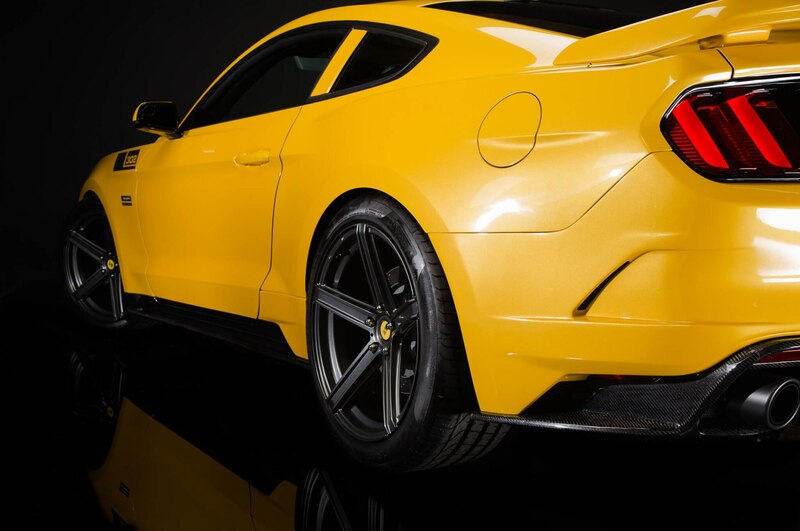 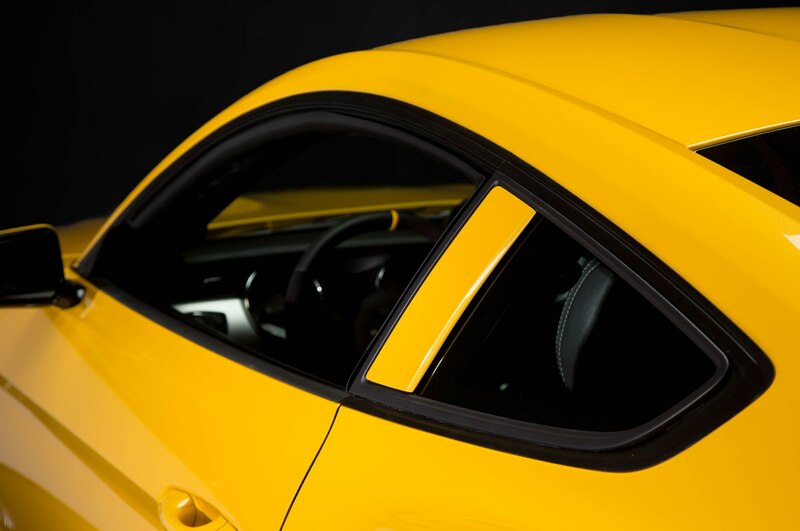 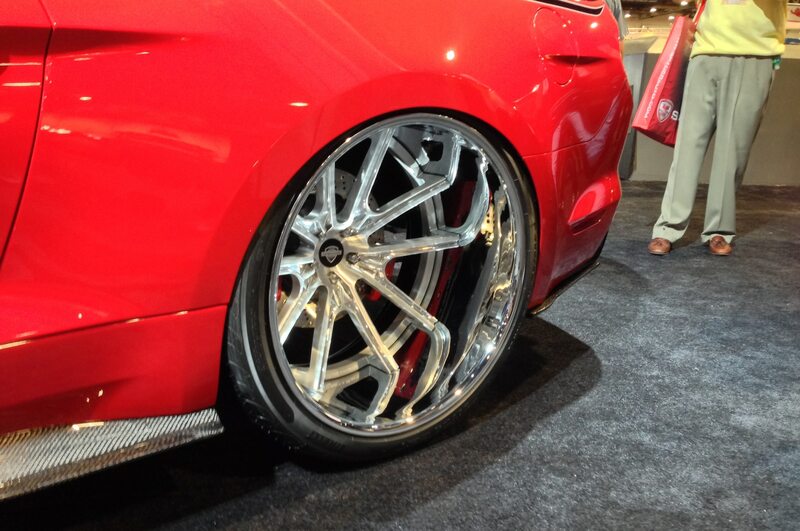 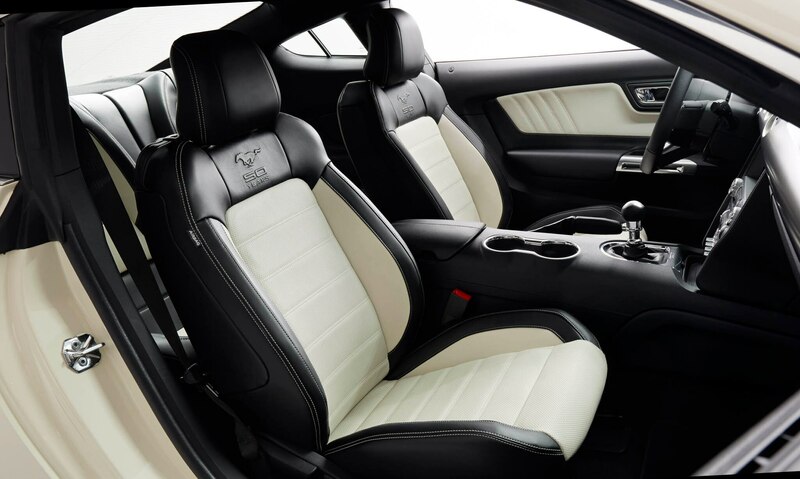 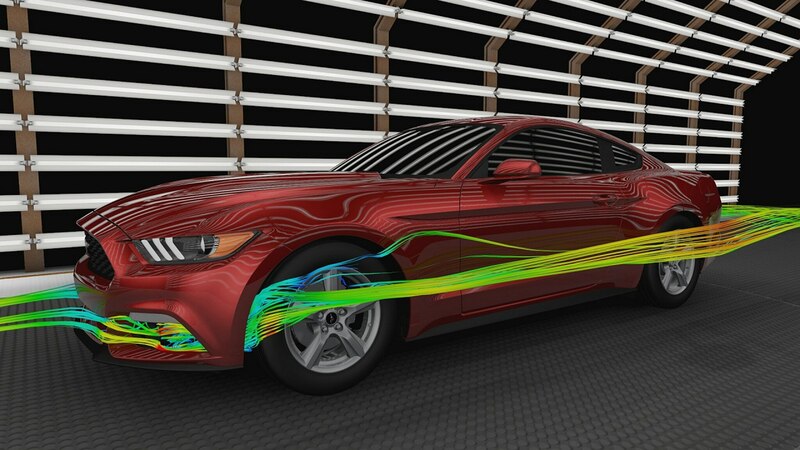 What you notice most, of course, is the new suppleness with which the Mustang negotiates the corners. 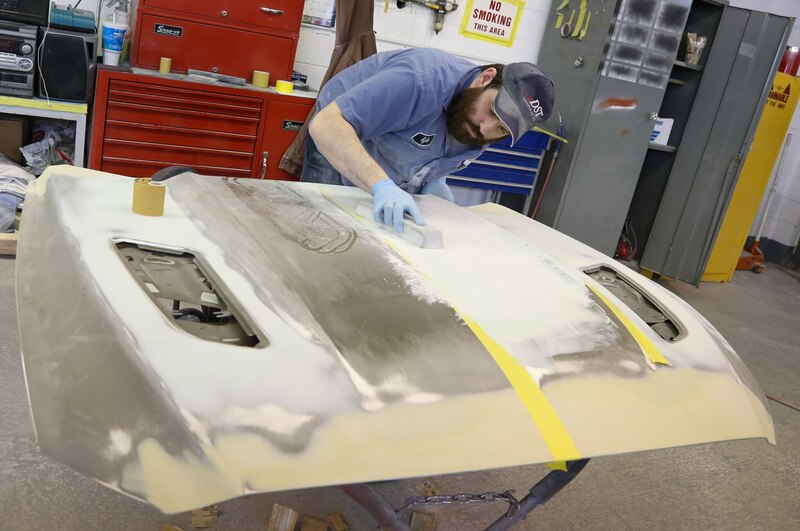 The wheels move up and down with a sure-footed style that feels carefully damped, and the old springy skittishness is long gone. 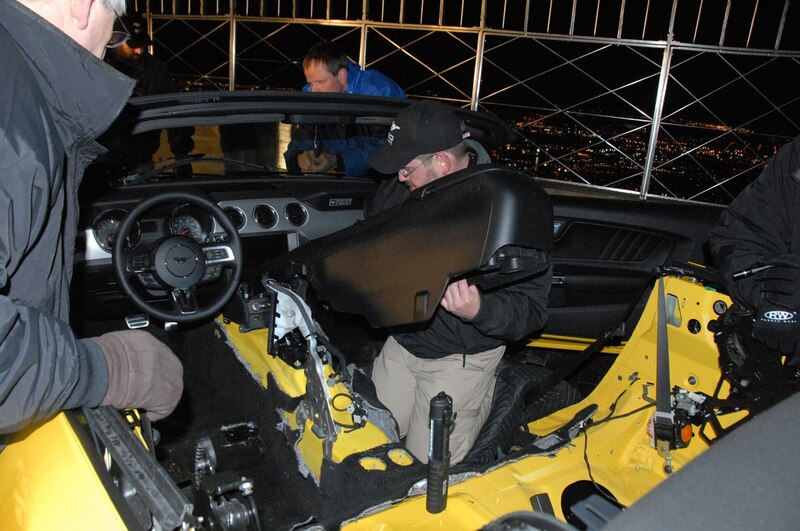 A bit of anti-dive and anti-squat in the suspension adds a measure of control. 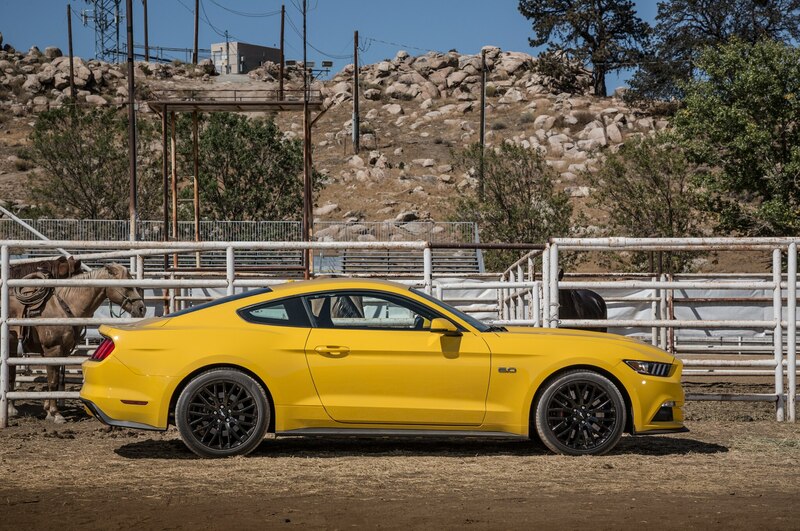 It’s really quite something to feel this Mustang GT’s optional 40-series, 19-inch Pirelli P Zero tires soak up the undulations of the road as you feed in some steering lock, then sense the chassis rolling predictably and finally sitting down noticeably on its outside rear tire as the car carves around the corner. 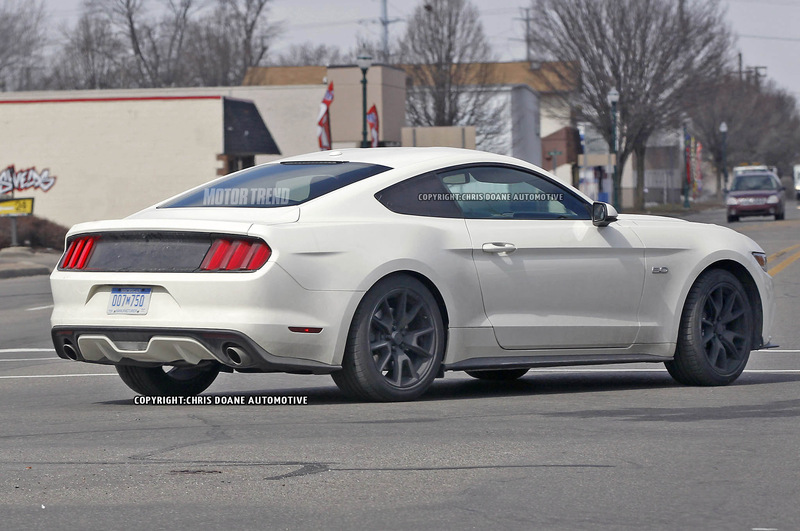 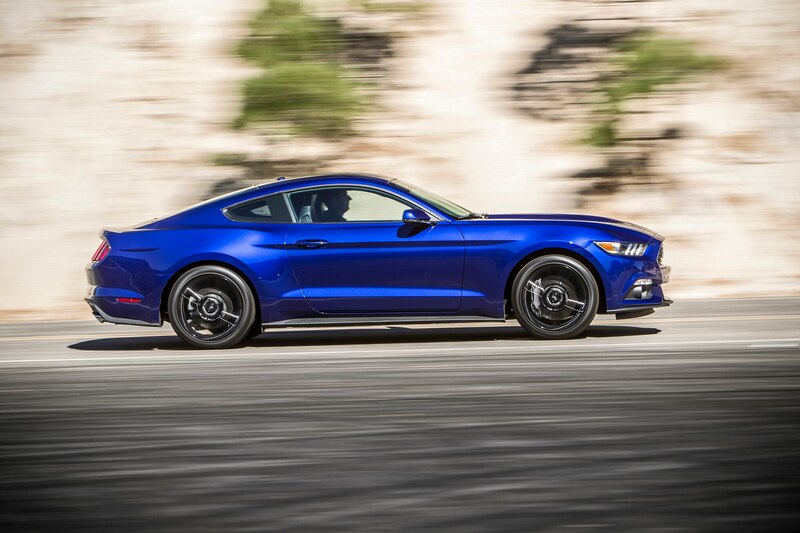 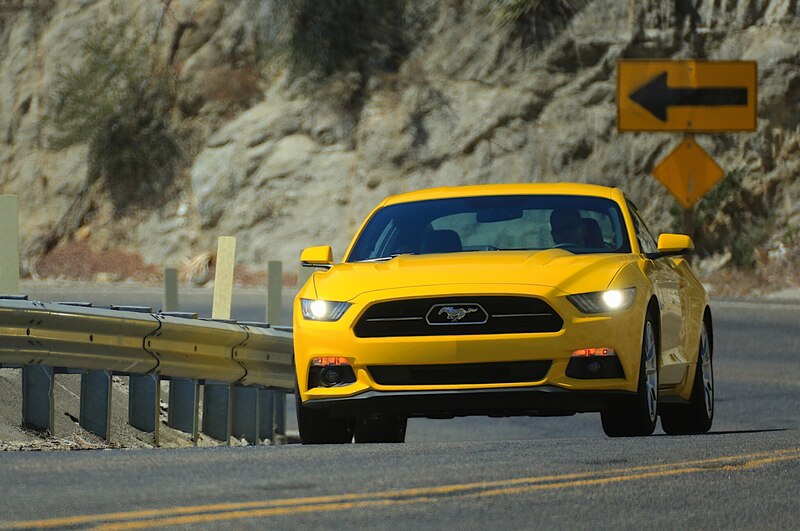 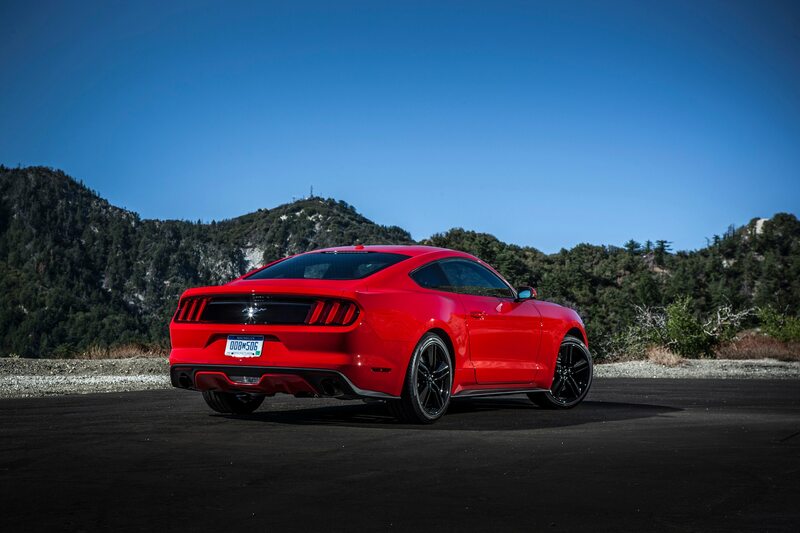 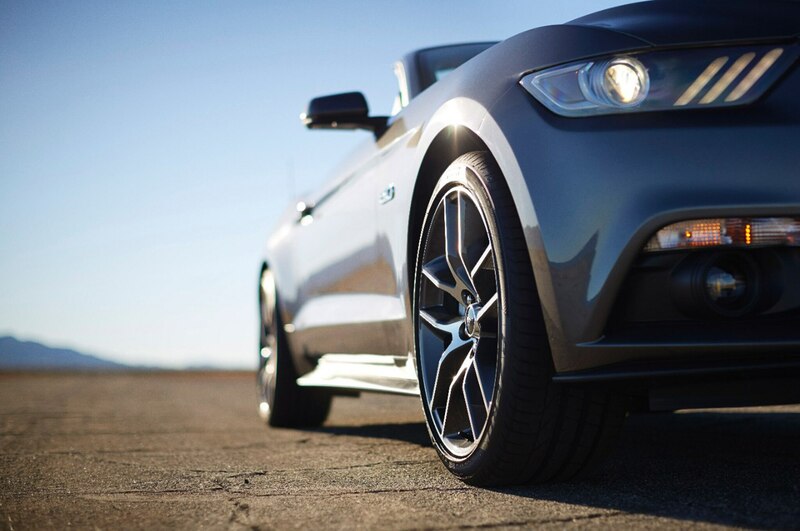 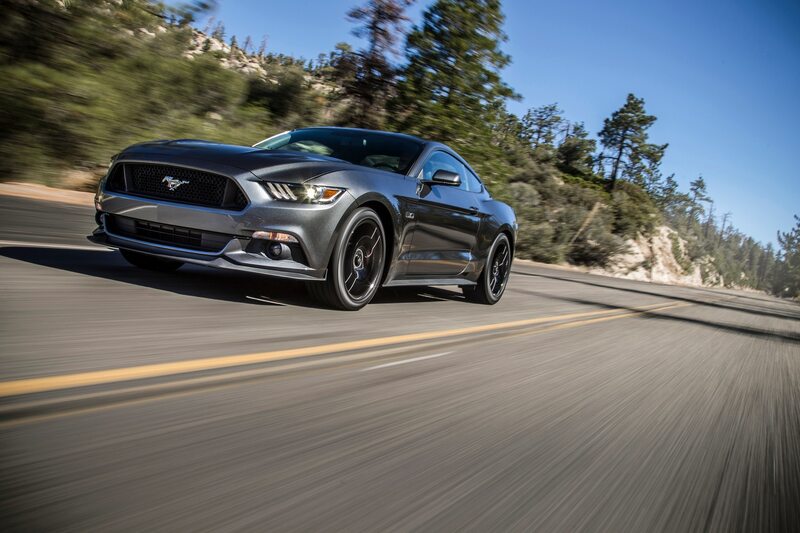 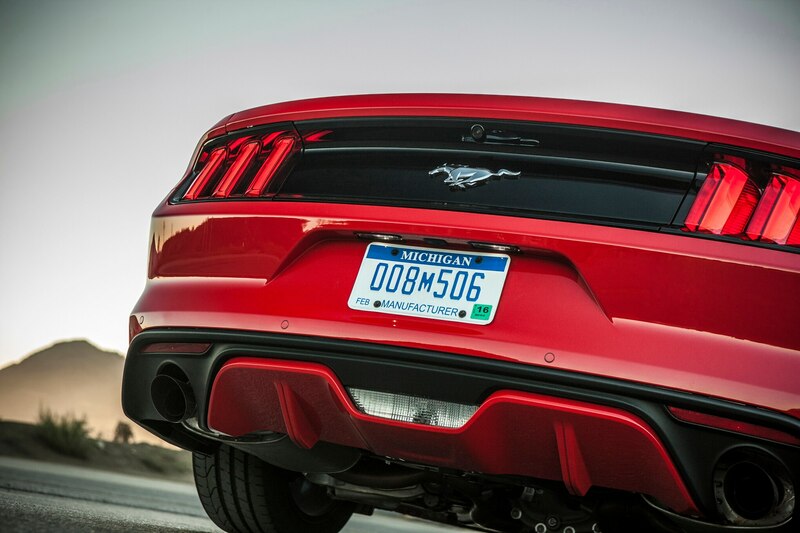 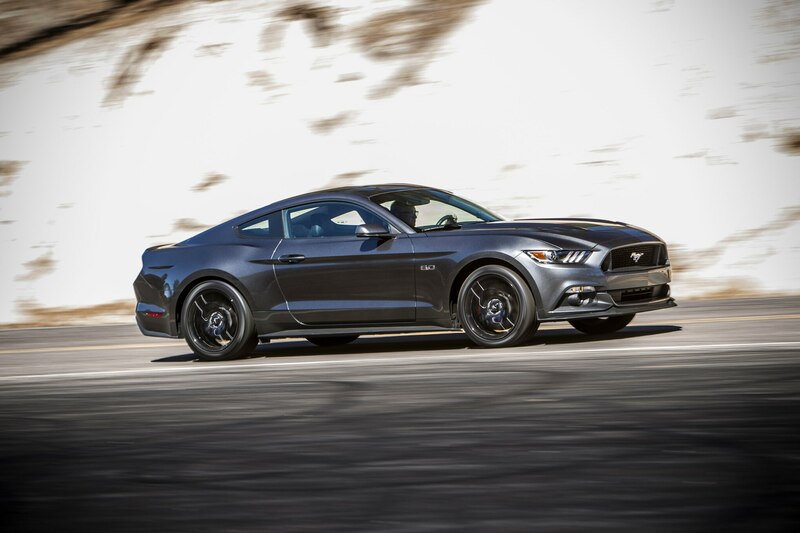 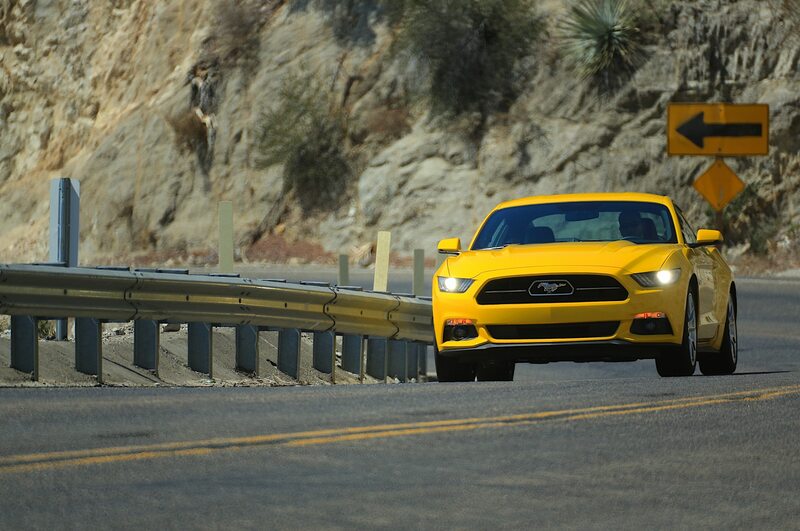 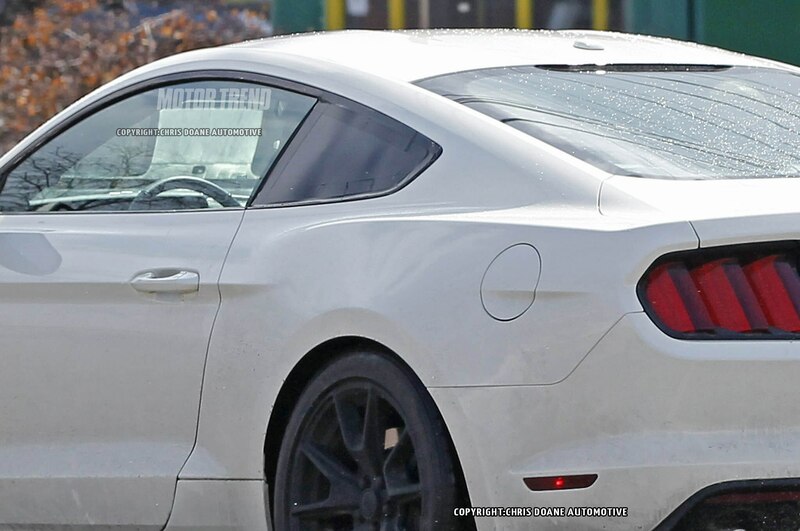 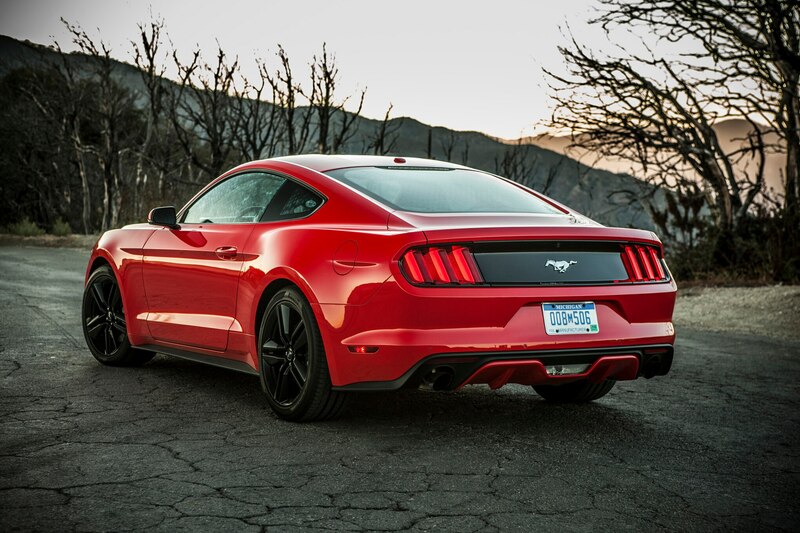 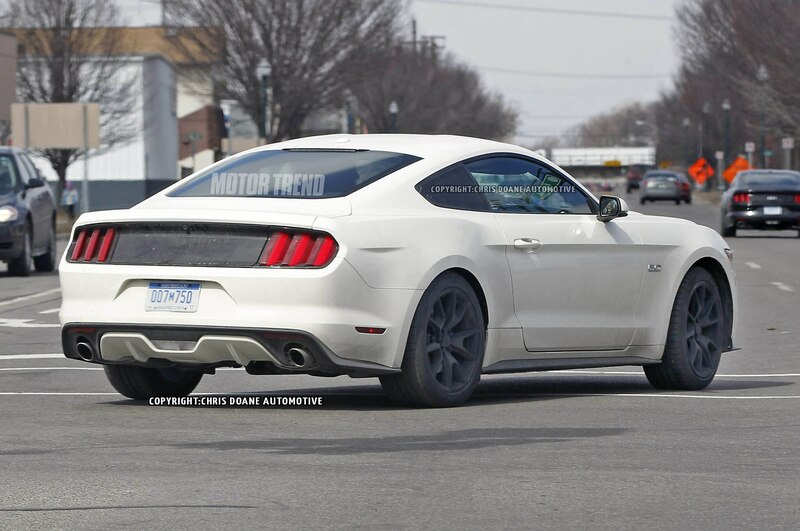 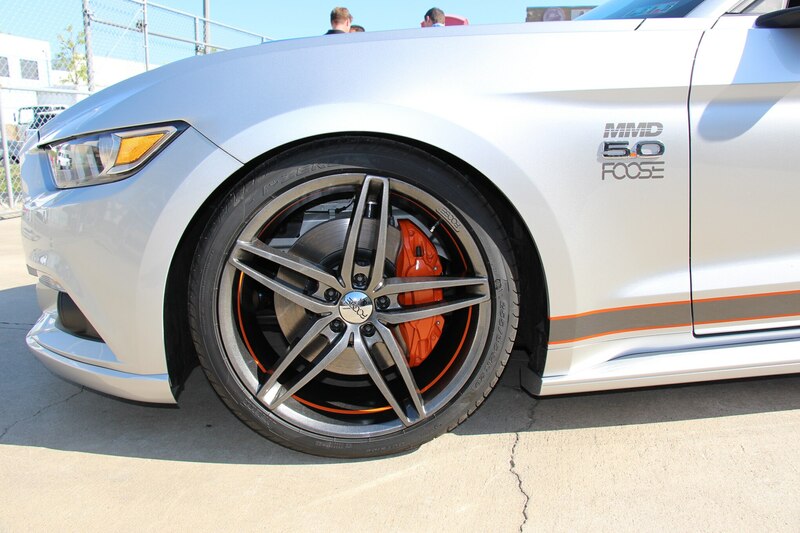 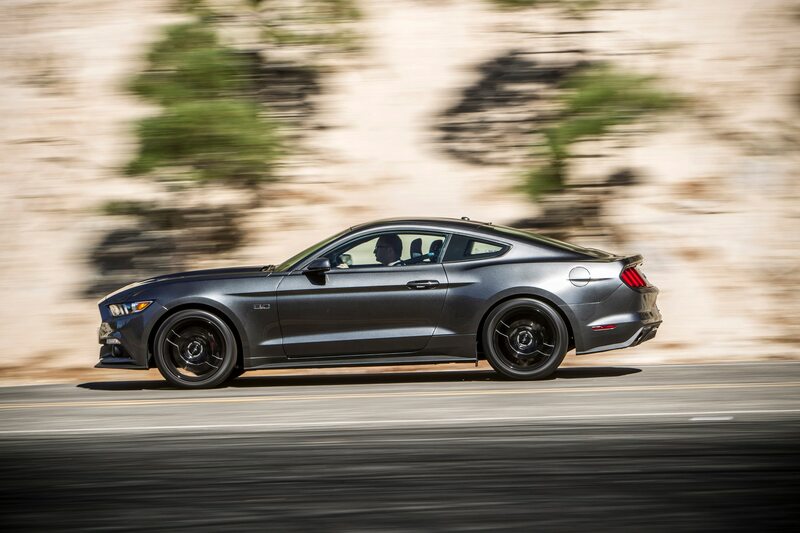 The 2015 Mustang’s resilient suspension calibration makes the car feel amazingly graceful. 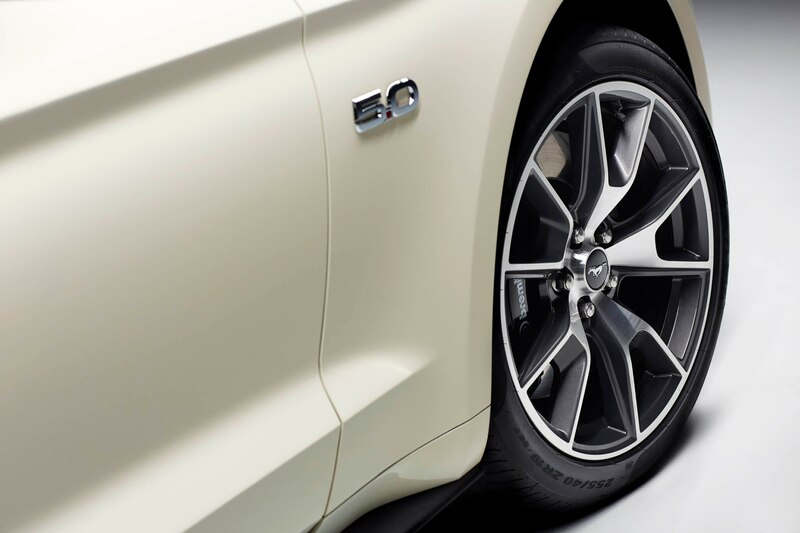 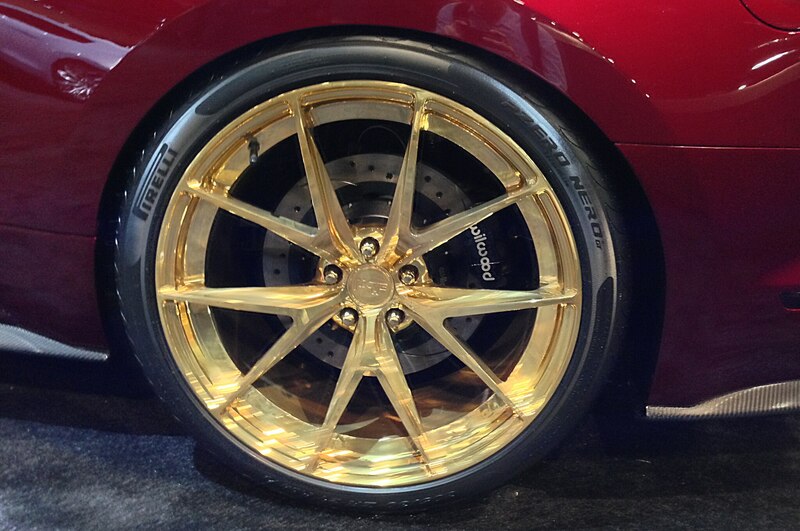 You’re aware of the big, heavy 19-inch wheels moving up and down, of course, but never do they feel as if they’re steering the car. 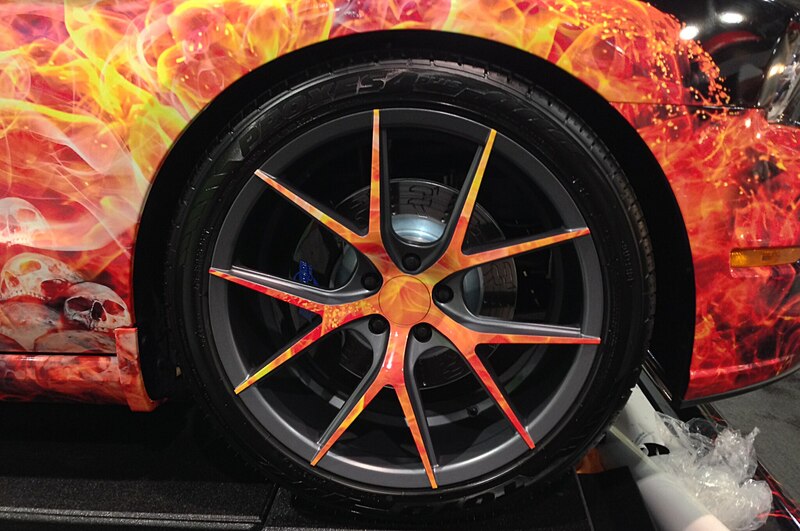 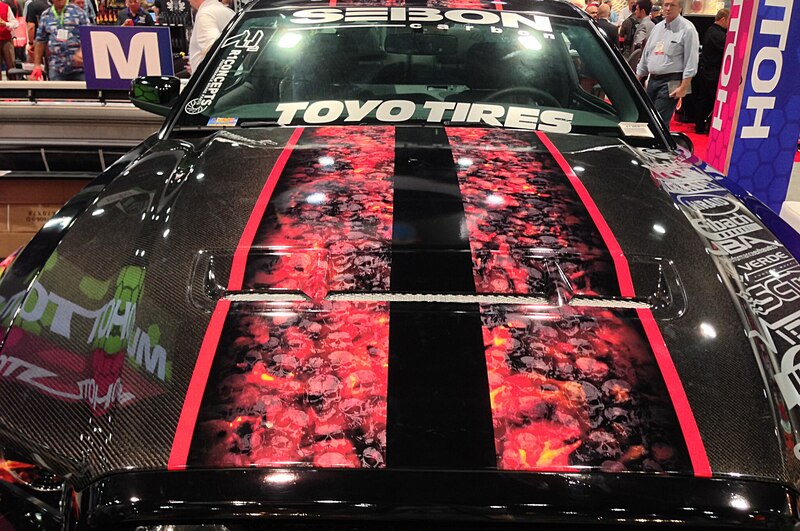 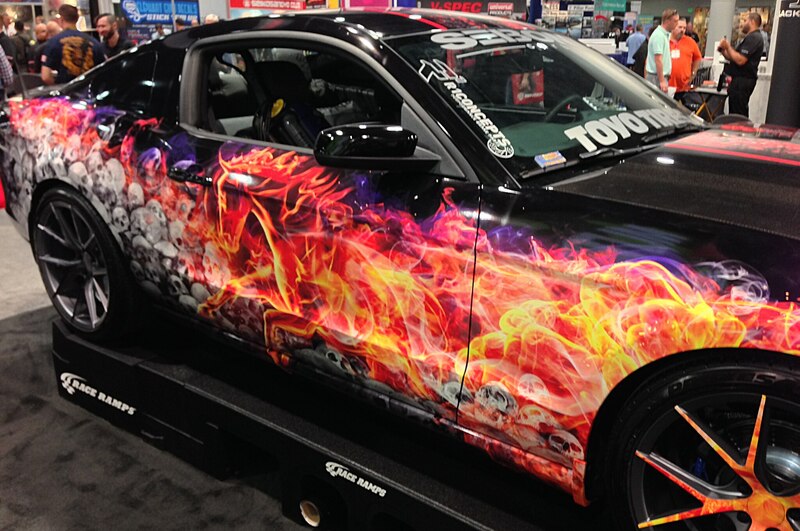 This car is gloriously happy on its tires. 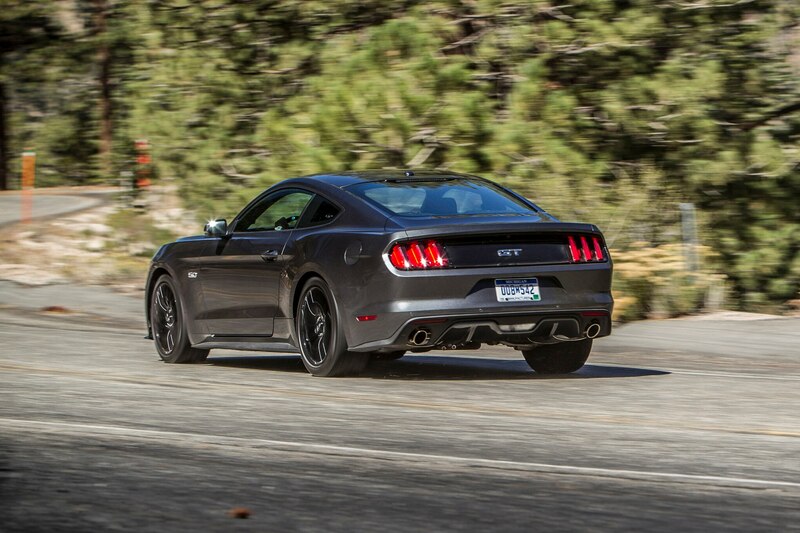 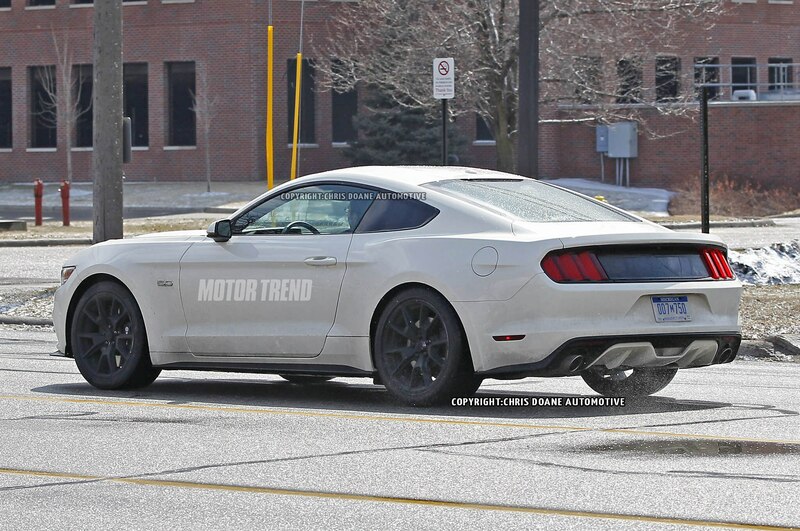 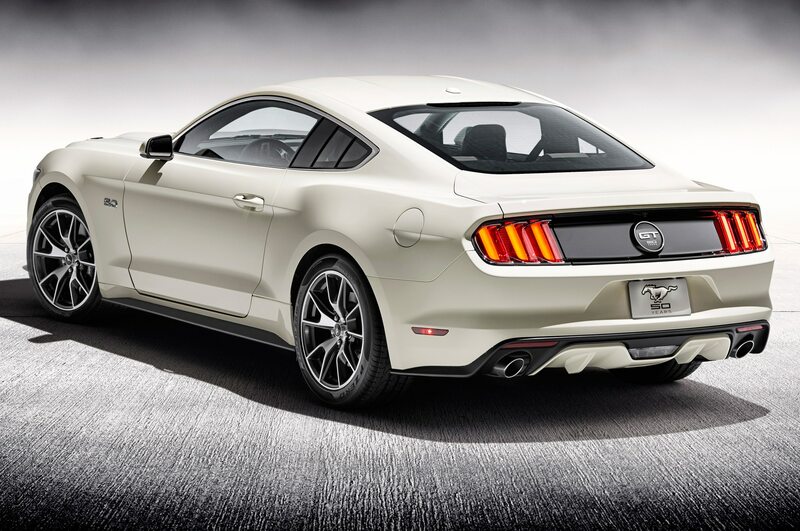 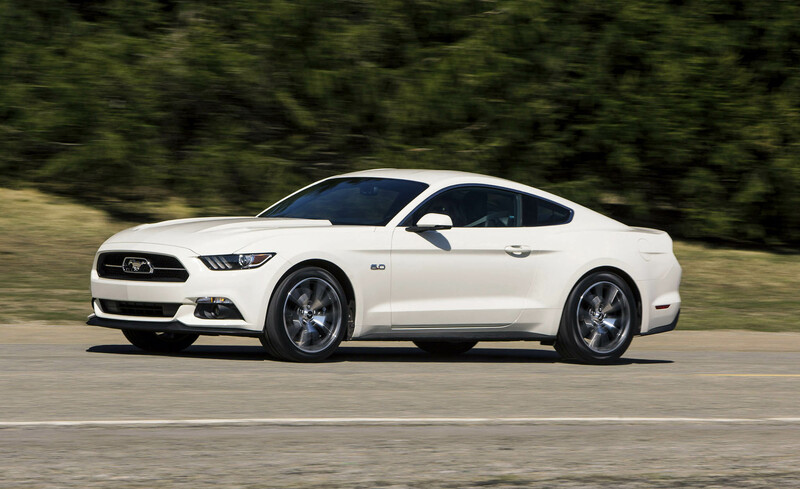 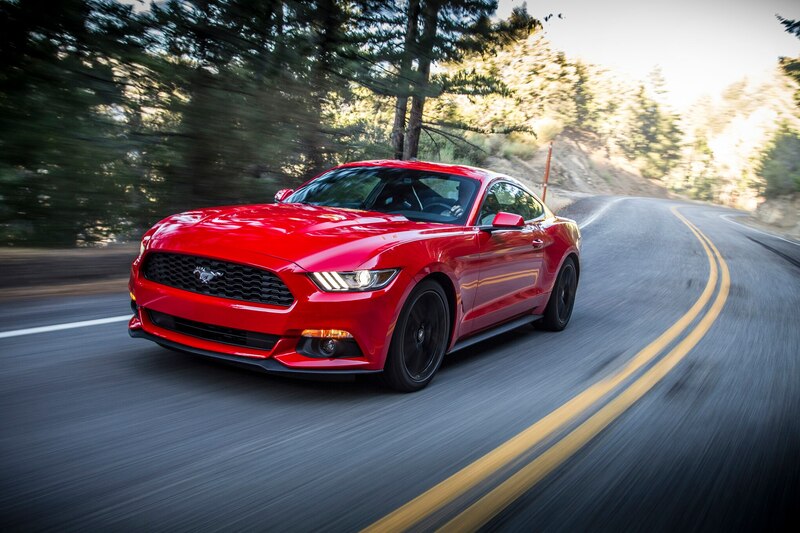 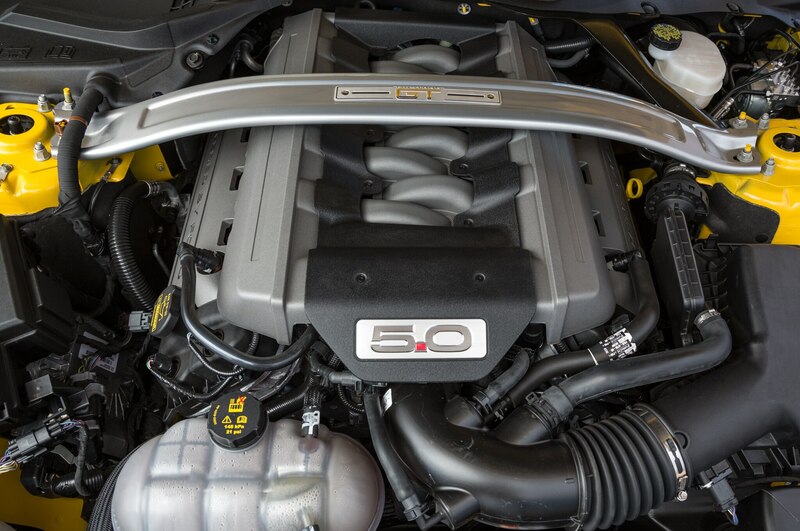 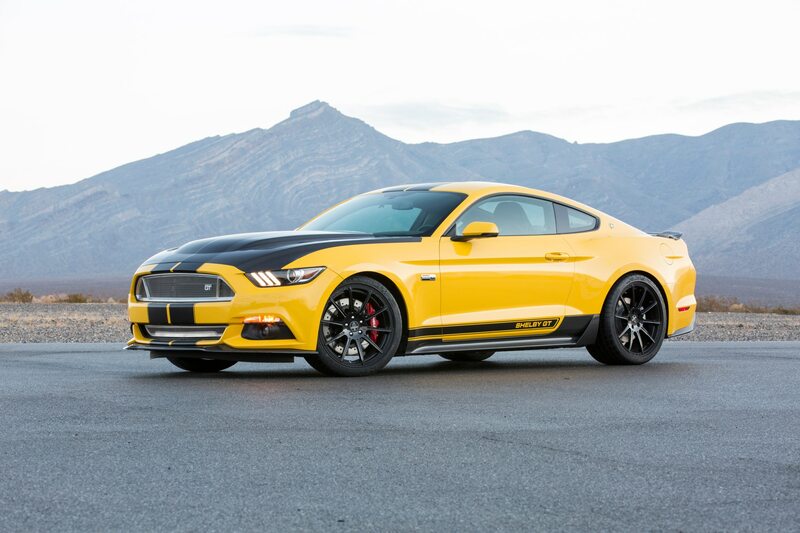 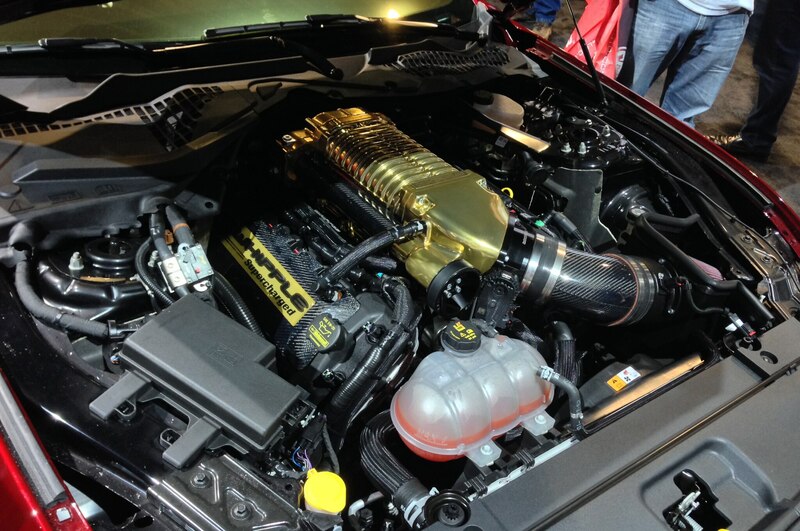 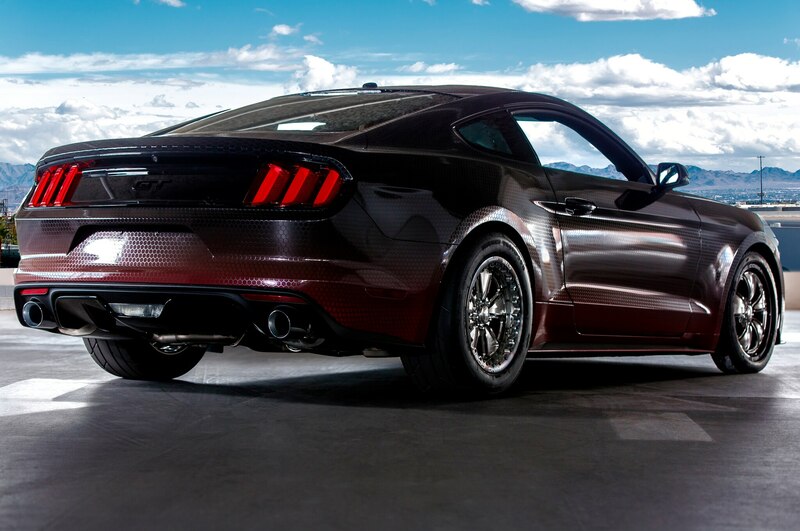 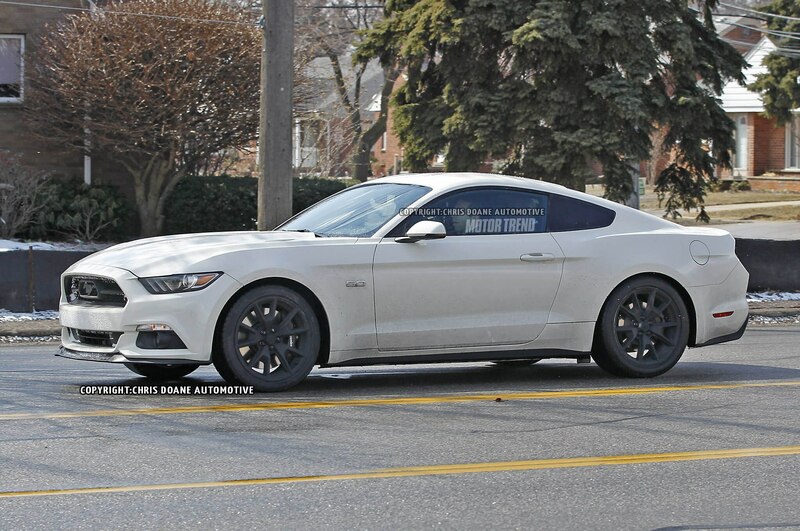 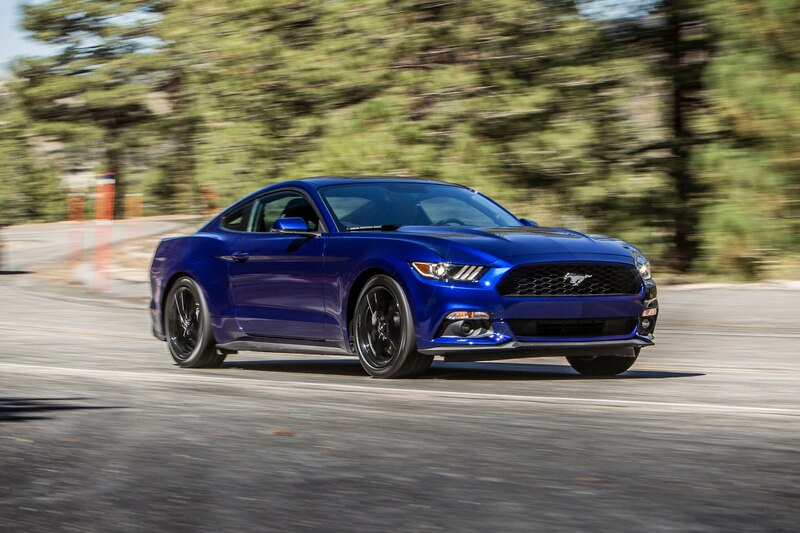 There’s more to the Mustang than just this 5.0-liter 2015 GT, of course. 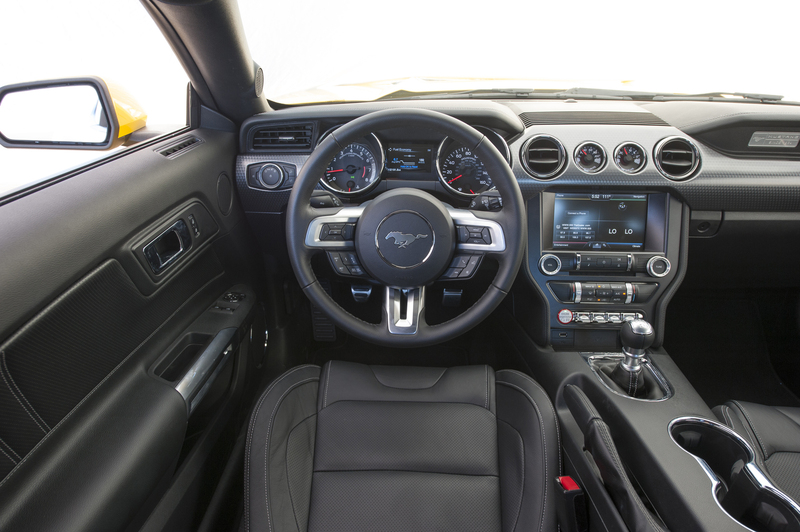 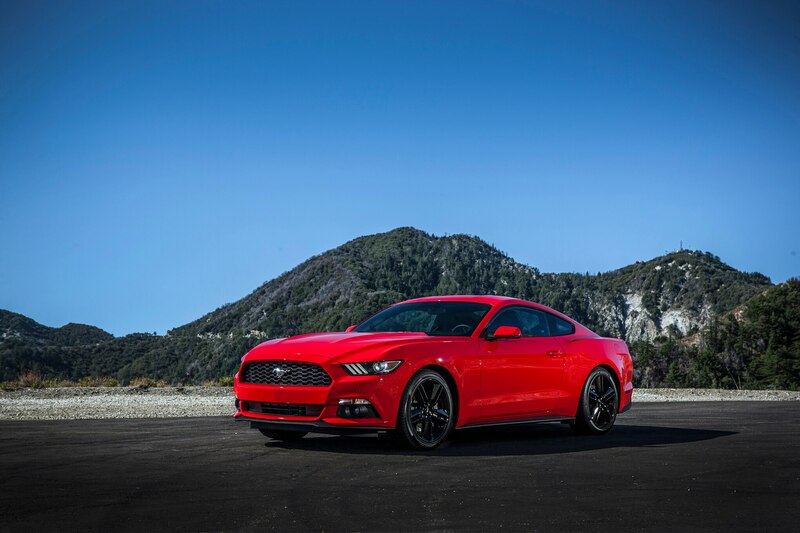 We’ve also driven the Mustang with its 310-hp, 2.3-liter turbocharged EcoBoost four-cylinder matched with a six-speed automatic, and the 300-hp 3.7-liter V-6 that will be the choice of most drivers will soon find its way into our hands. 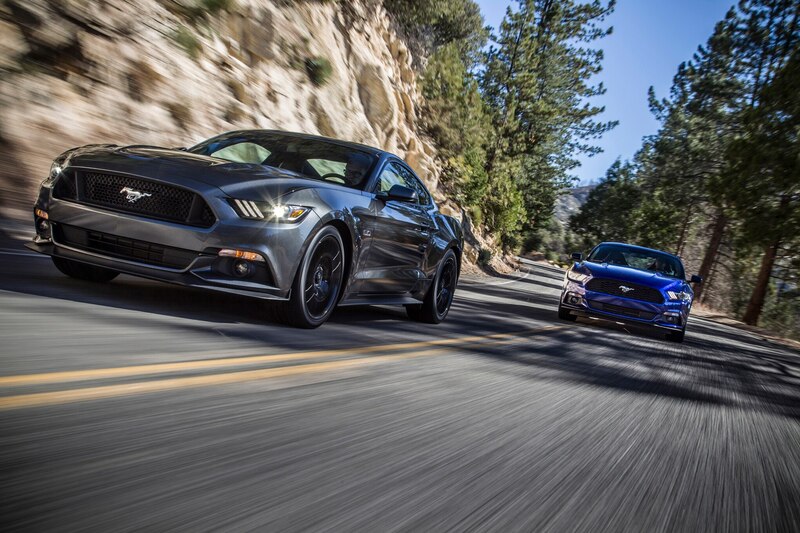 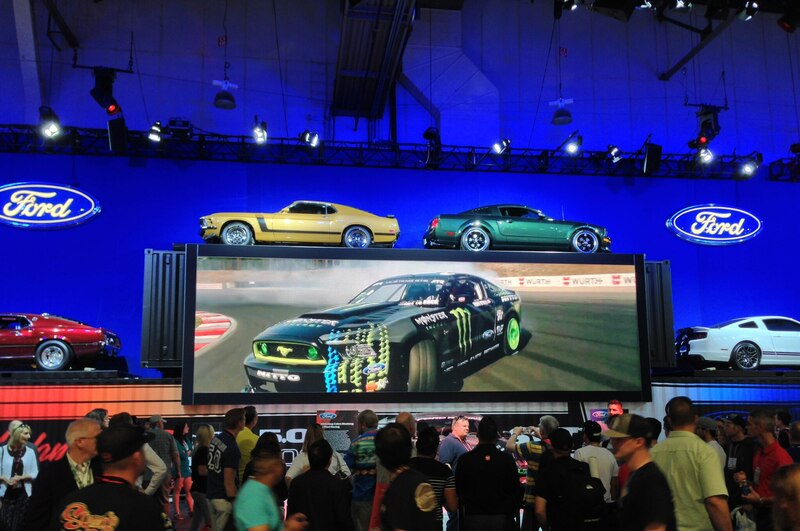 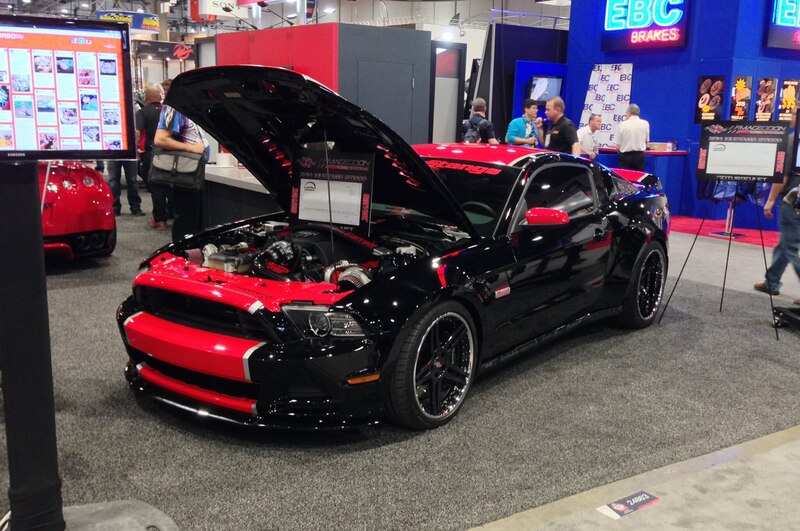 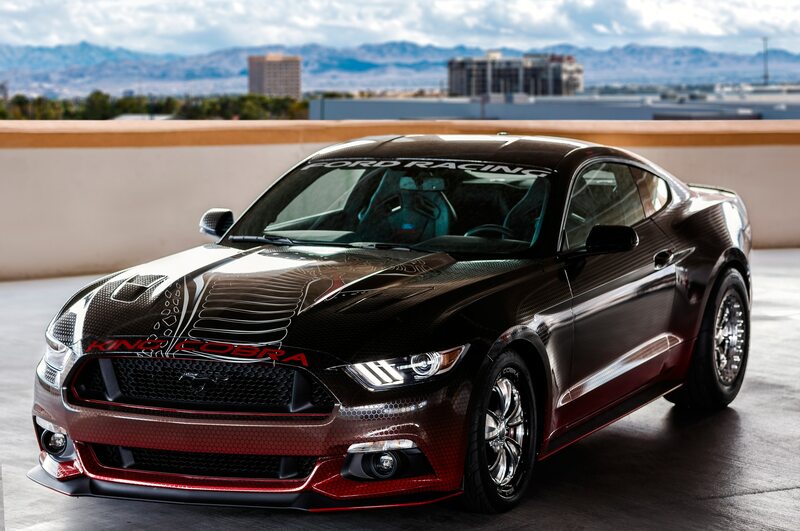 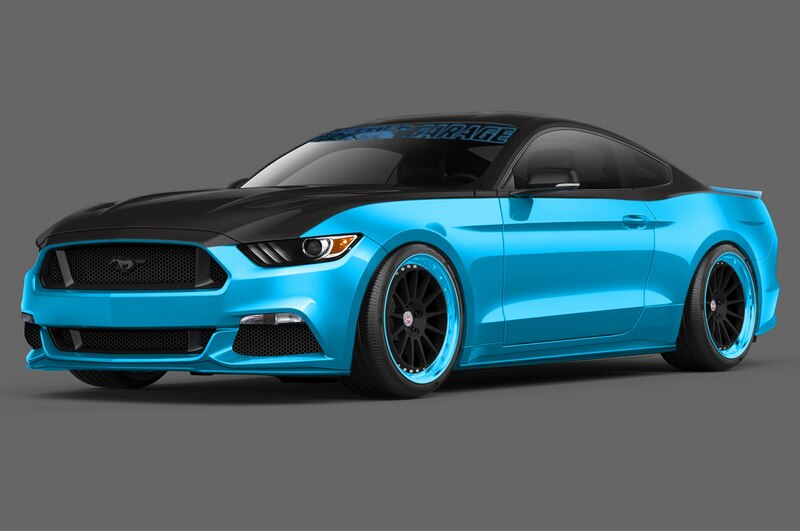 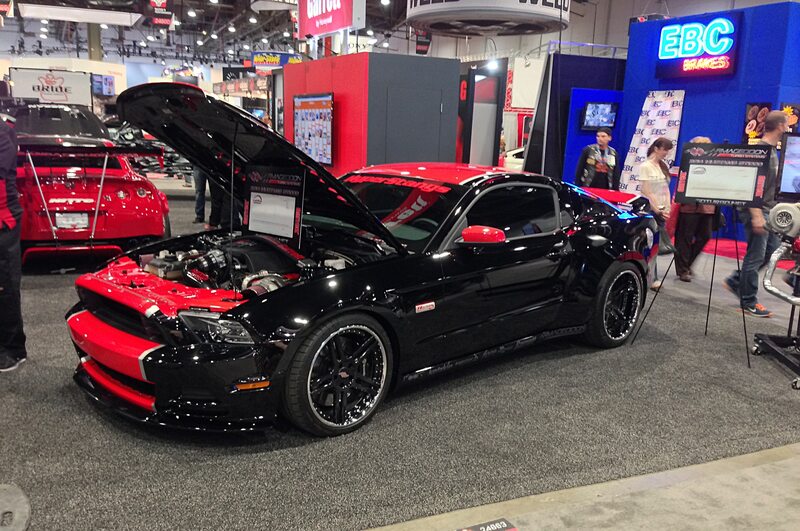 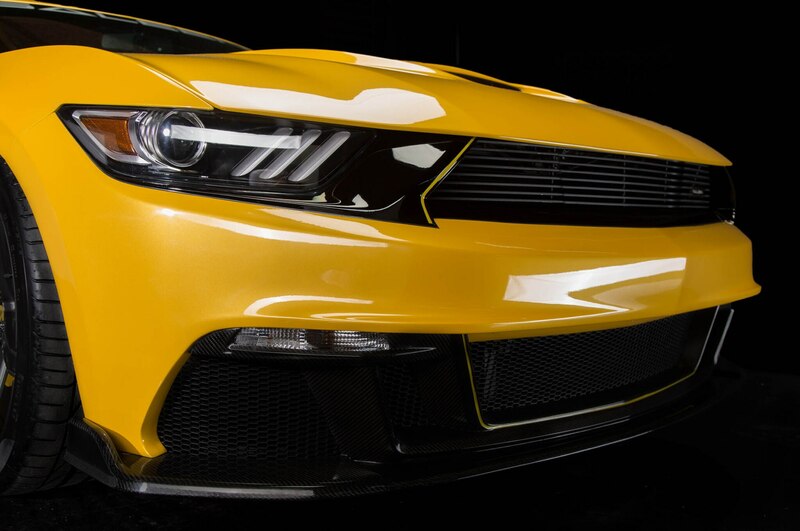 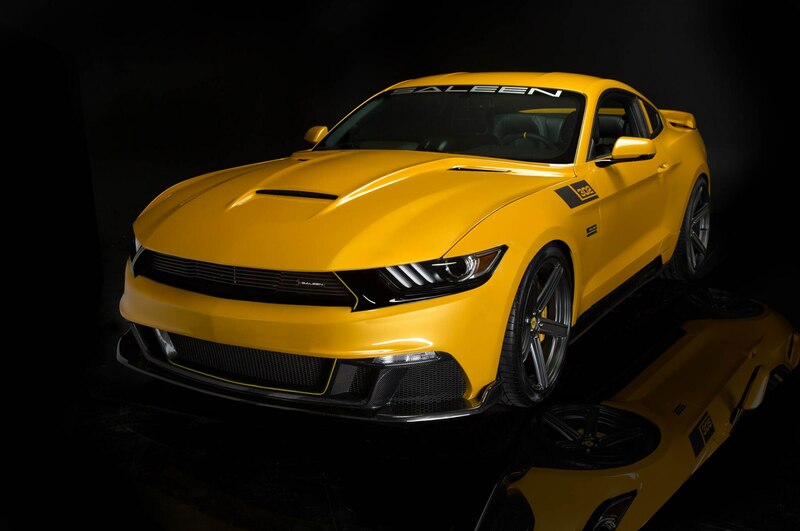 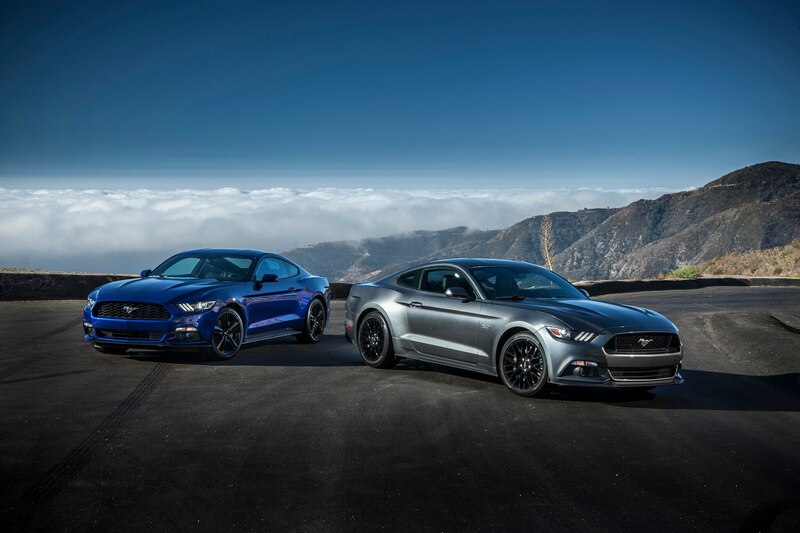 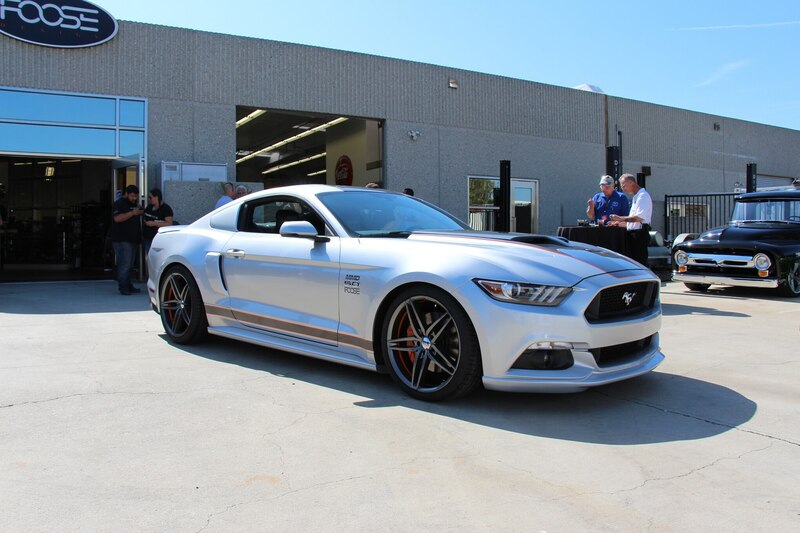 Then there are the high-performance models to come that will put the 2015 Ford Mustang on par with the specialty versions of the Chevrolet Camaro and Dodge Challenger. 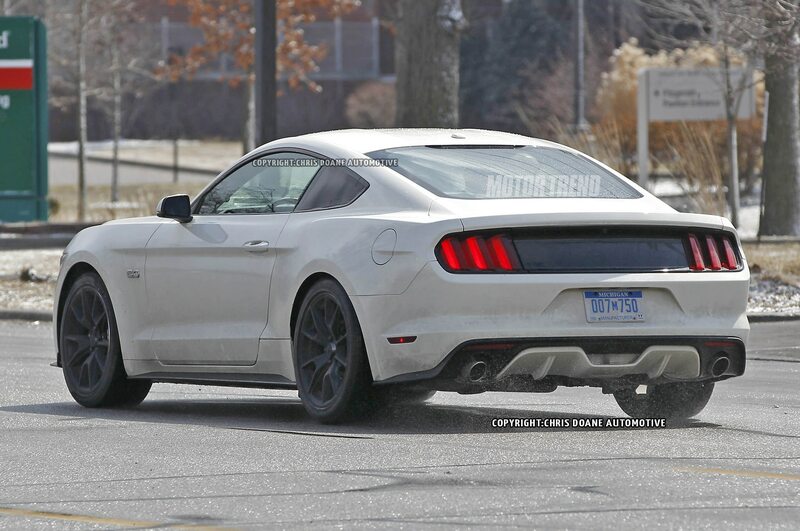 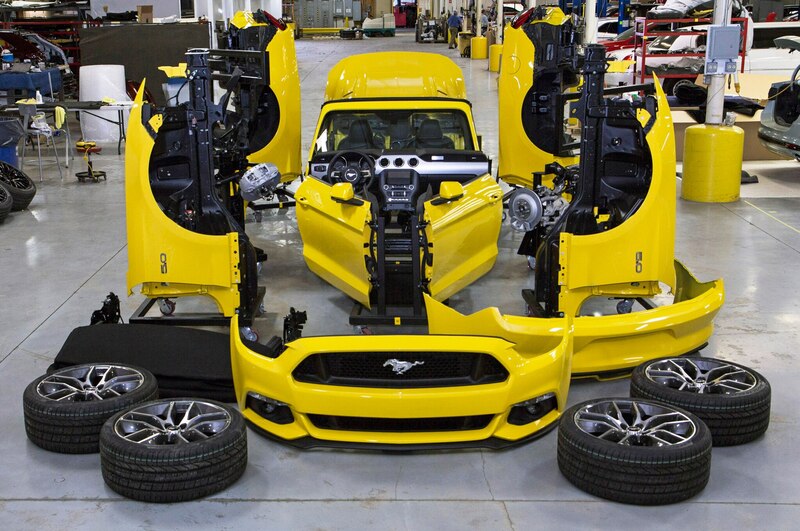 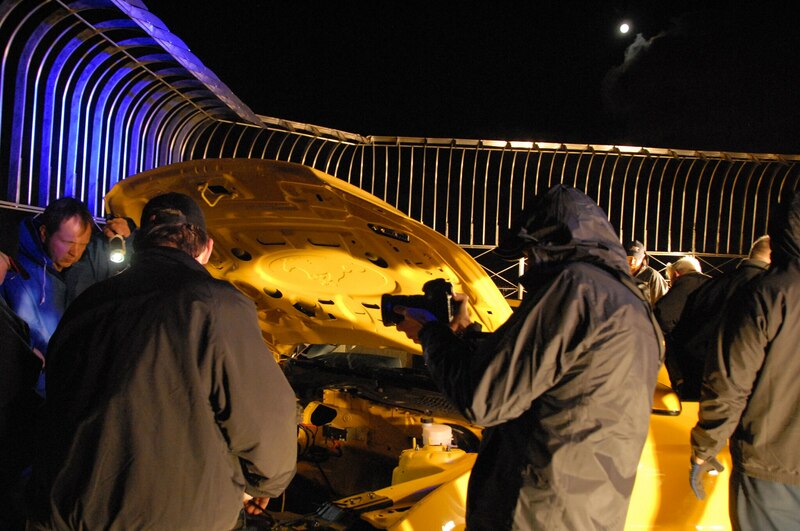 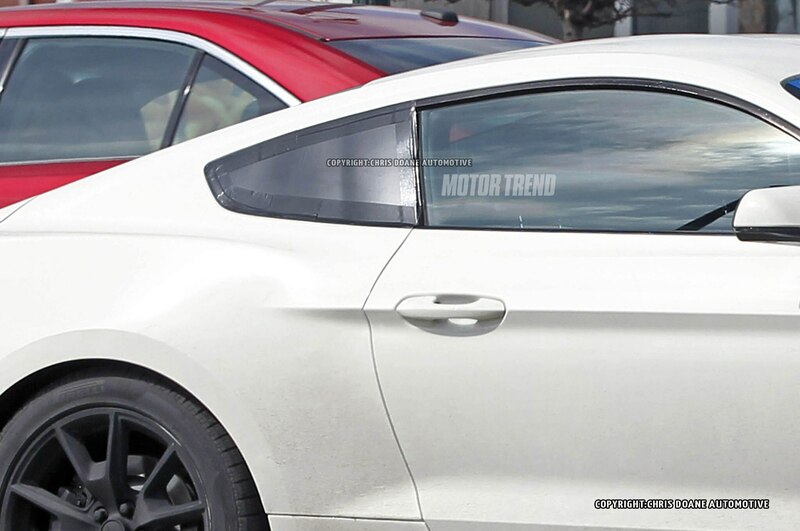 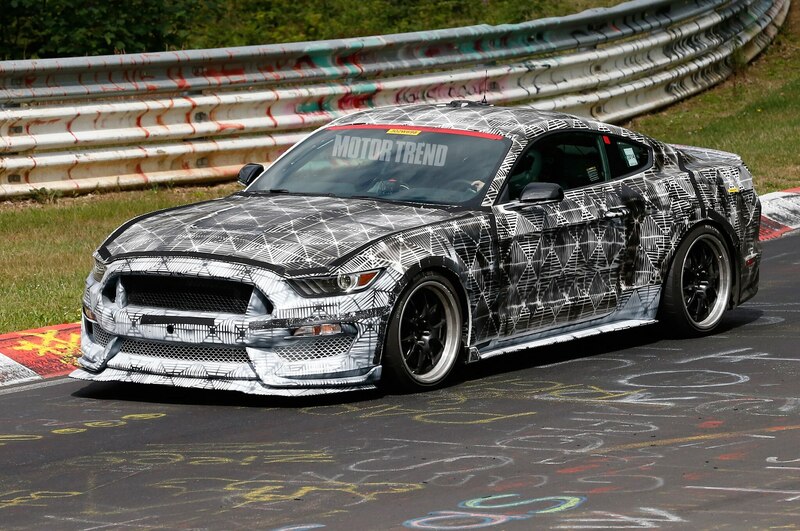 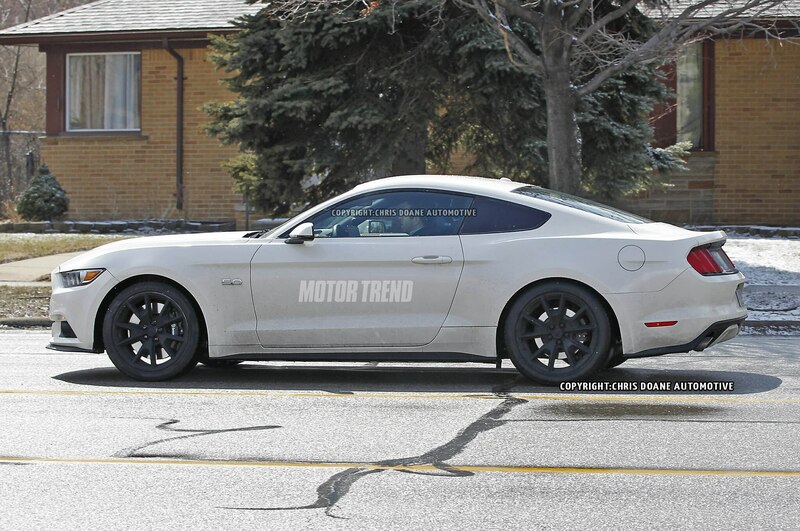 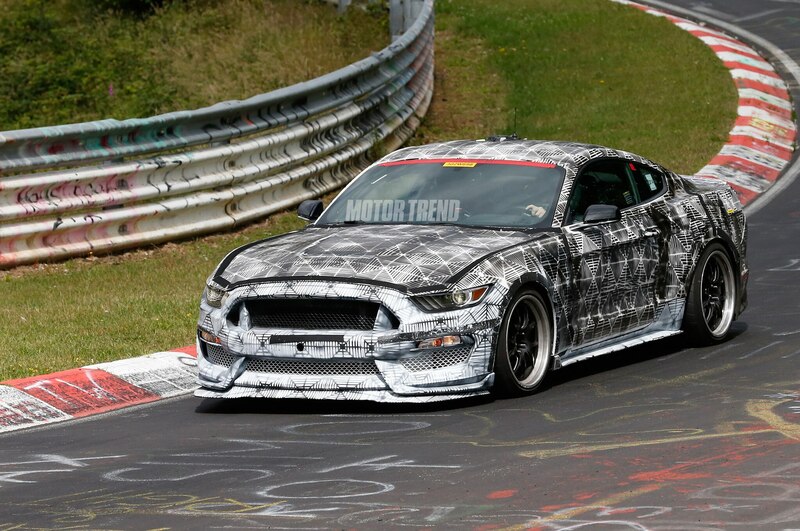 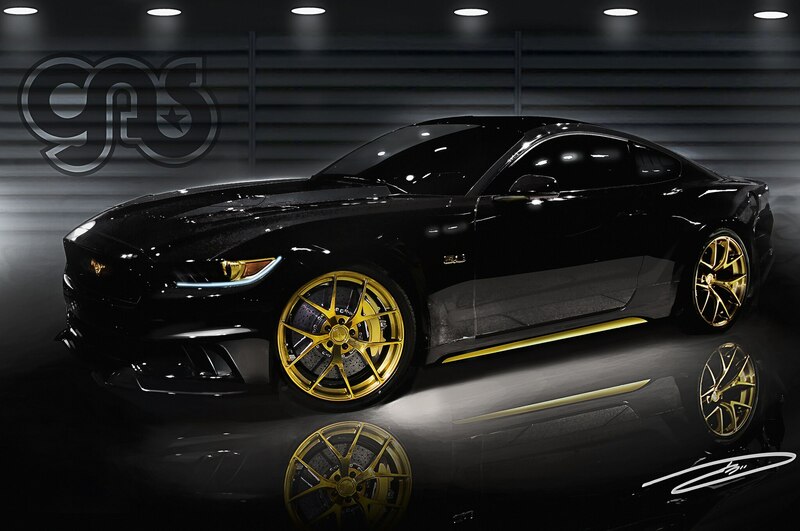 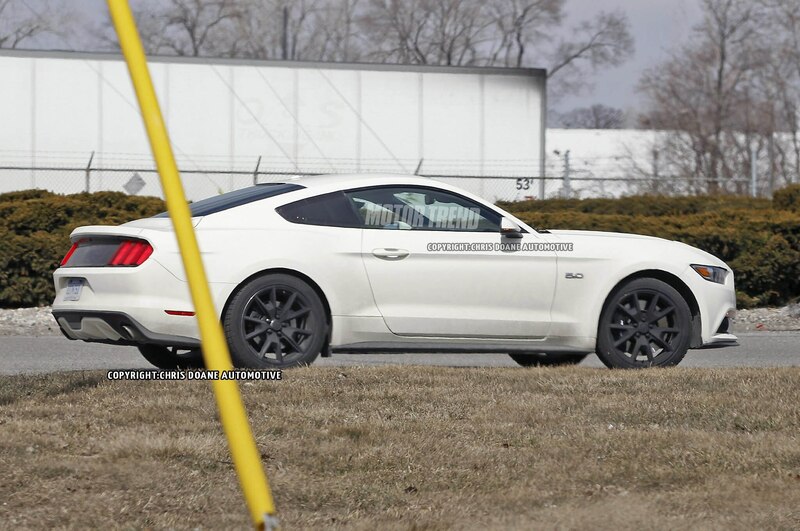 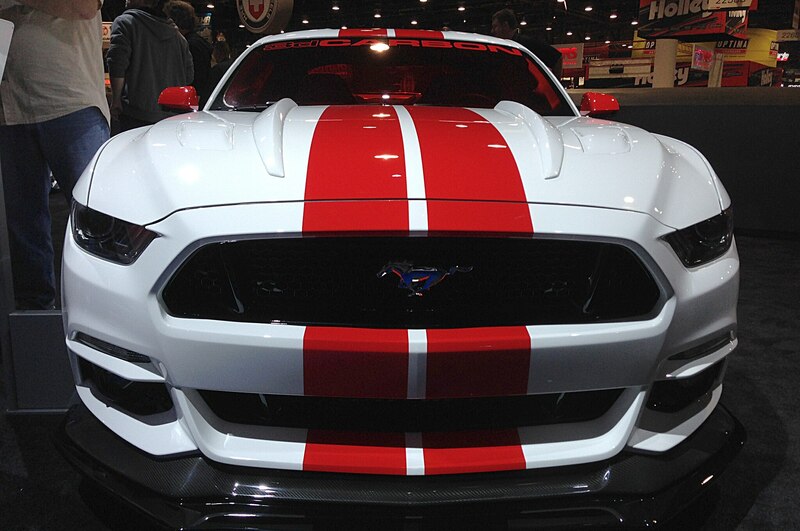 Yet the thing that we’re most excited about right now is the complete transformation in the Mustang’s personality. 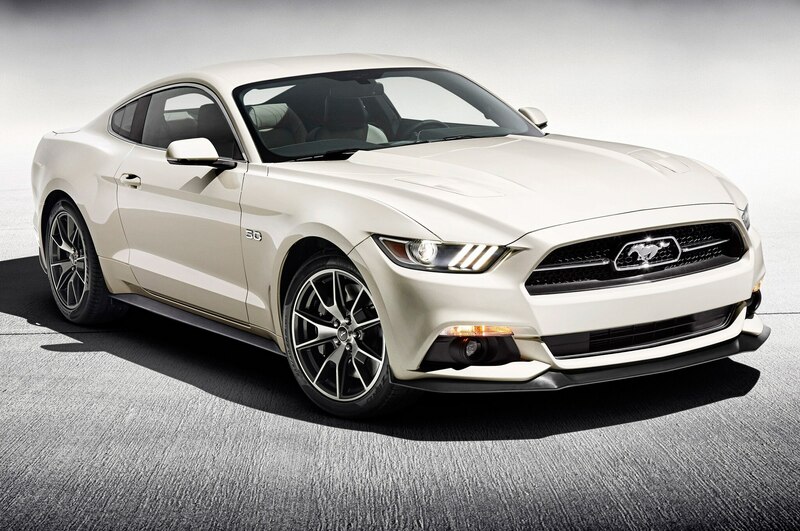 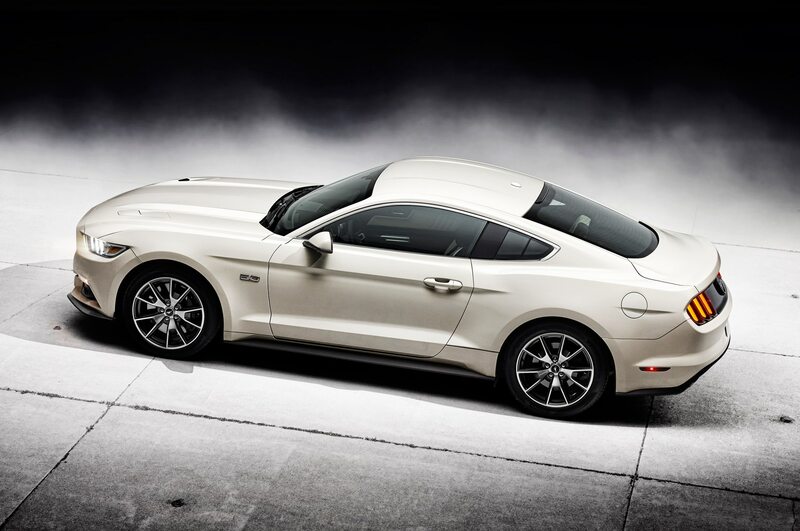 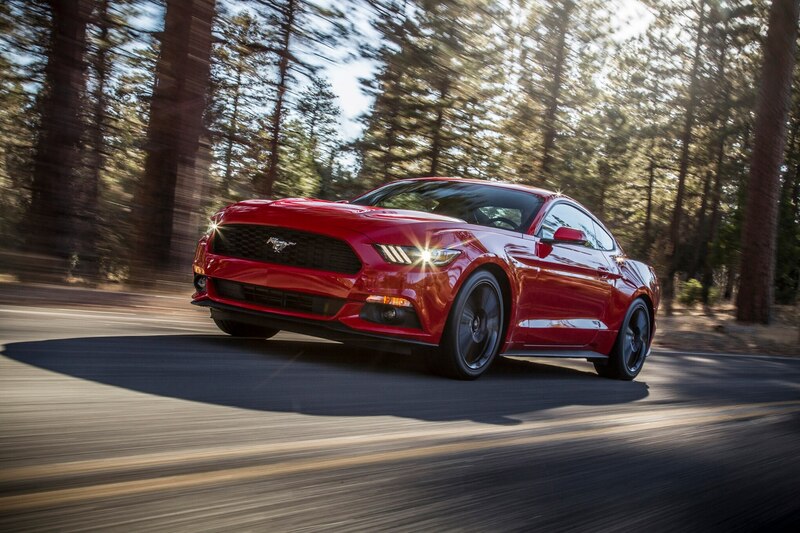 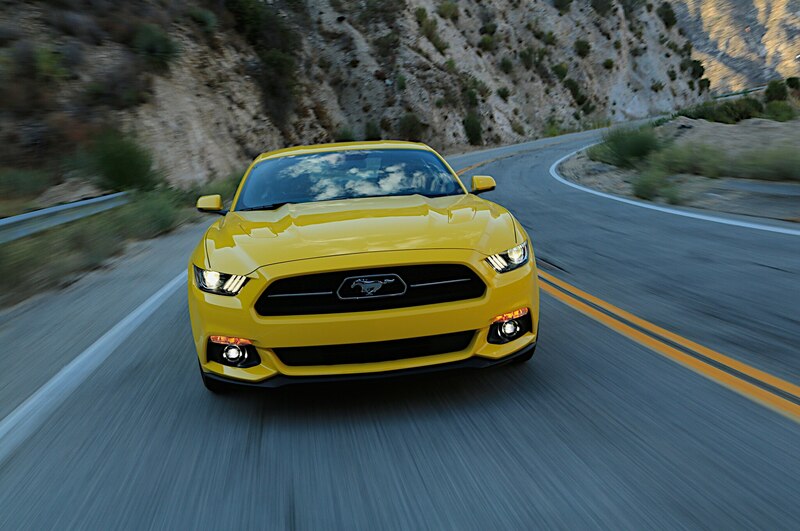 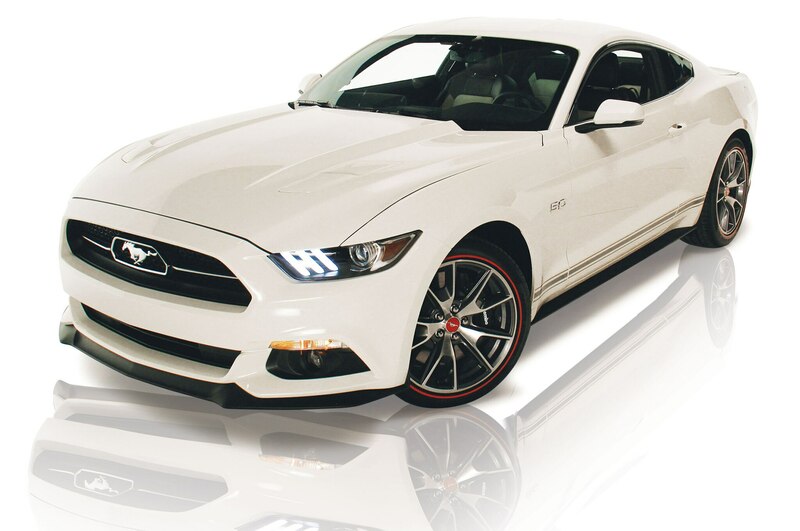 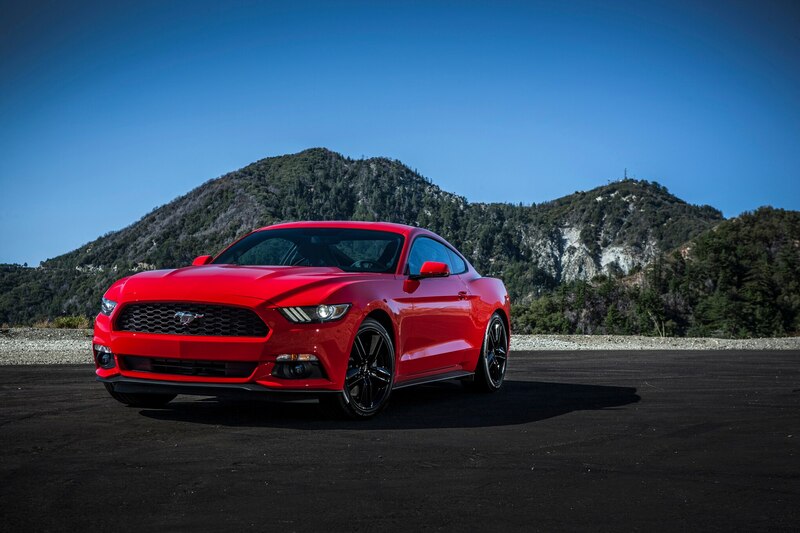 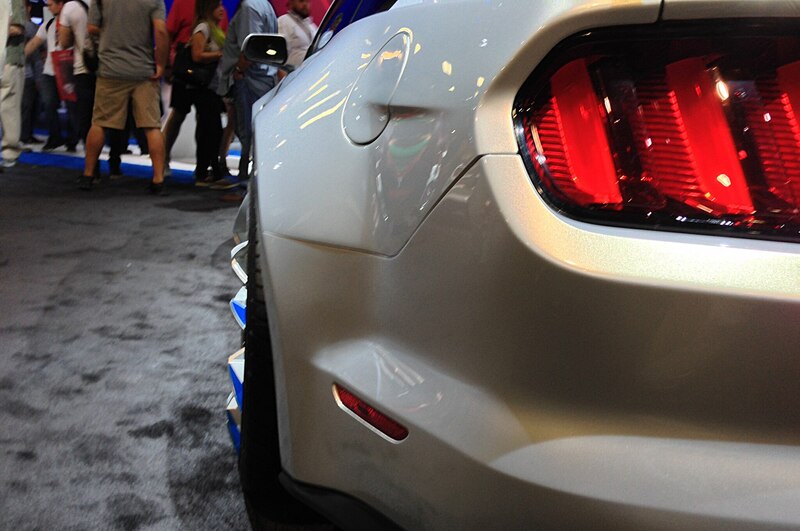 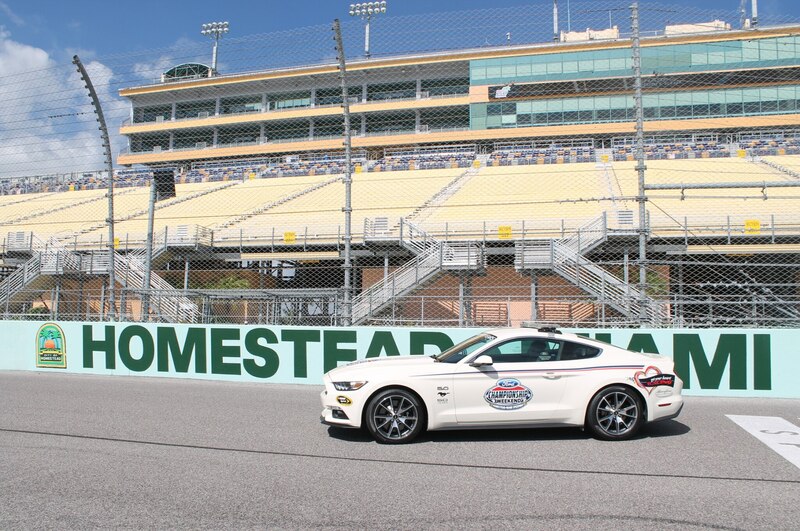 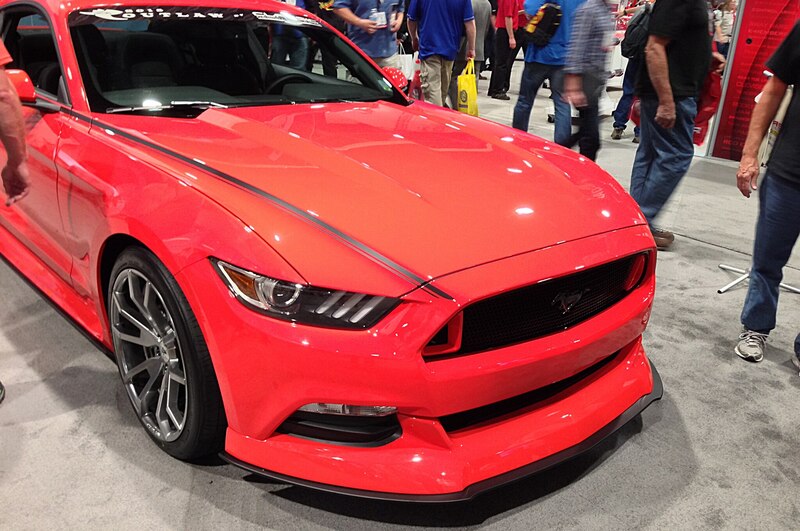 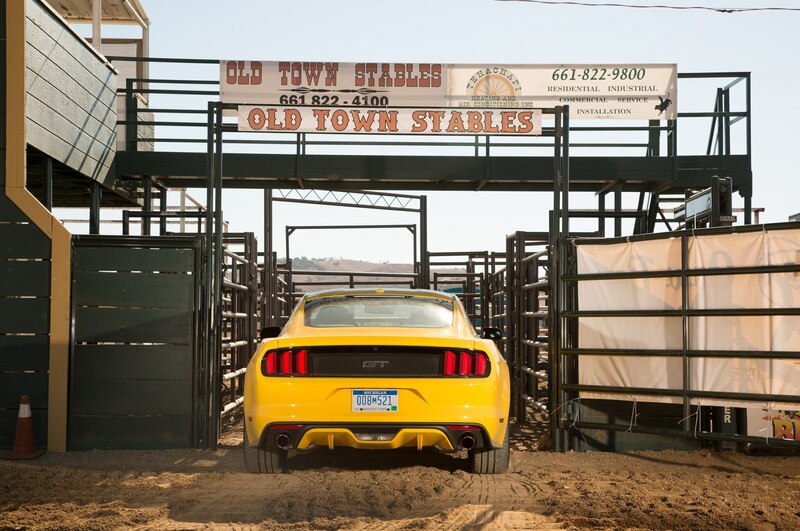 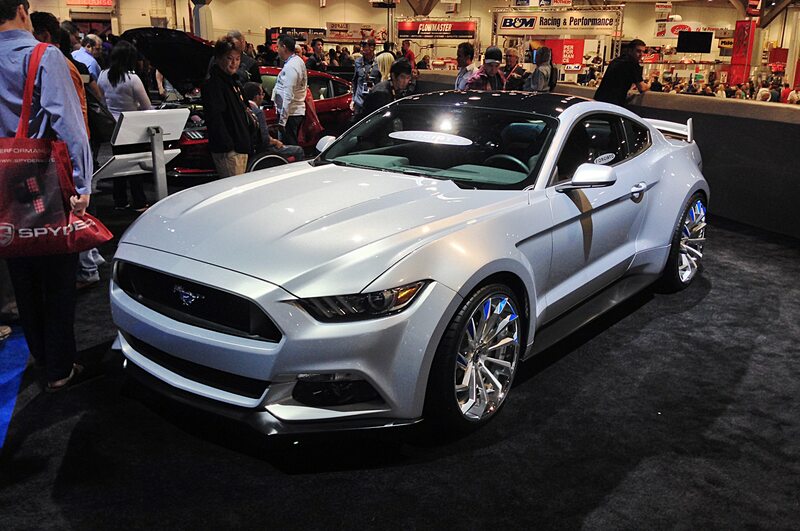 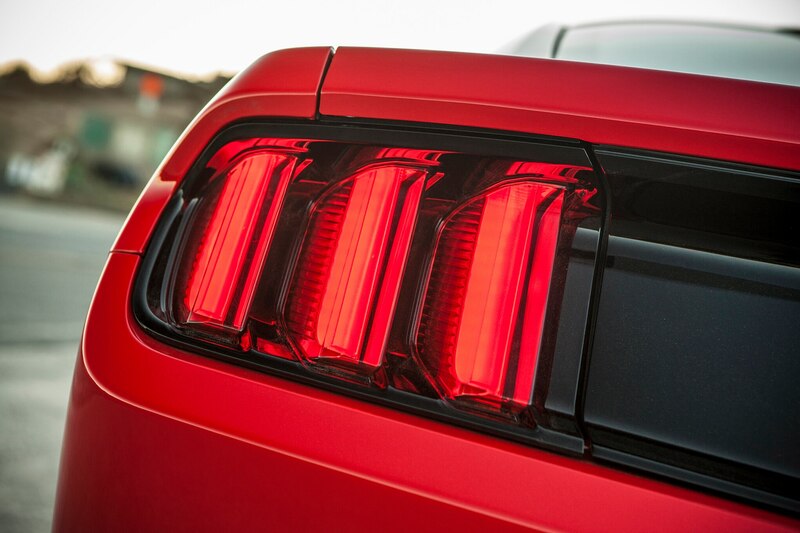 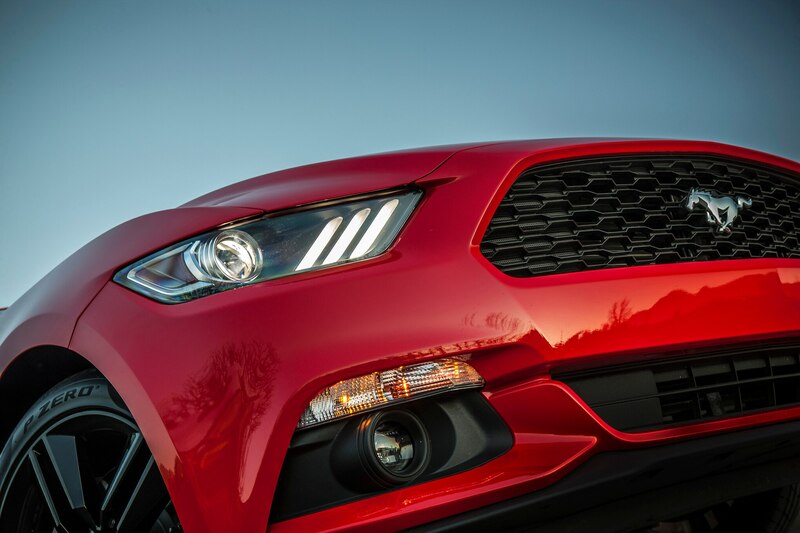 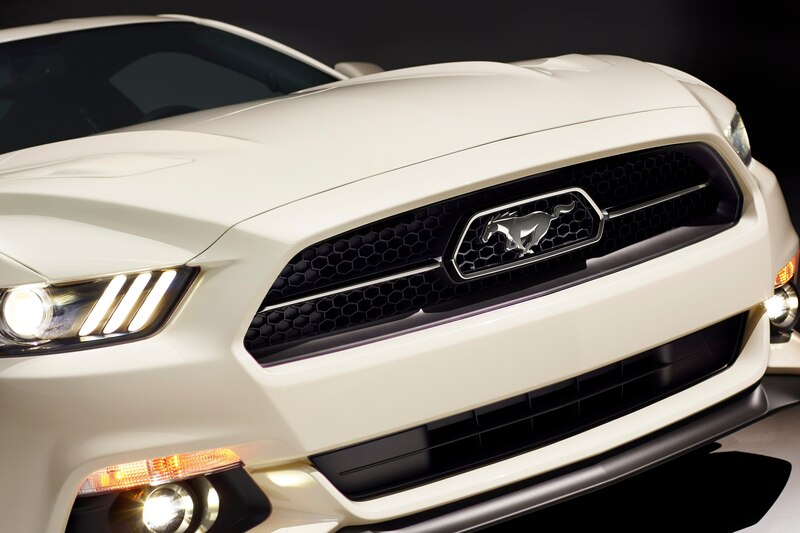 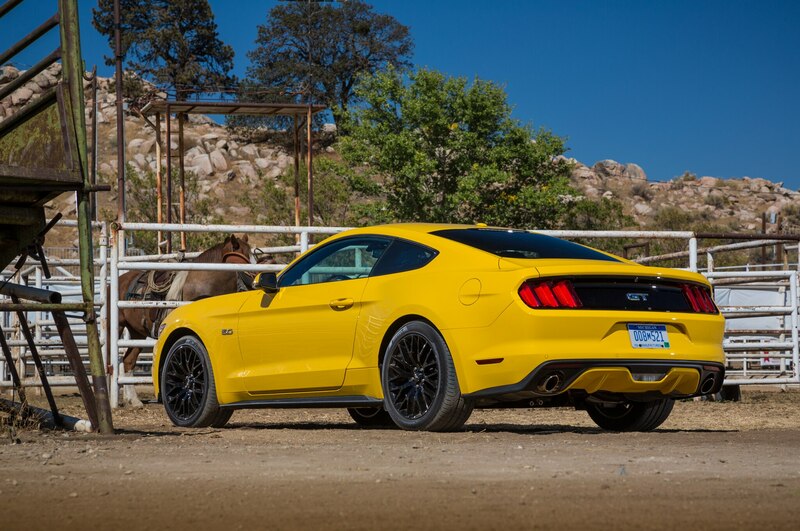 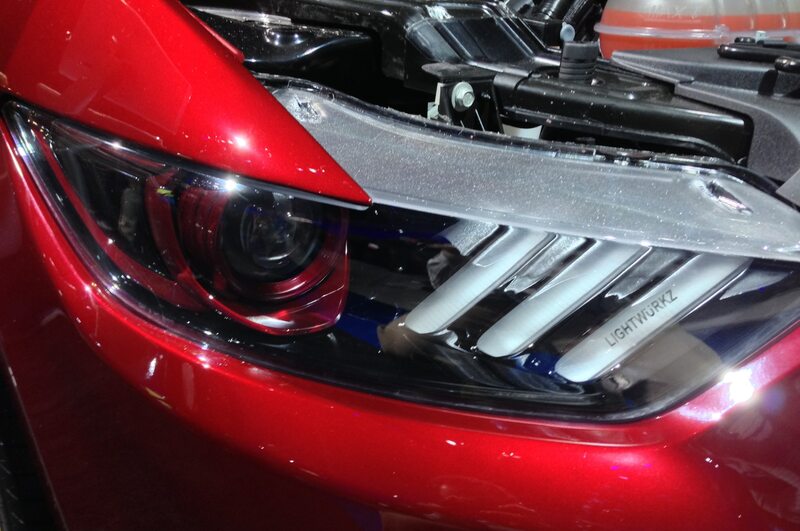 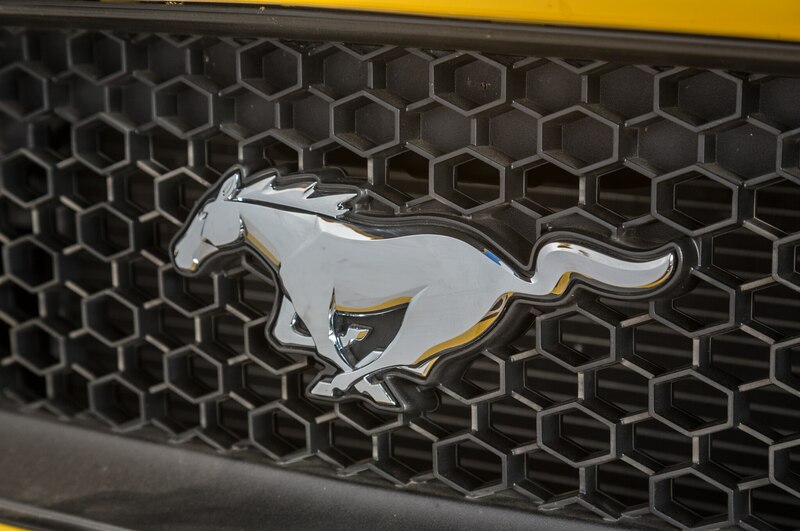 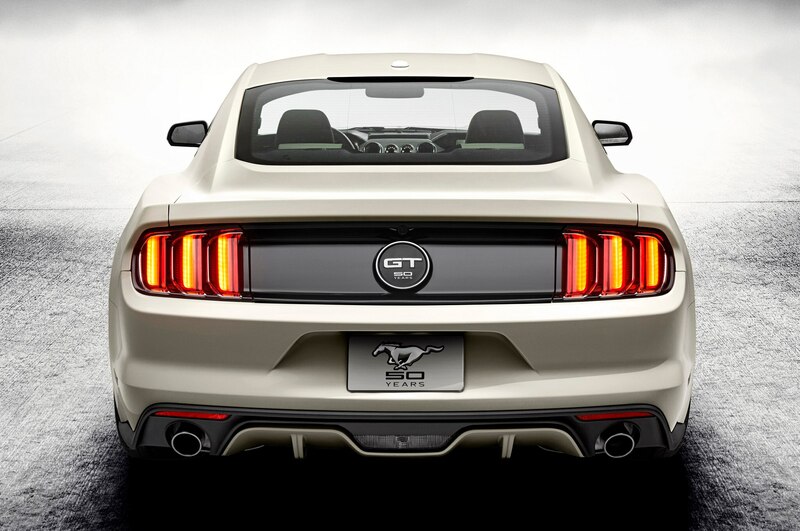 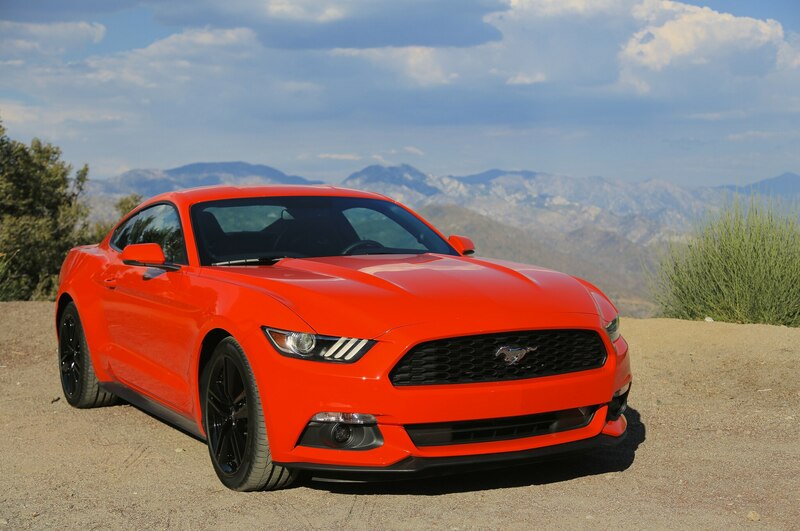 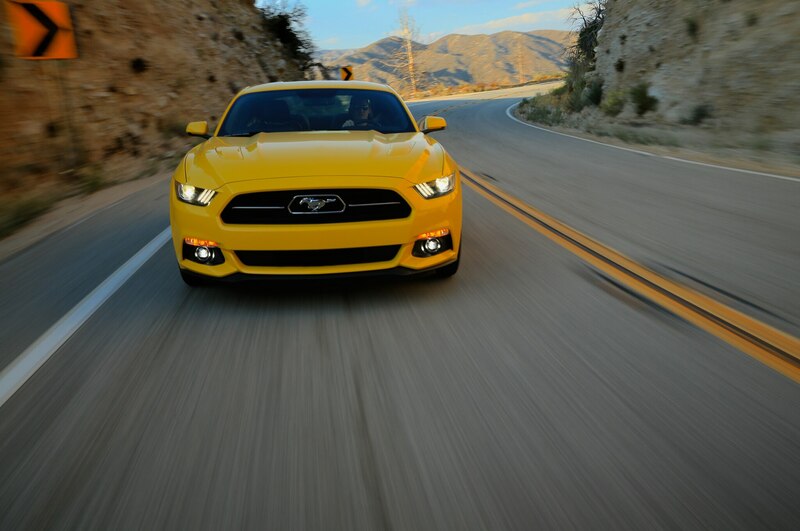 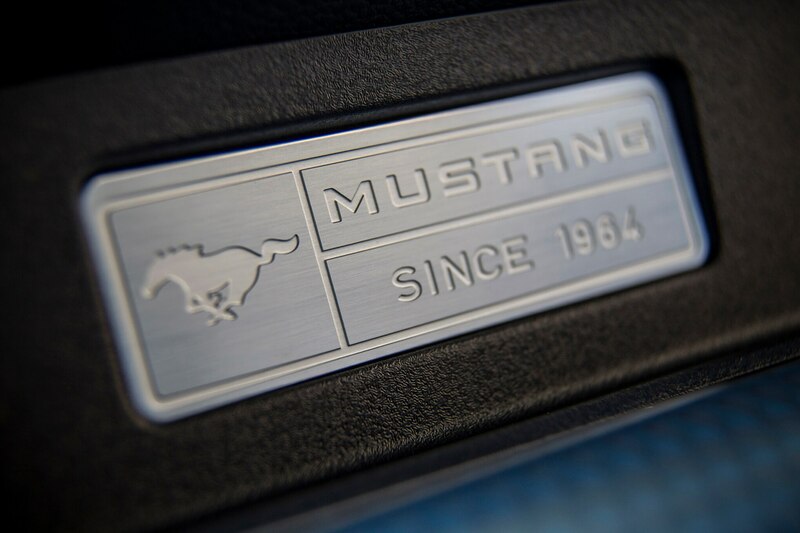 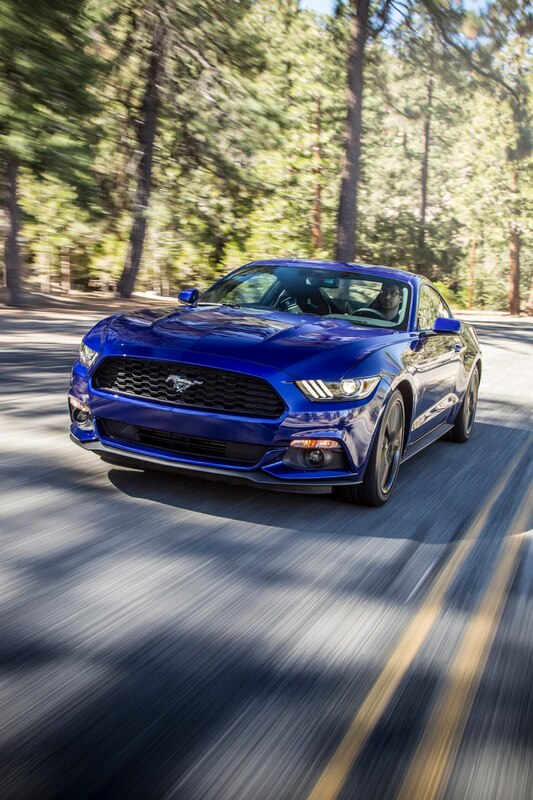 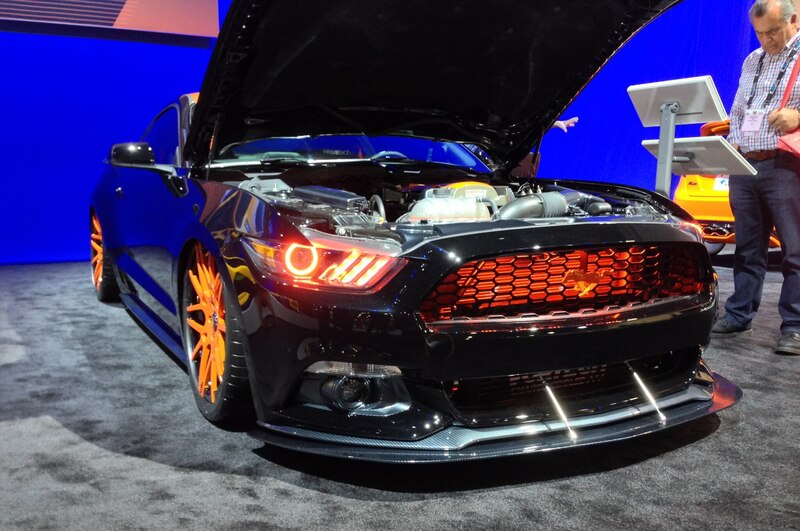 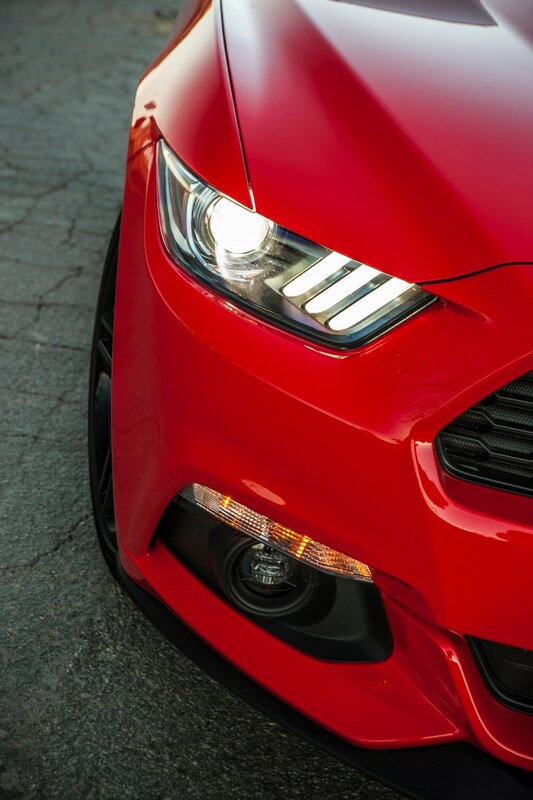 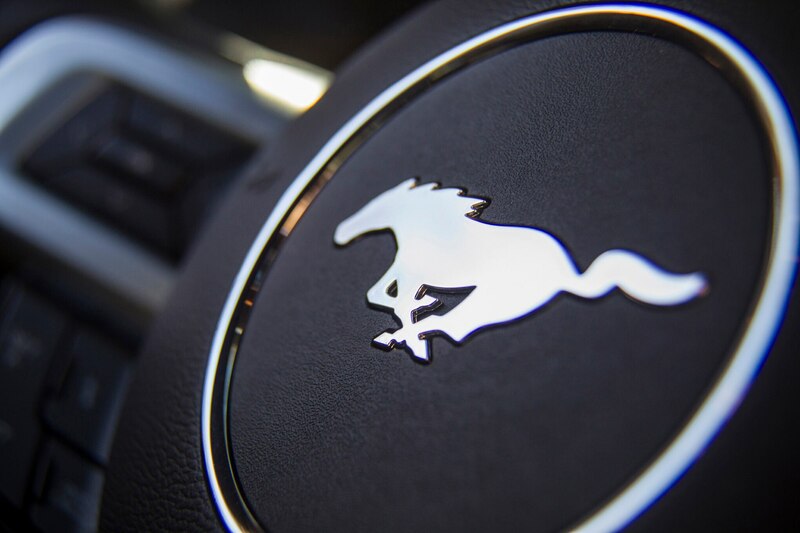 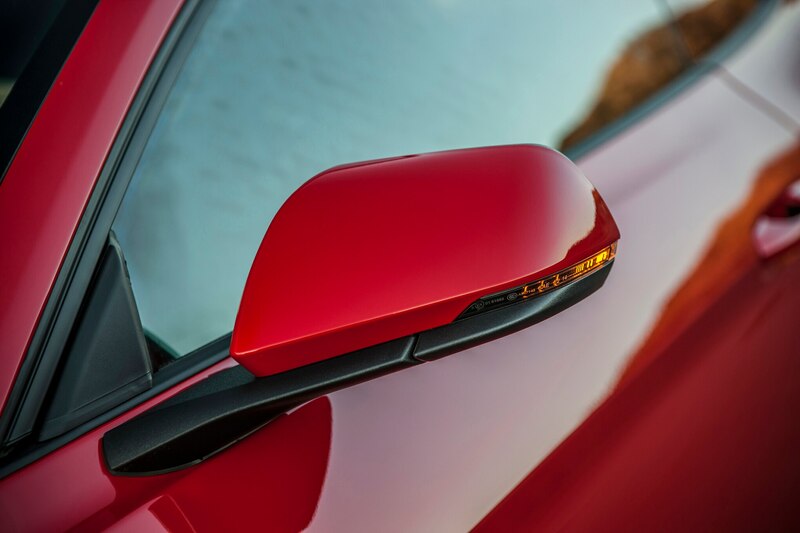 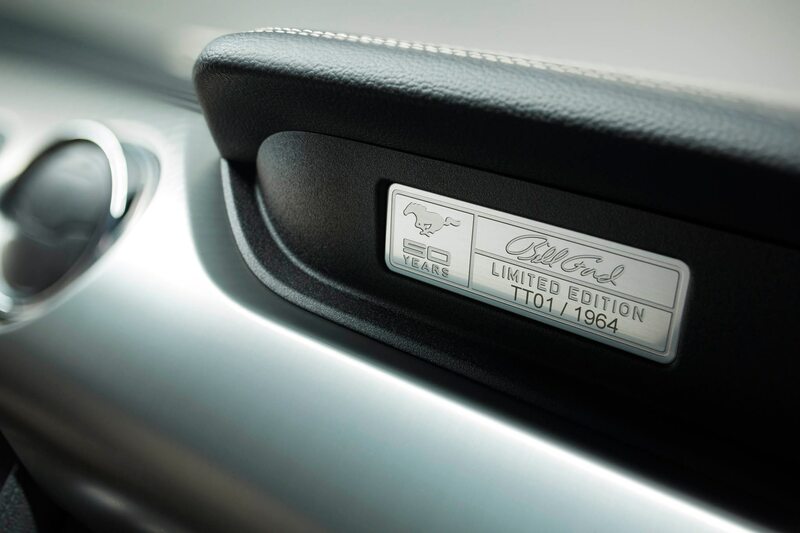 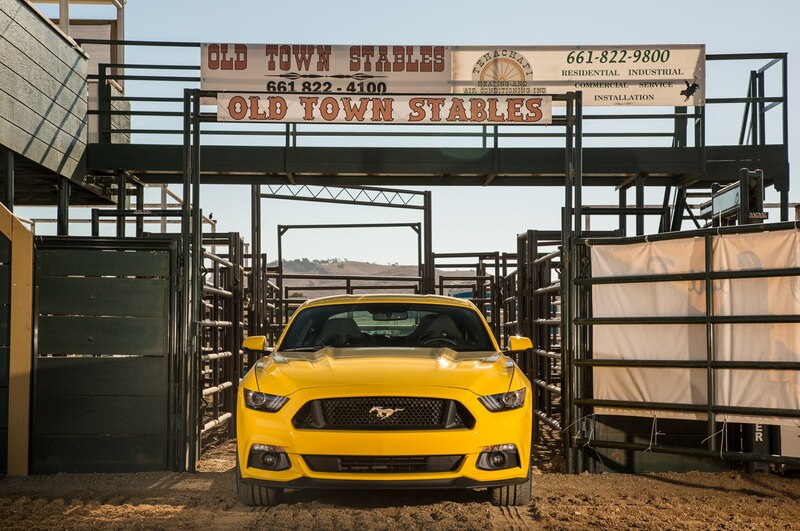 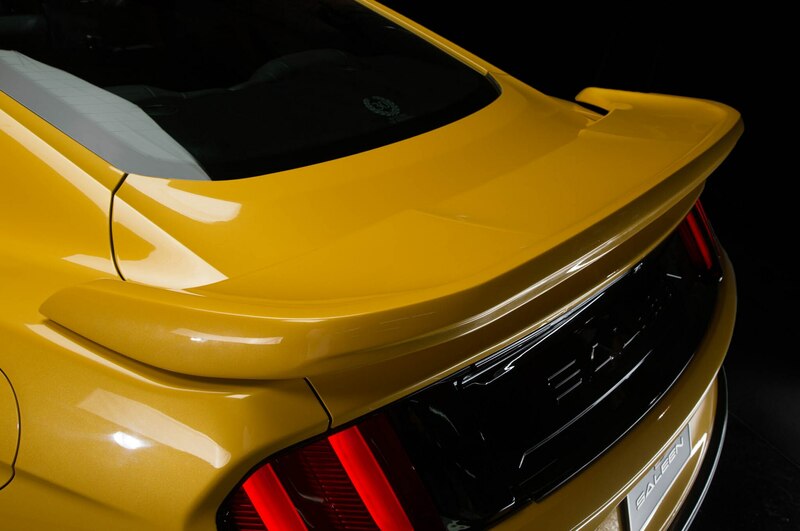 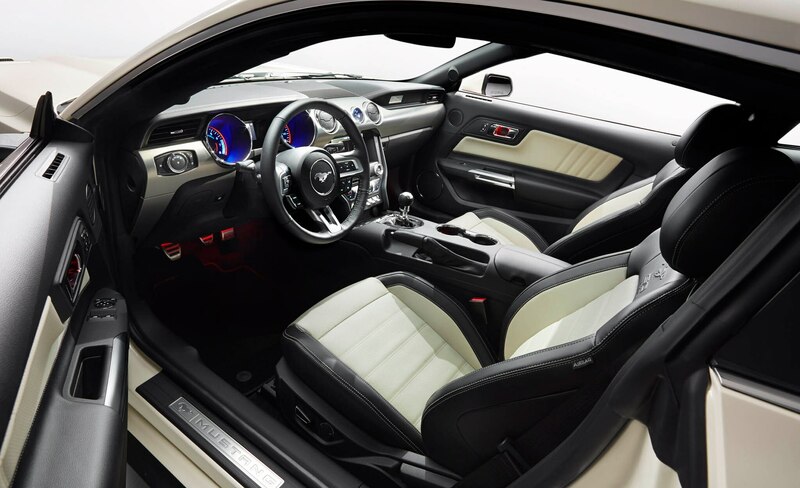 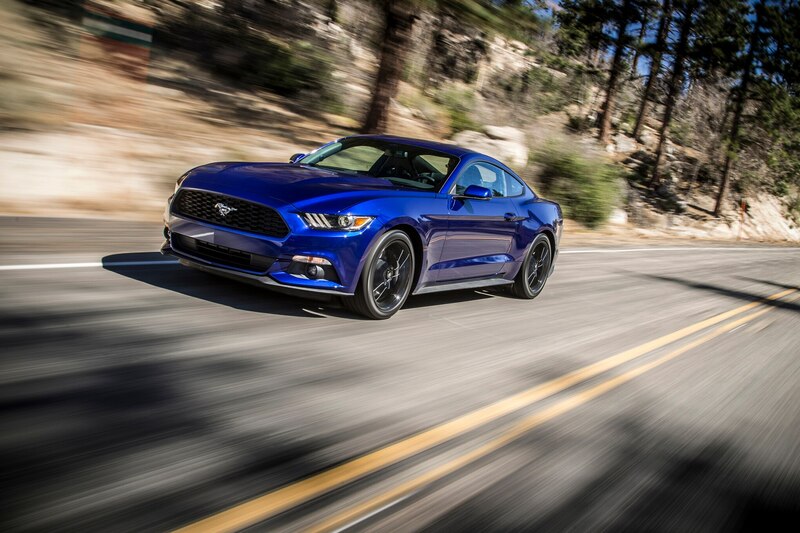 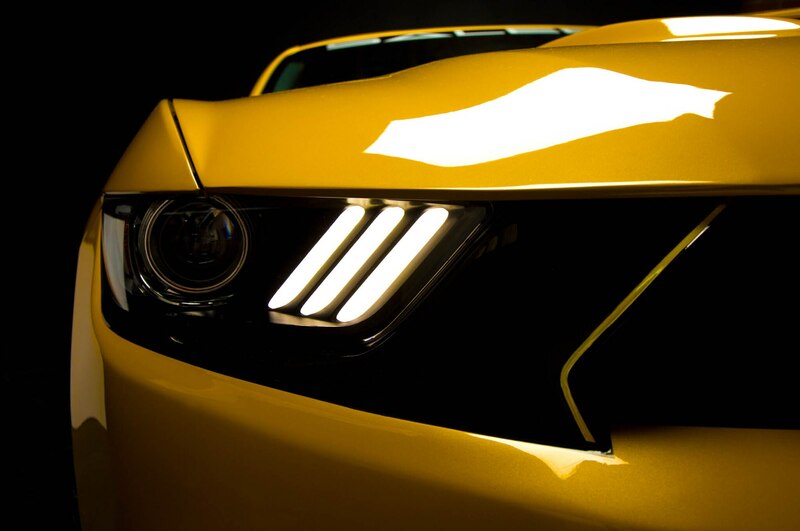 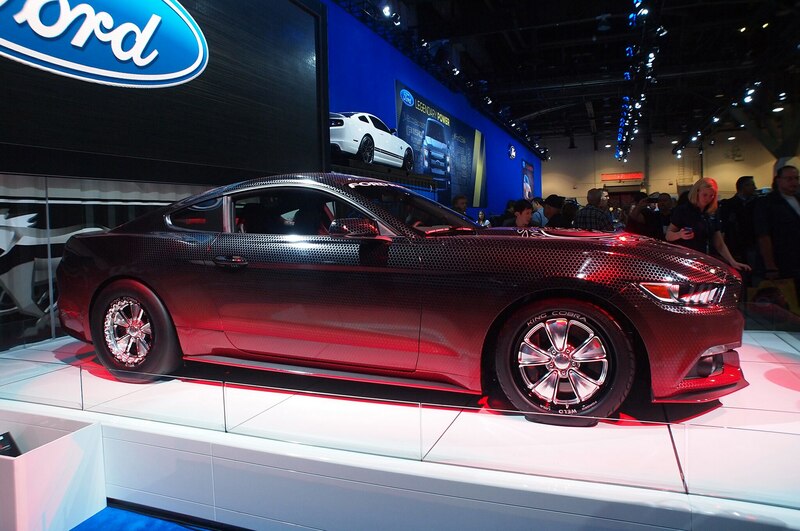 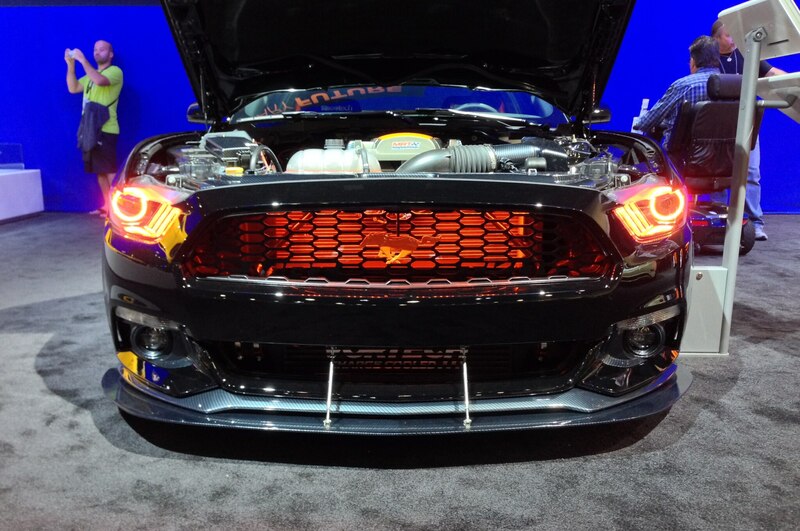 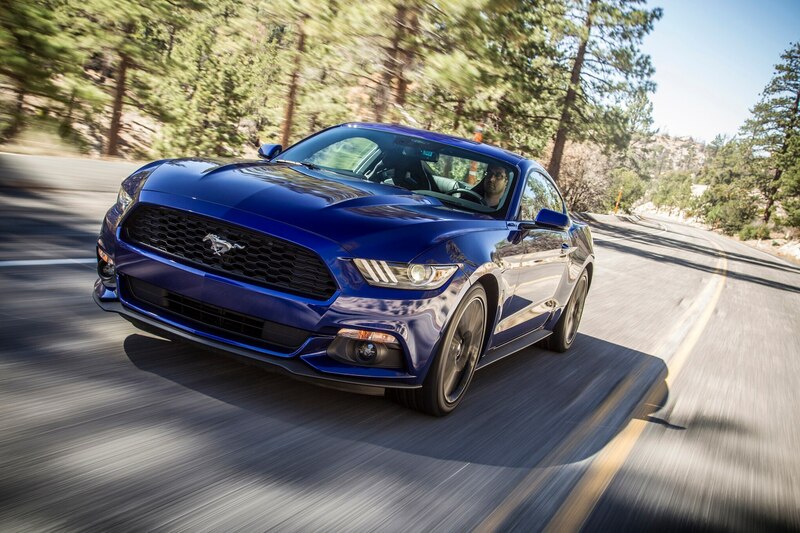 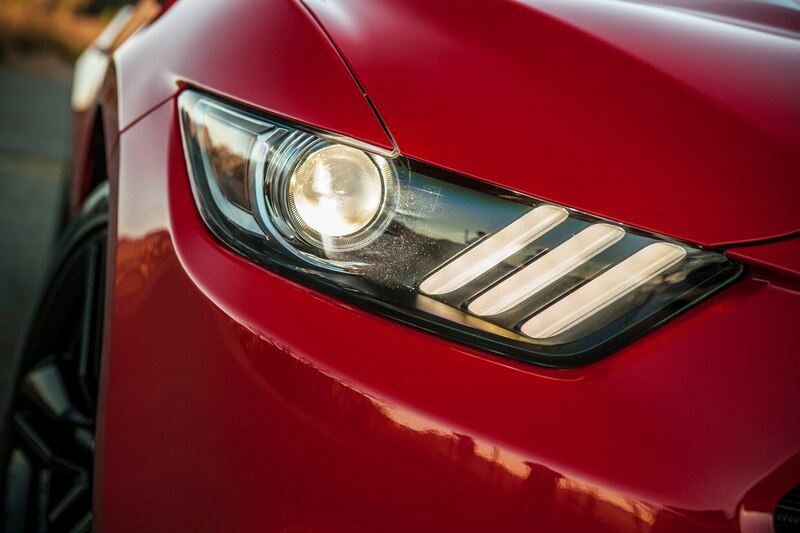 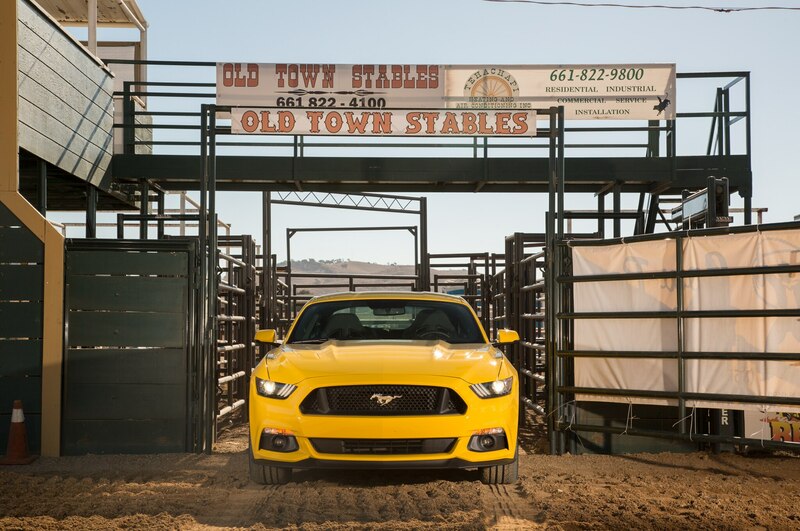 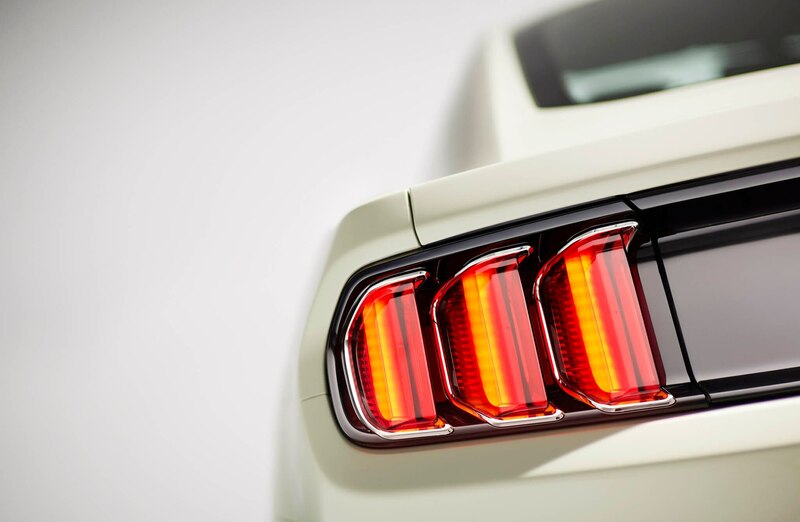 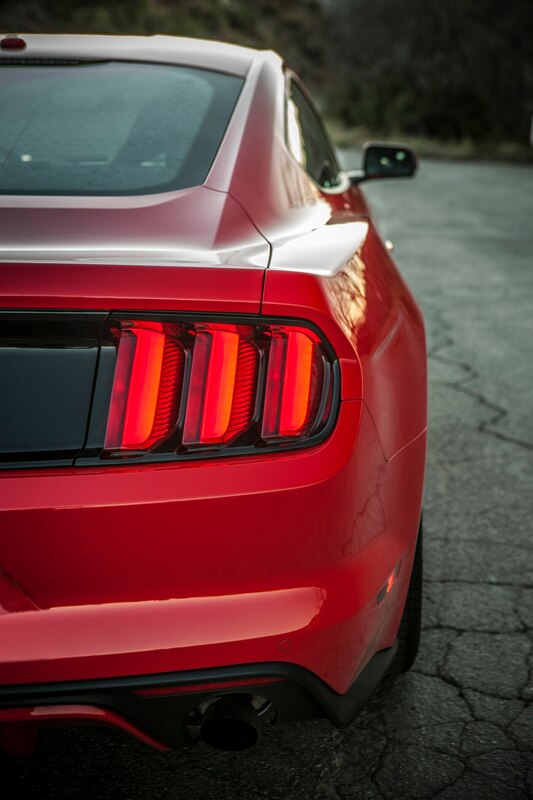 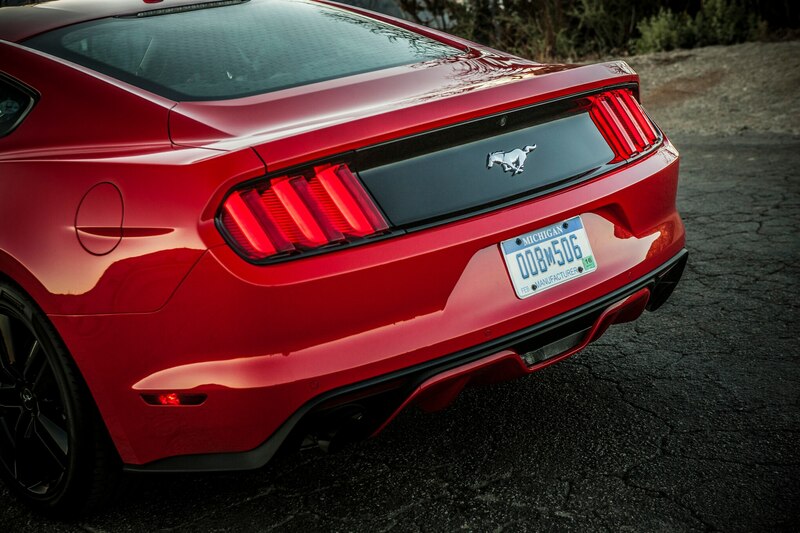 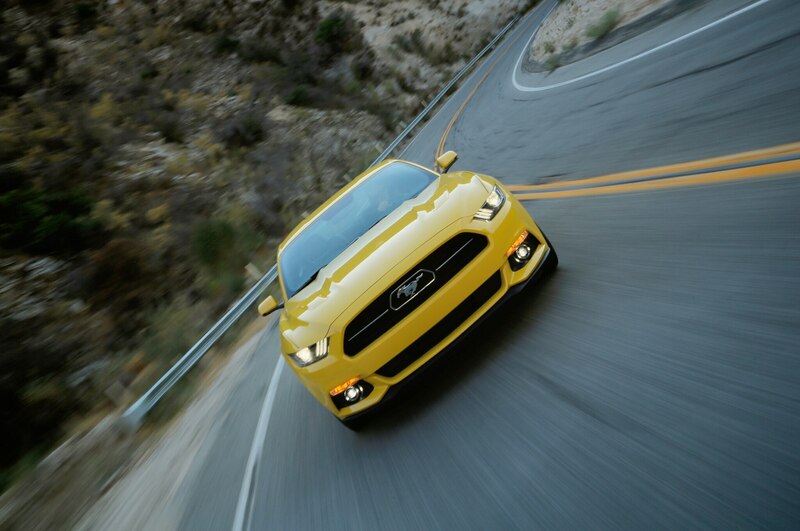 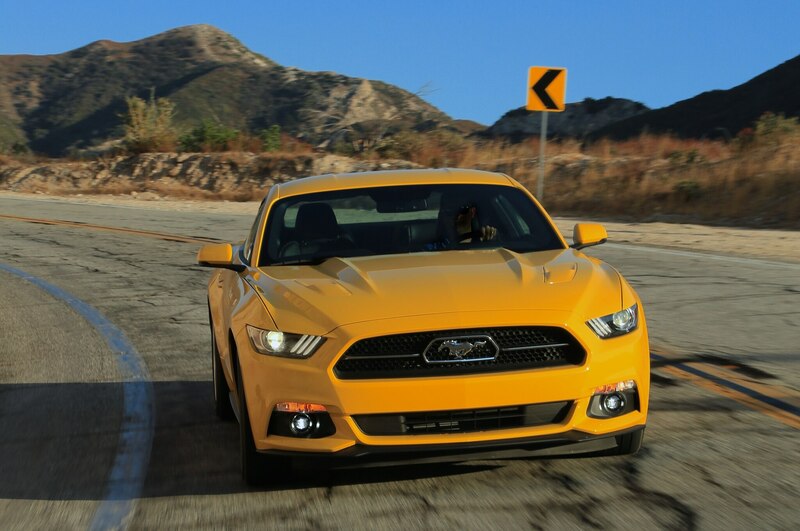 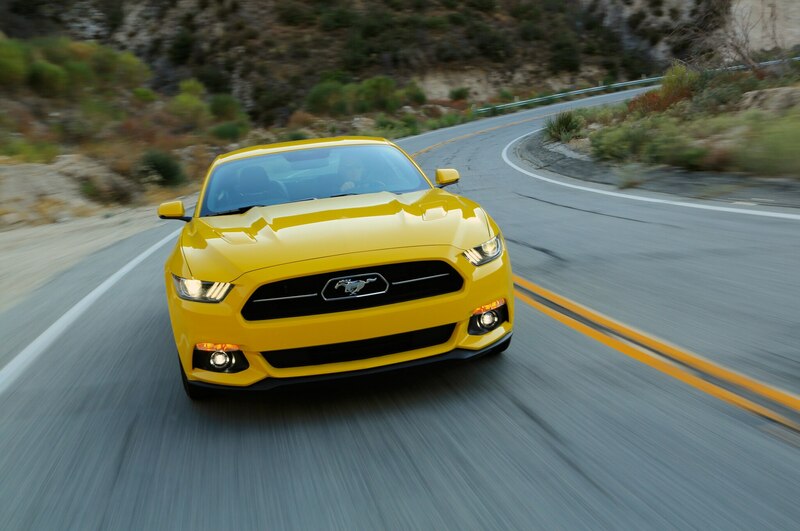 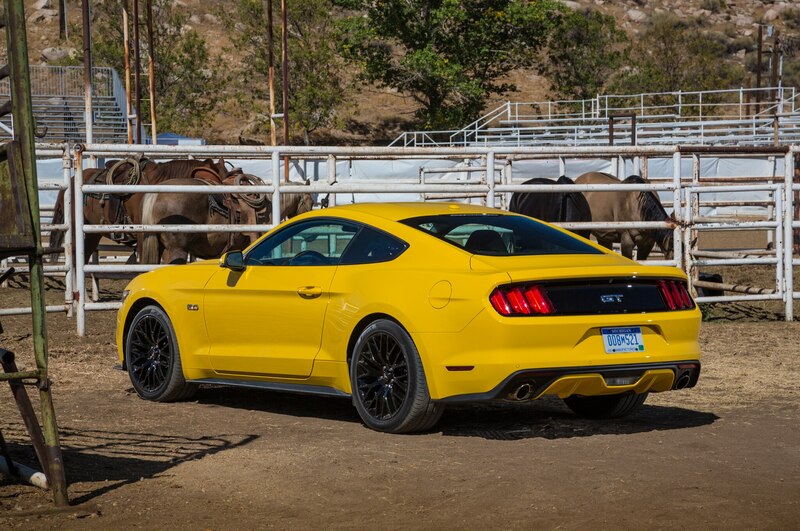 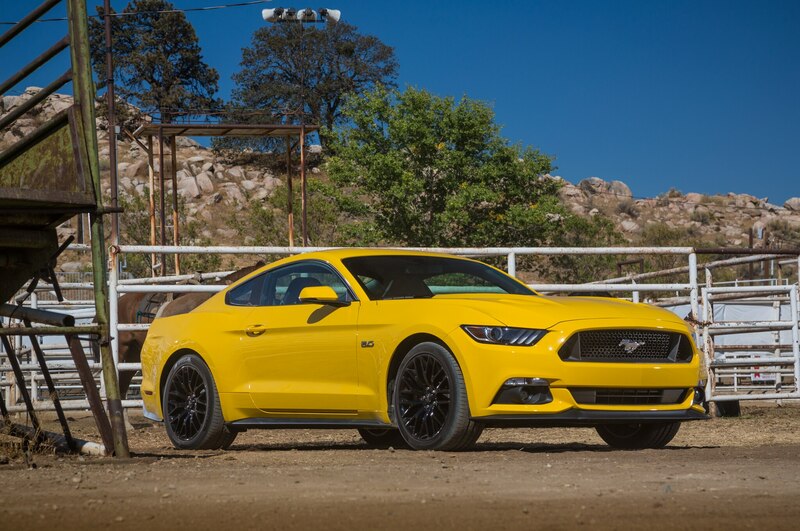 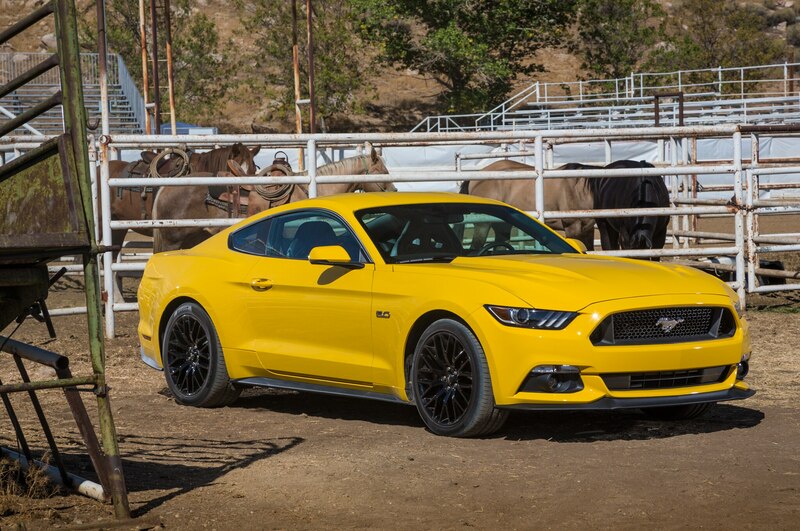 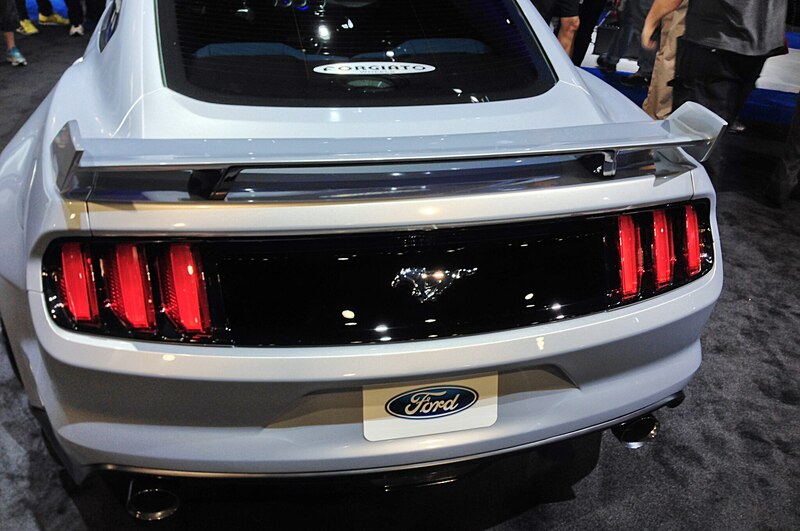 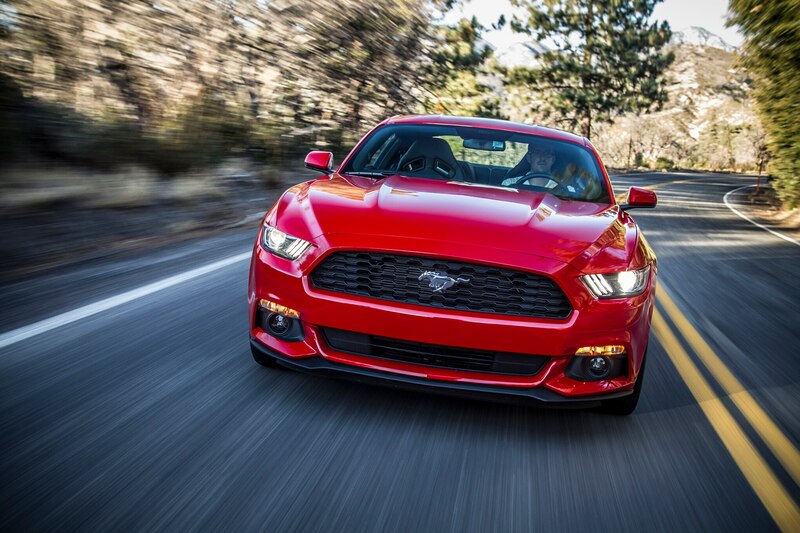 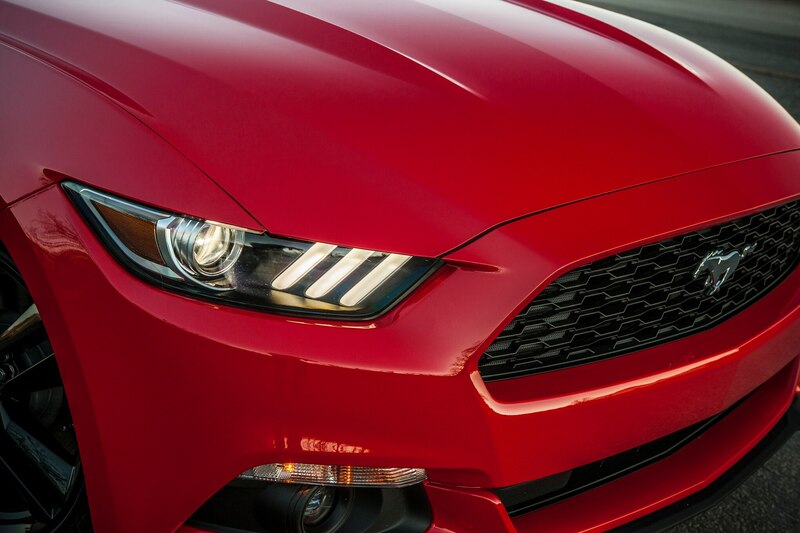 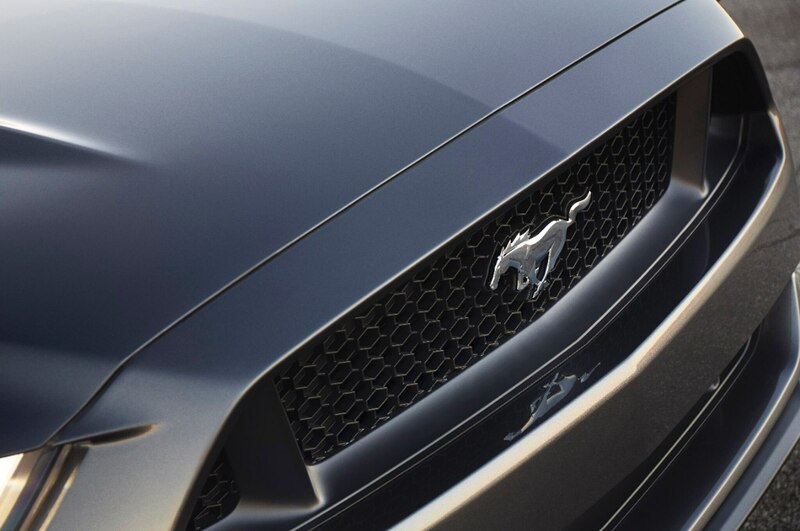 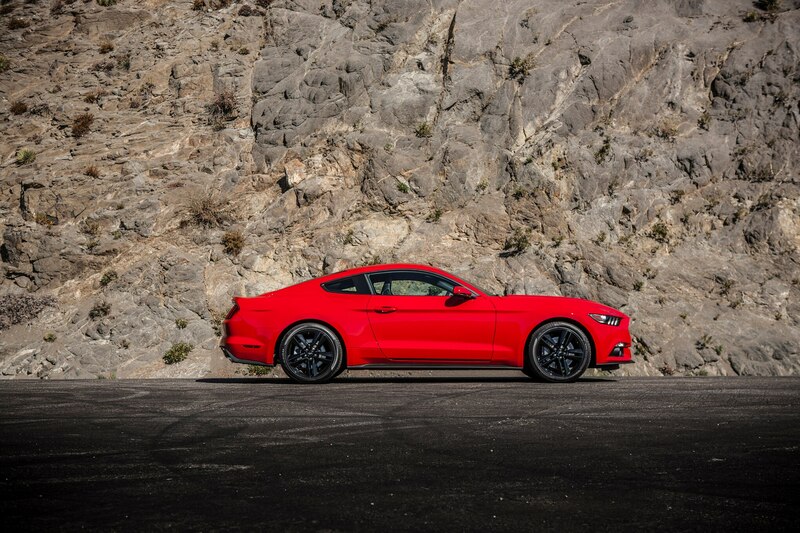 The 2015 Ford Mustang is a Mustang through and through. 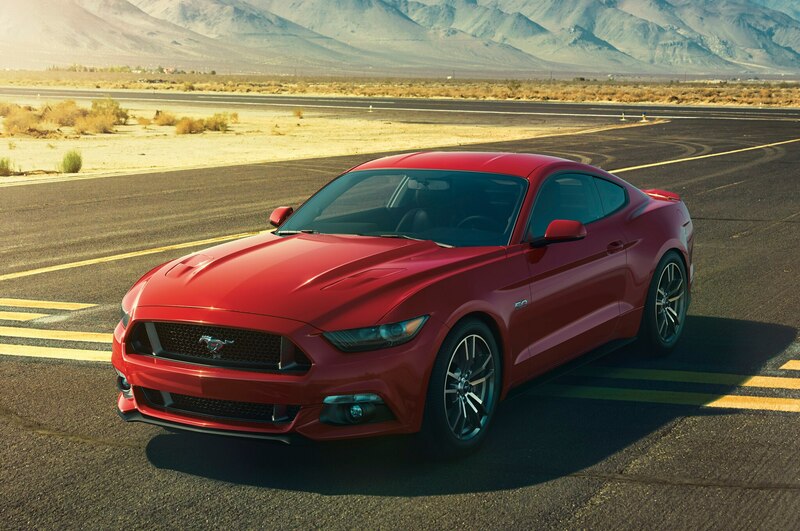 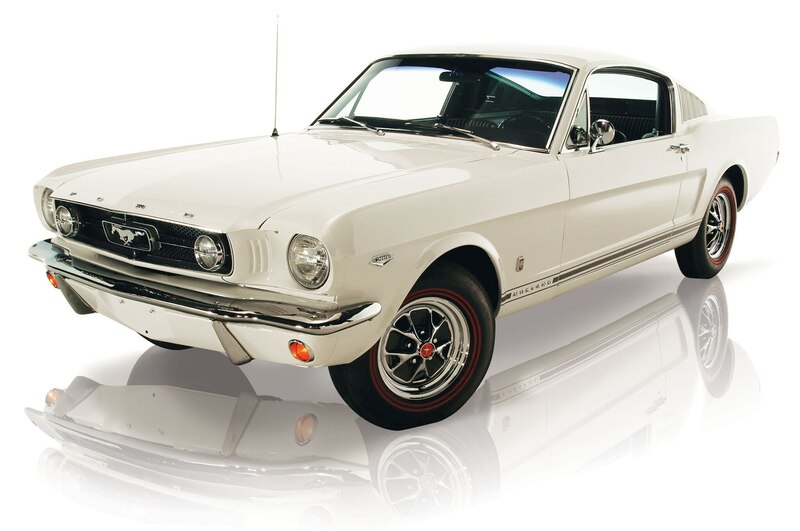 More than that, this is a purebred American car that’ll run down a road in the way that you’ve always hoped since the Mustang was introduced in April 1964, and it will make you a better driver in the bargain. 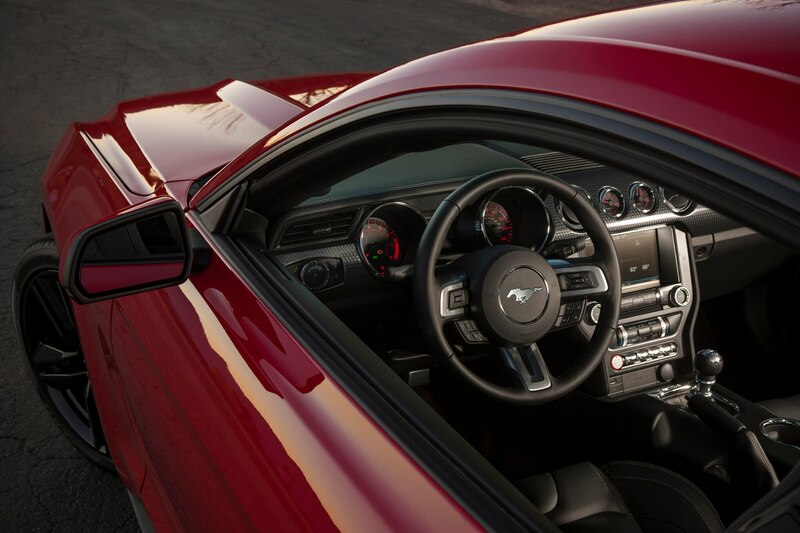 So no more excuses need be made for the Mustang. 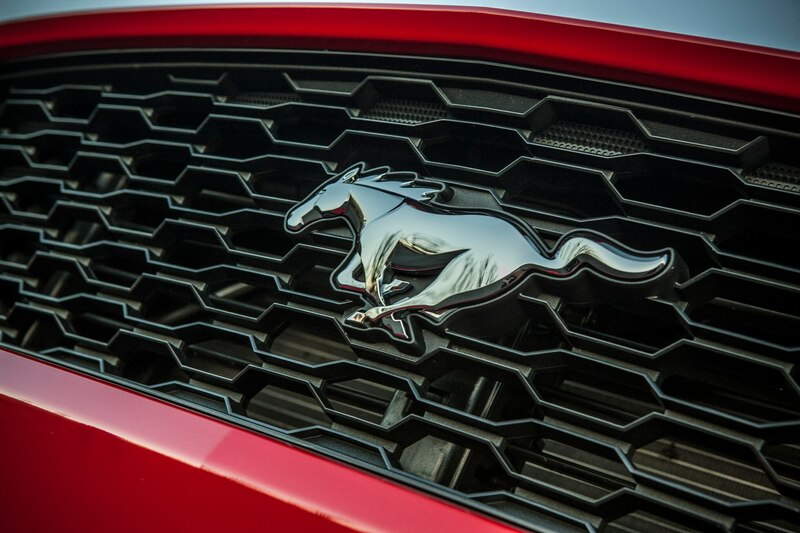 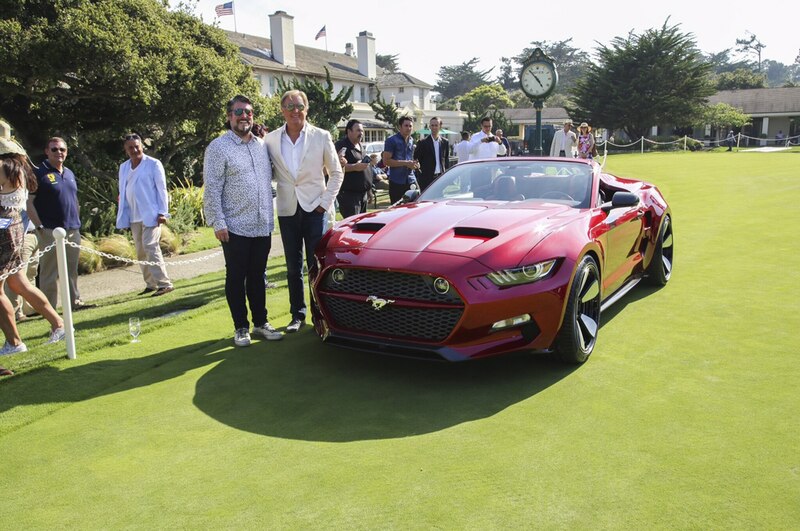 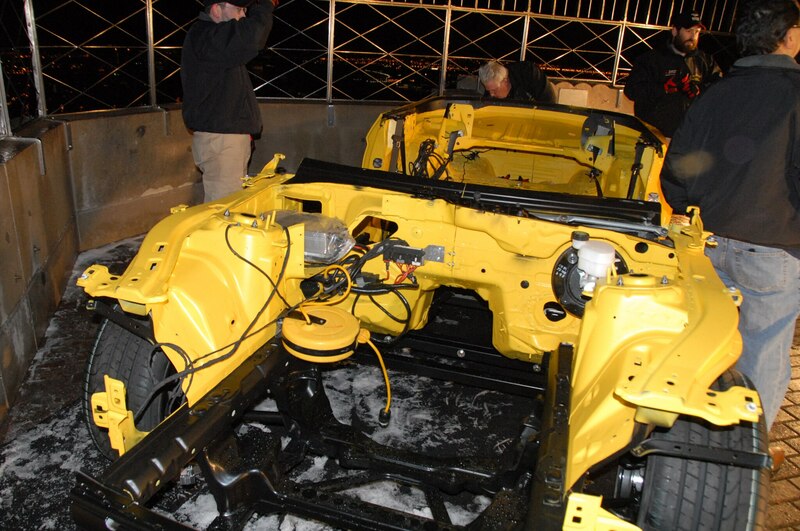 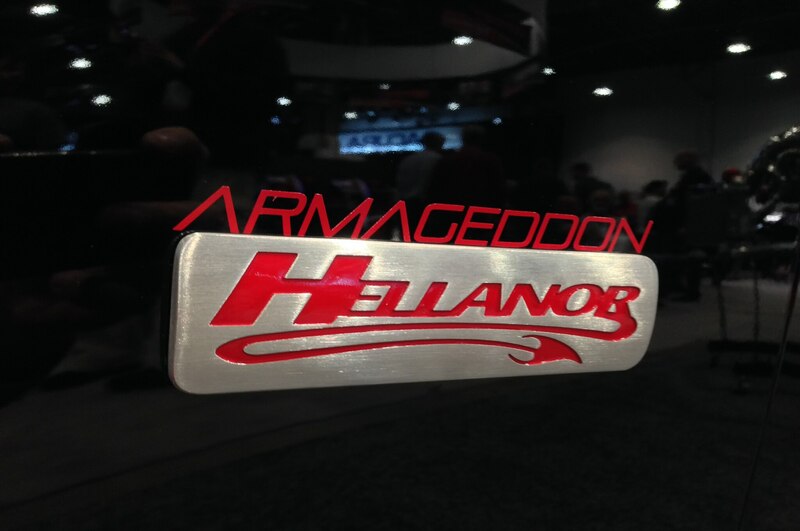 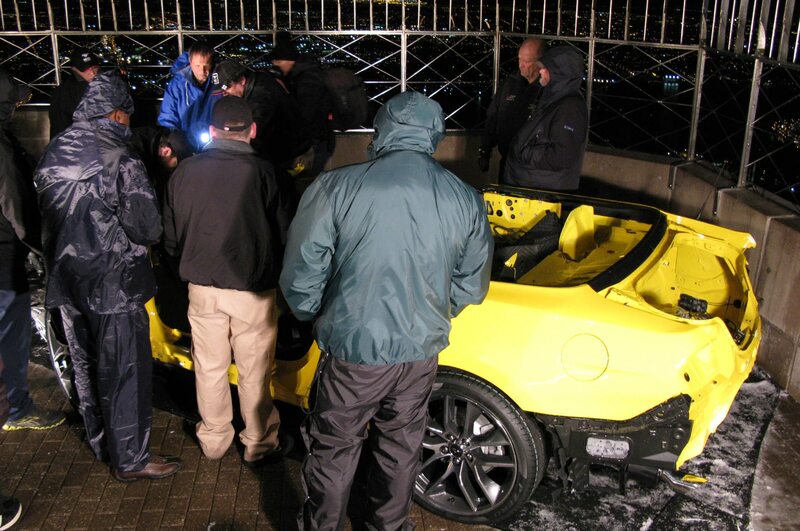 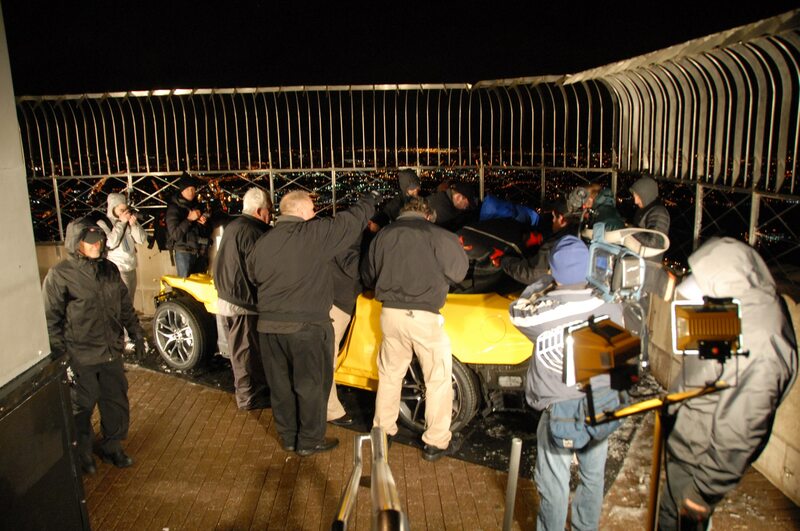 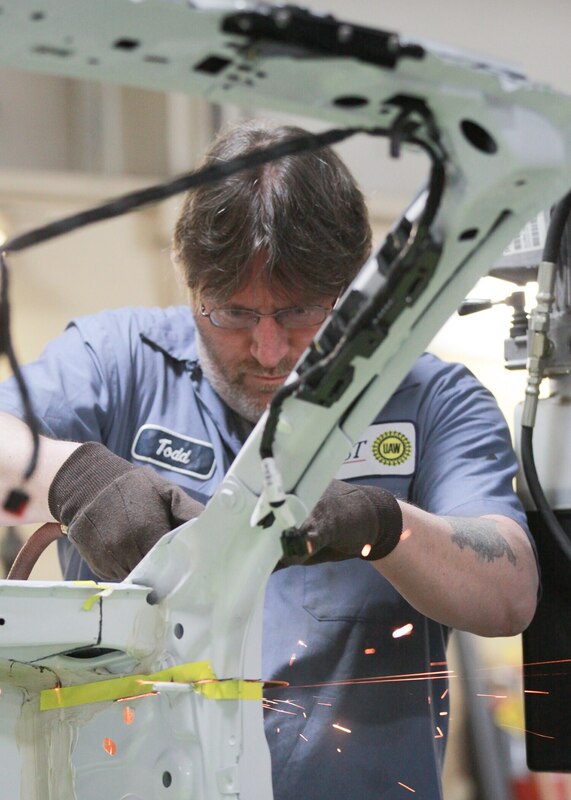 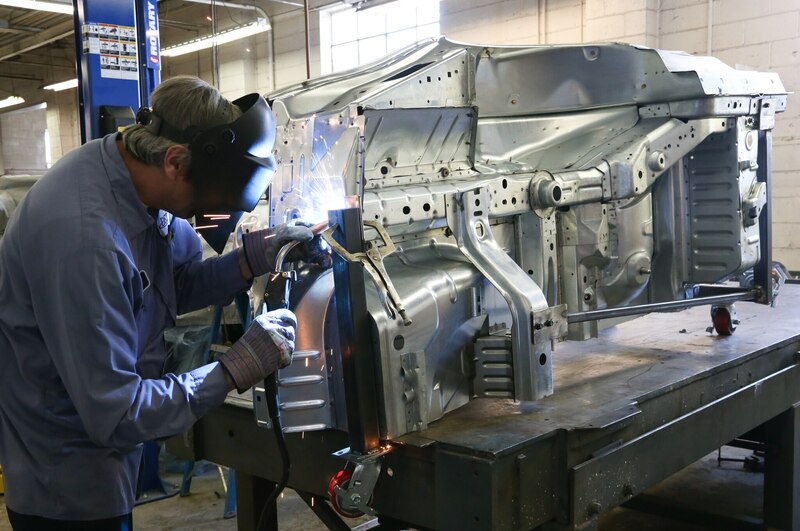 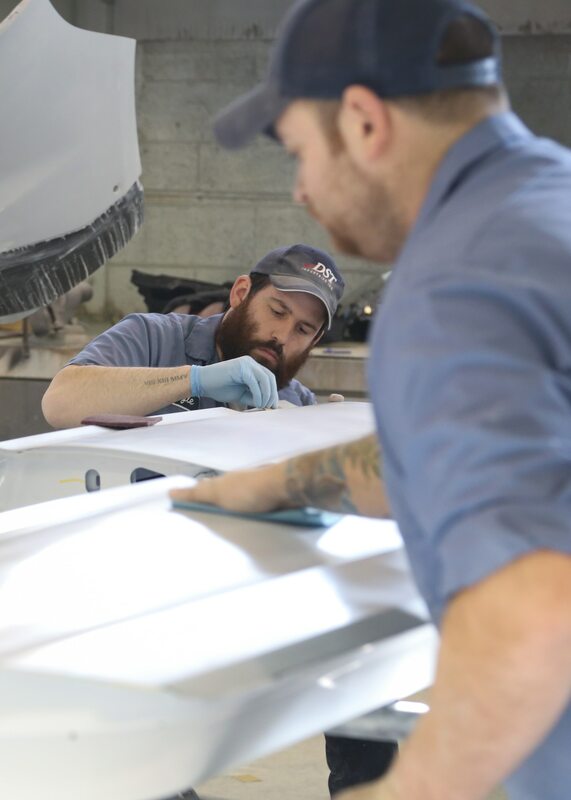 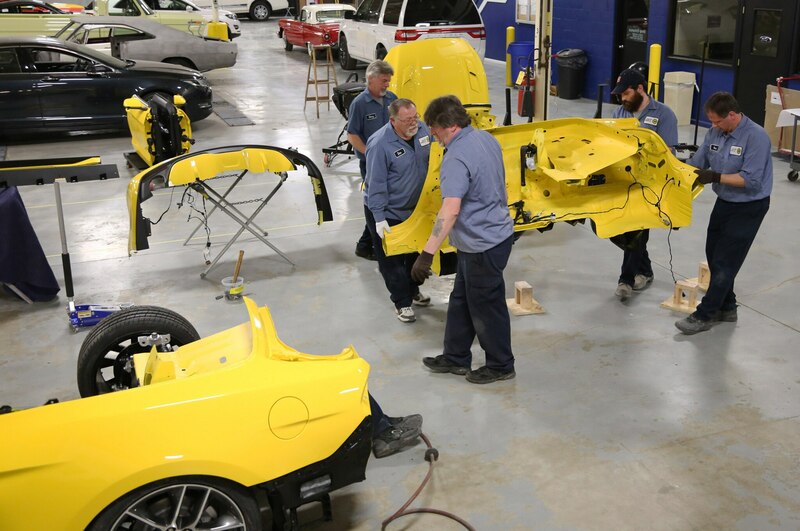 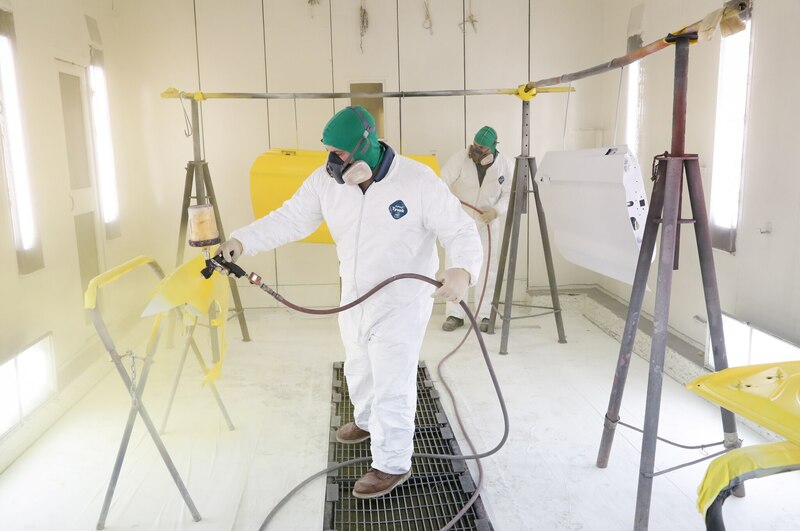 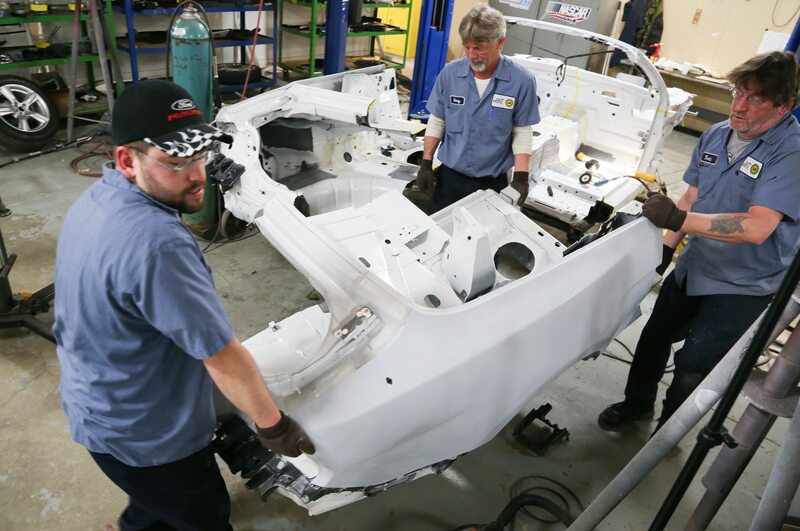 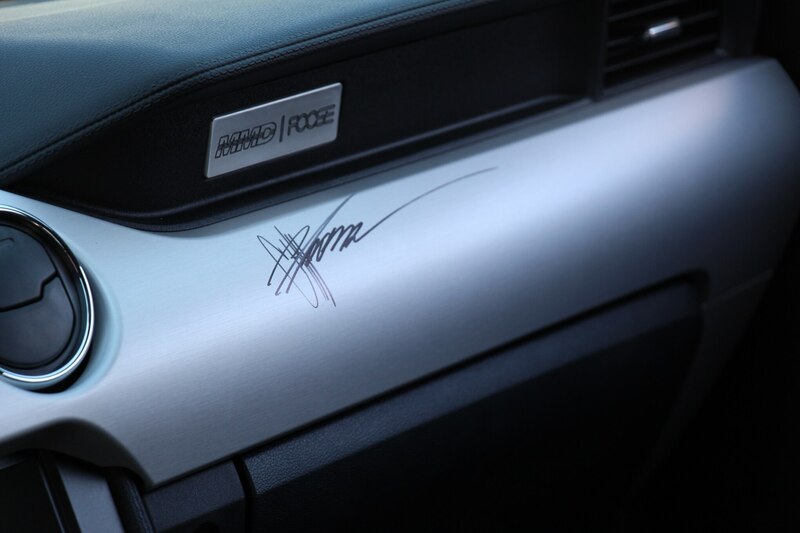 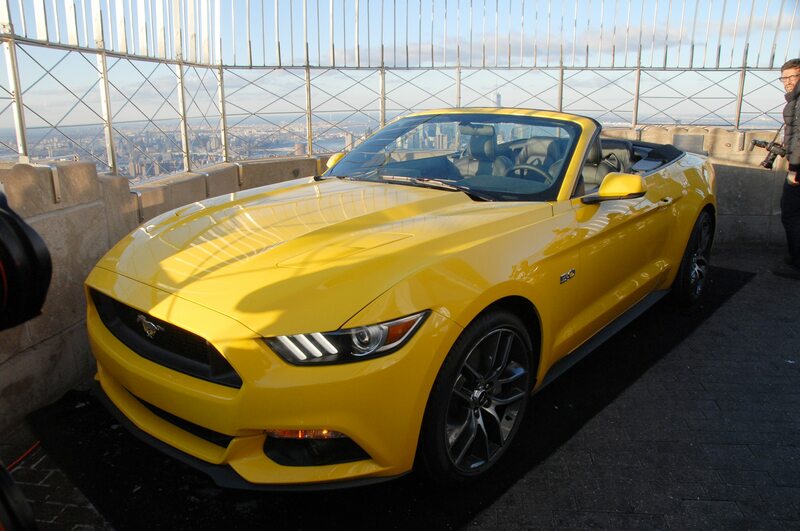 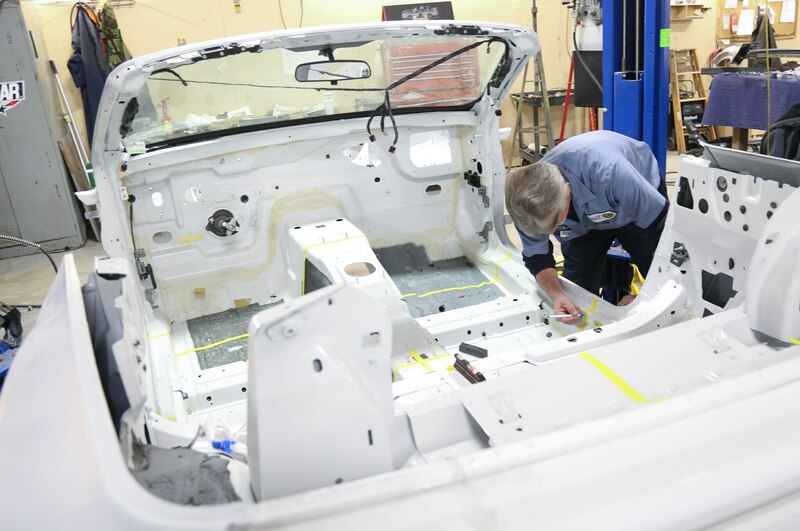 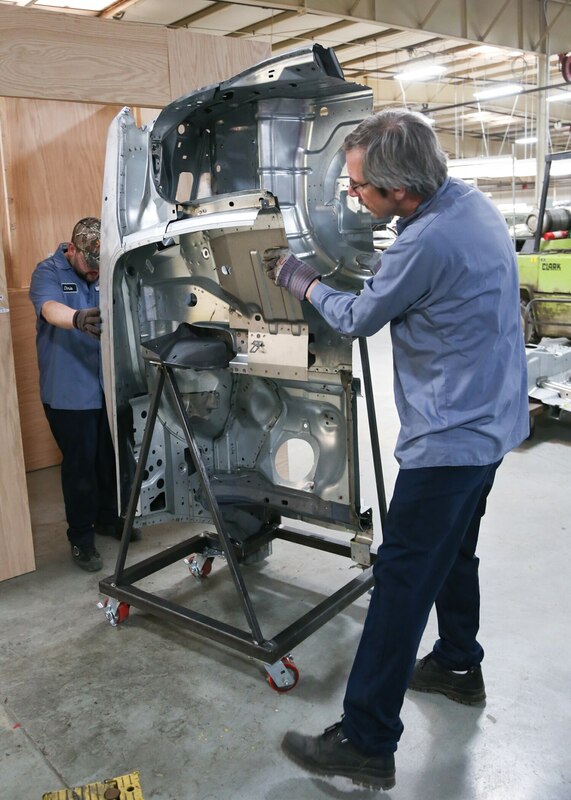 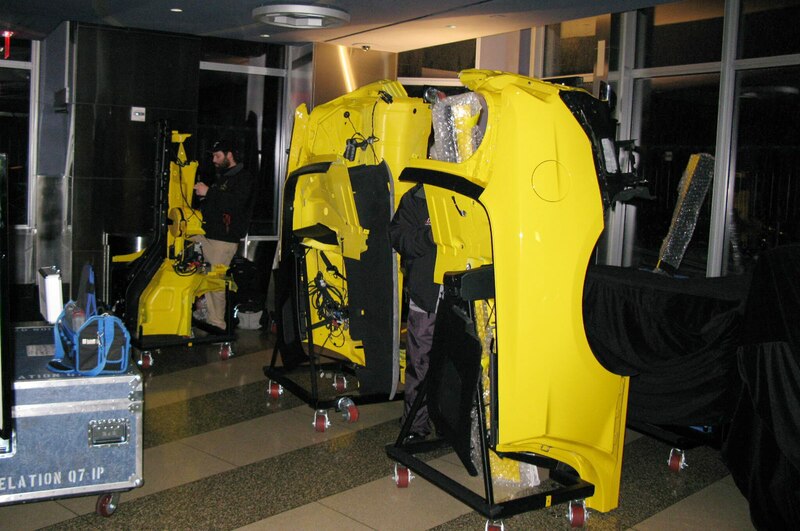 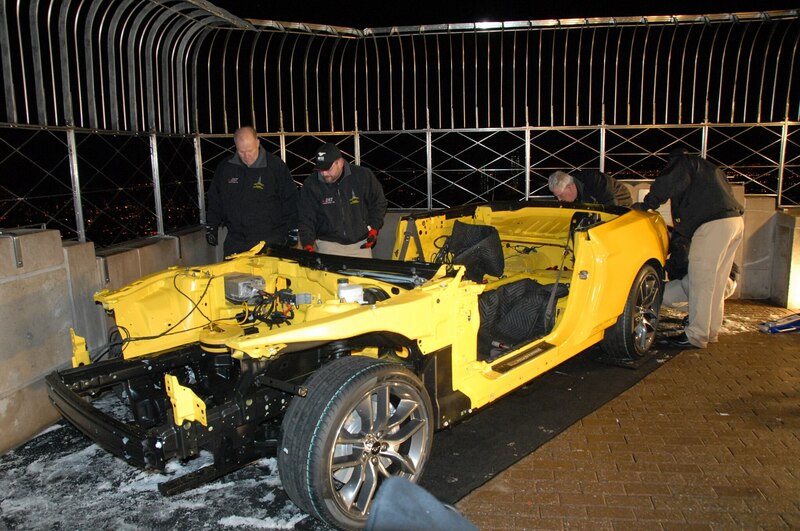 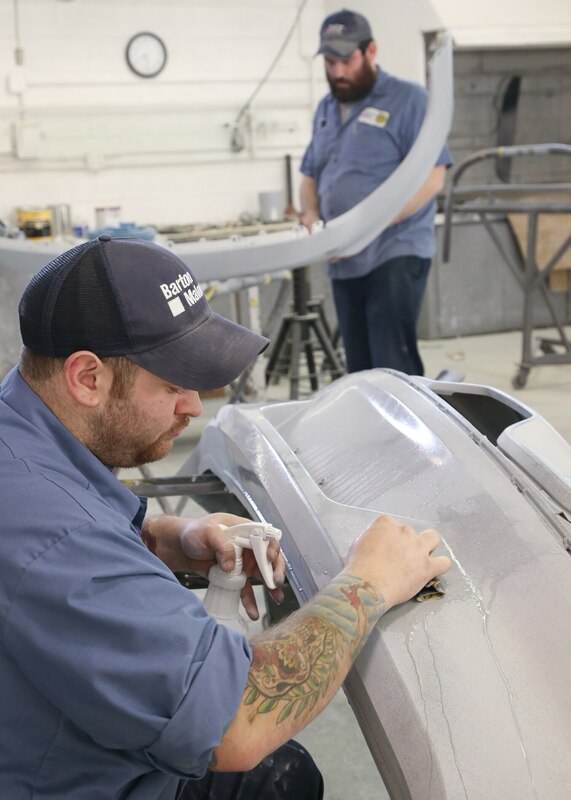 The 2015 car can now be a Mustang every day and in every weather – rain or shine, 20 miles or 2000 miles, Paris, Texas, or plain old Paris, France. 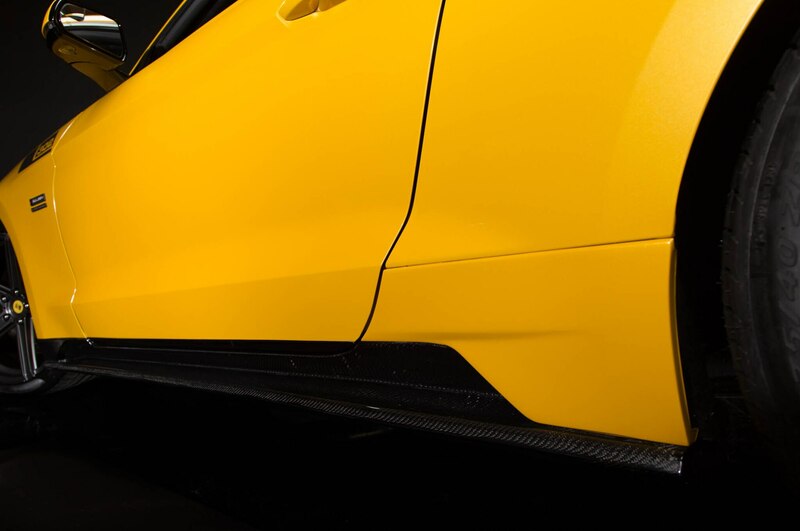 It’s not just a niche car for Ford but instead a flagship of smart engineering, cost-effective technology, and unapologetic ambition. 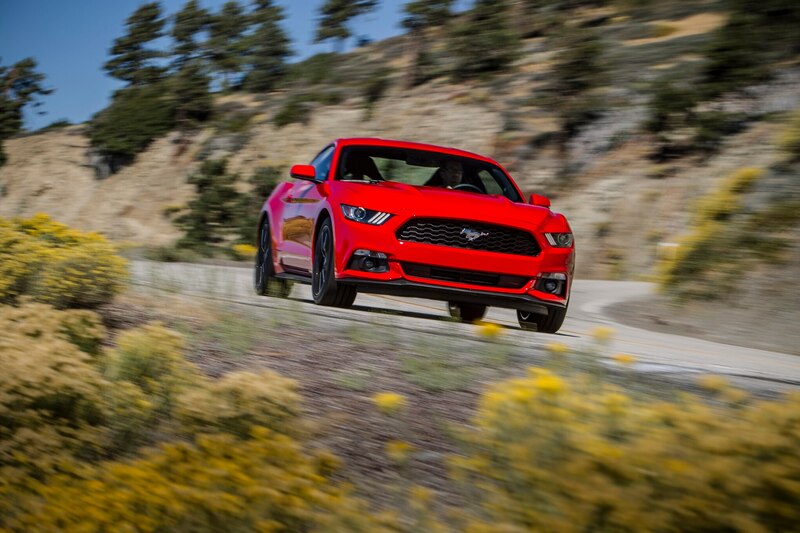 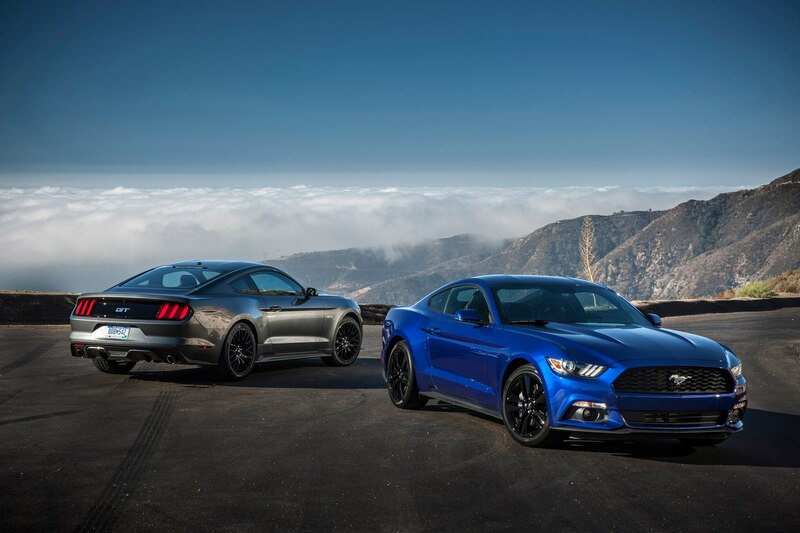 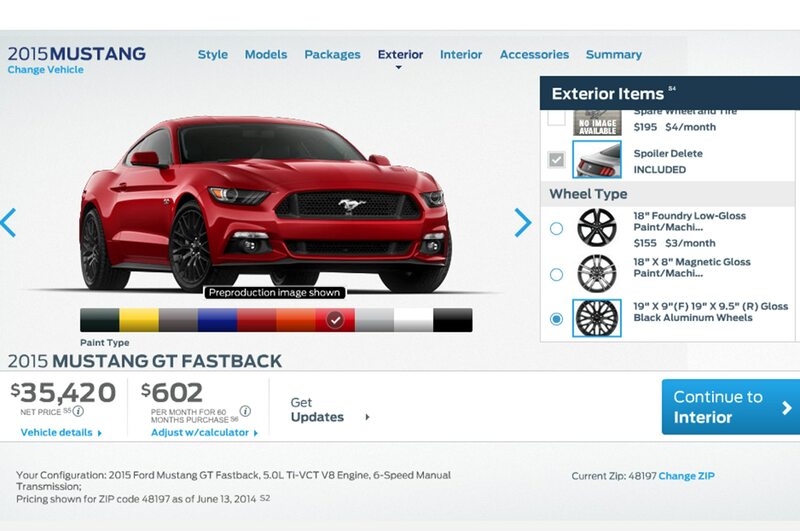 The 2015 Ford Mustang has moved beyond being just fun. 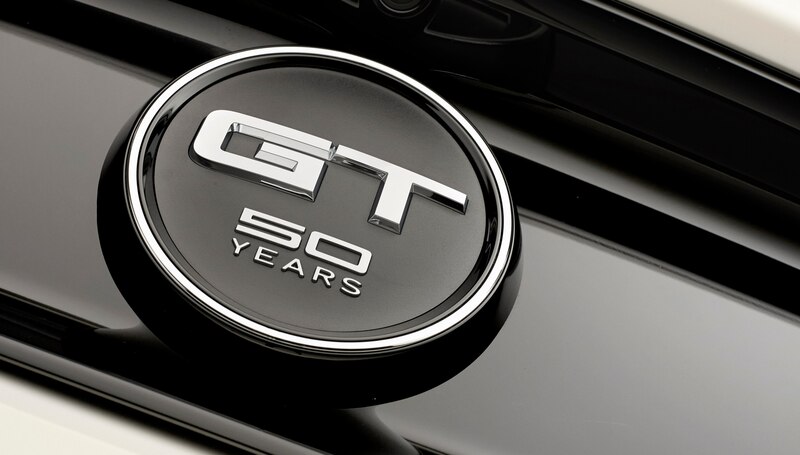 Now it wants to be great.